There were no butterflies seen on Mill Hill Cutting (SW). Two large Slow Worms were coiled up under a discarded piece of plastic litter. 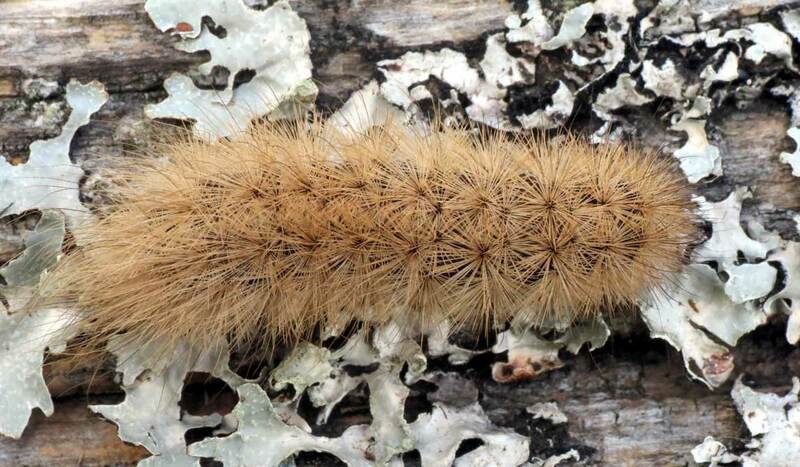 The smaller golden coloured (a juvenile) of the two was accurately estimated at 18 cm long. 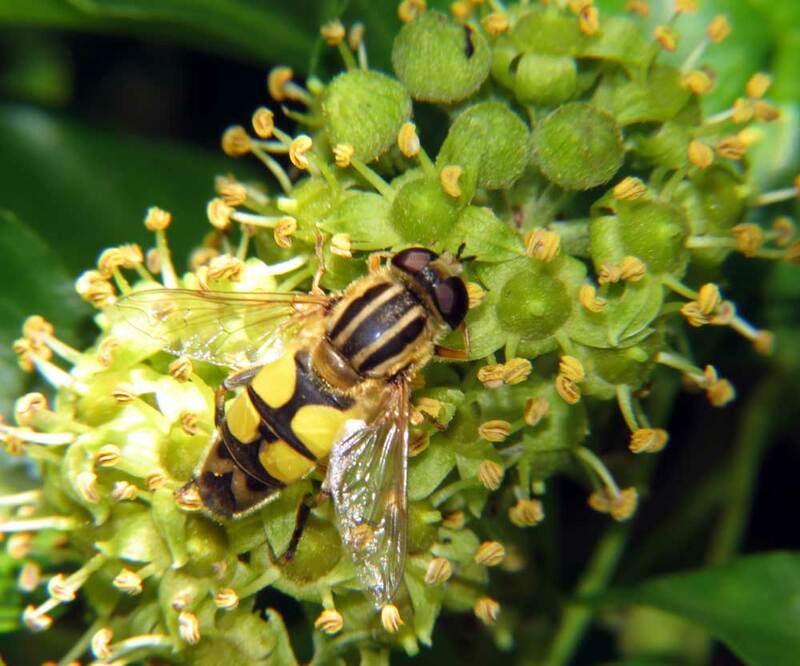 The Ivy flowers were attractive to common species of hoverflies, wasps and an Ivy Bee, Colletes hederae. 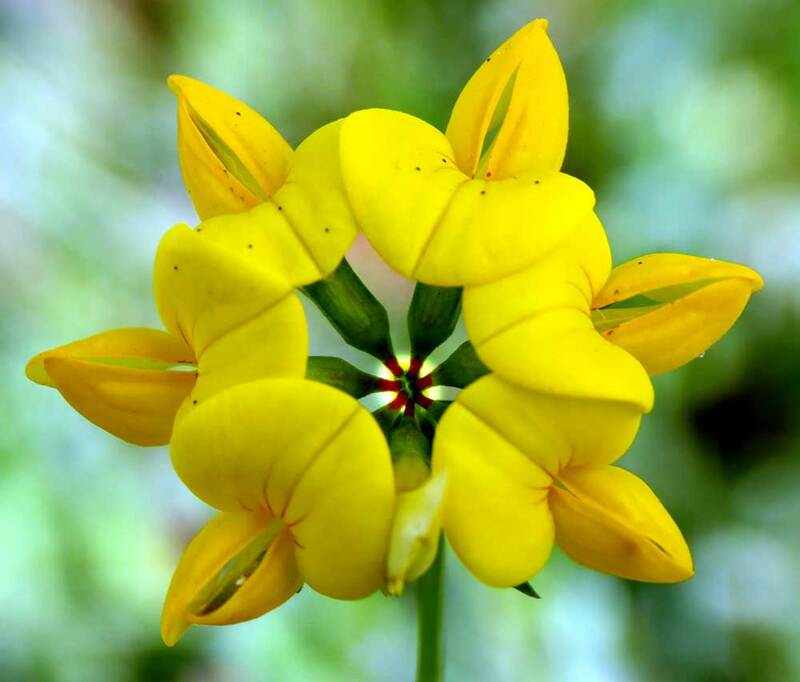 Two spikes of Yellow Wort had their flowers open under the cloudy sky. The Hawthorn berries were red and the Holly berries were orange adjoining the Pixie Path. It felt cool in the late afternoon when five Chalkhill Blues disturbed on Buckingham Cutting (south) under a cloudy sky. 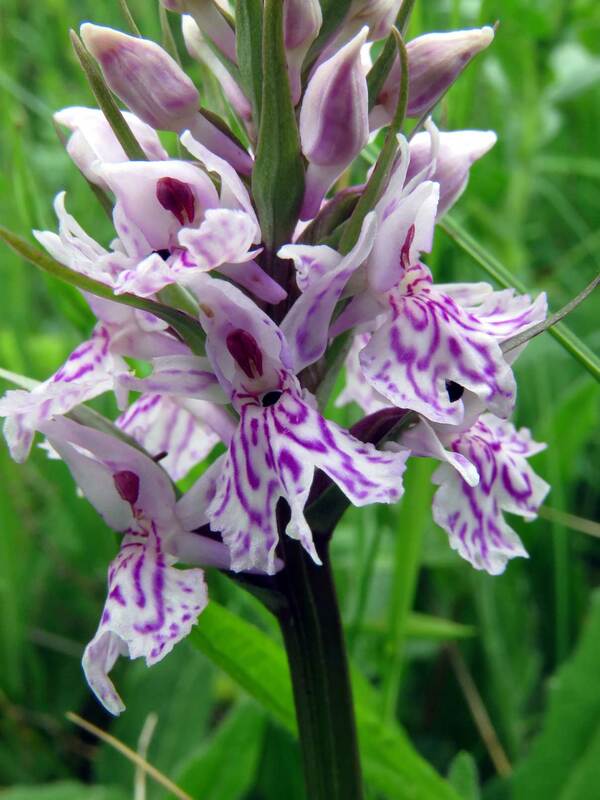 The sunshine made it difficult to photograph over a hundred Common Spotted Orchids and about eight Southern Marsh Orchids on the southern bank of Mill Hill Cutting. 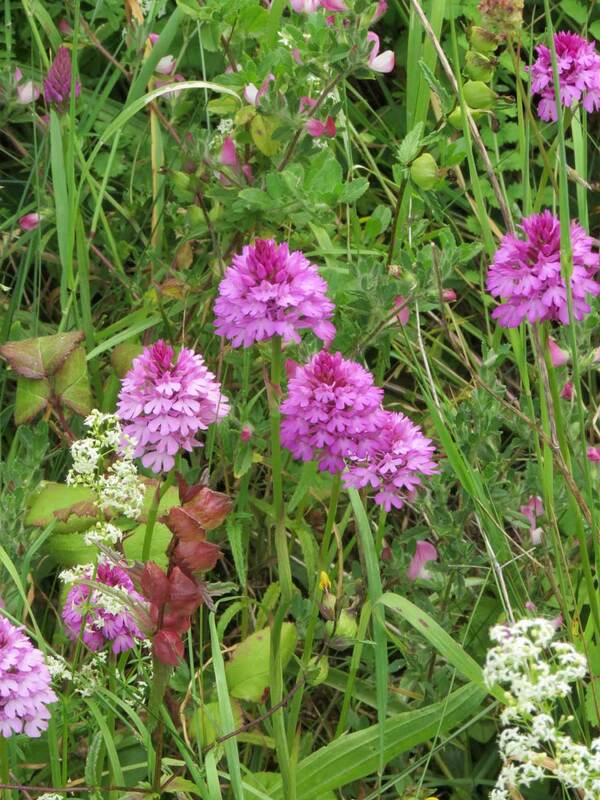 The Pyramidal Orchids were just emerging on the north edge of Frampton's Field. It was a pleasant autumn day with the sun casting strong shadows in the late afterrnoon. 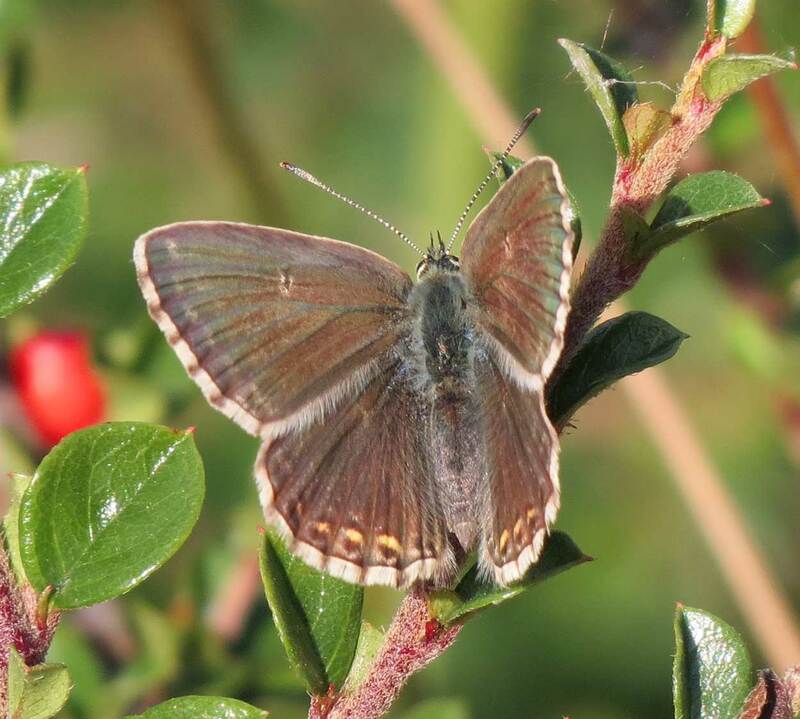 A Speckled Wood and two Holly Blues were seen at Buckingham Cutting (south). Nothing special about these half expected finds, but the surprising thing was one of the Holly Blues was extremely tiny and no bigger than a Small Blue high up in the hedgerow. White butterflies were frequently in town and outskirts seen with one Small White but the others unidentified as they were restless and seen at too great a distance to discern their features. On the Pixie Path by Frampton's Field, Old Shoreham, I spotted eight fair condition Meadow Browns and two more Holly Blues, with one smaller than usual. 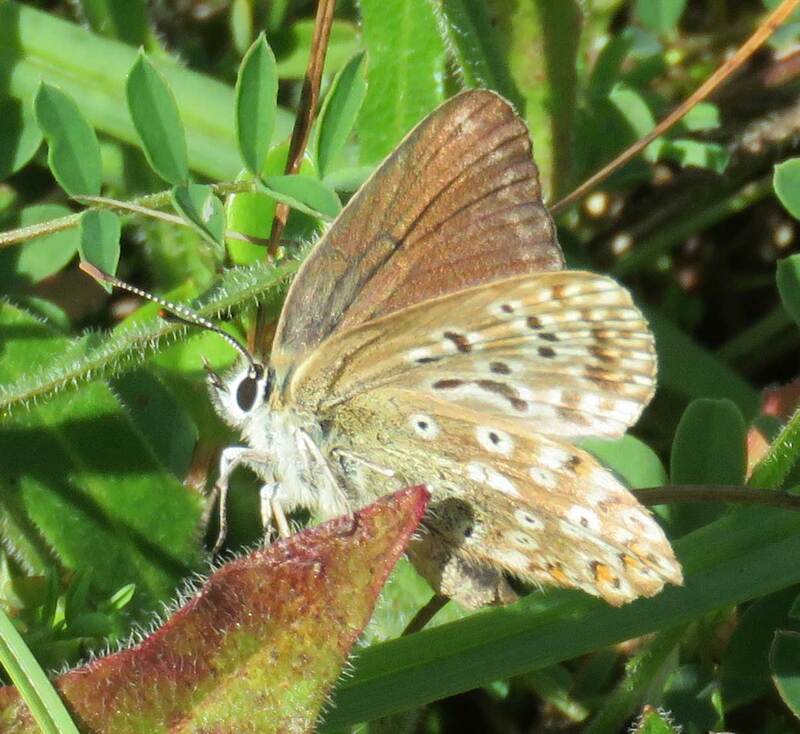 On Mill Hill Hill Cutting (SW) there were no butterflies to spot for a few minutes but after twenty or so minutes, I managed to discover five separate female Chalkhill Blues laying eggs amongst the Horseshoe Vetch. They were joined by three males, one instantly recognisable and the other two badly worn. 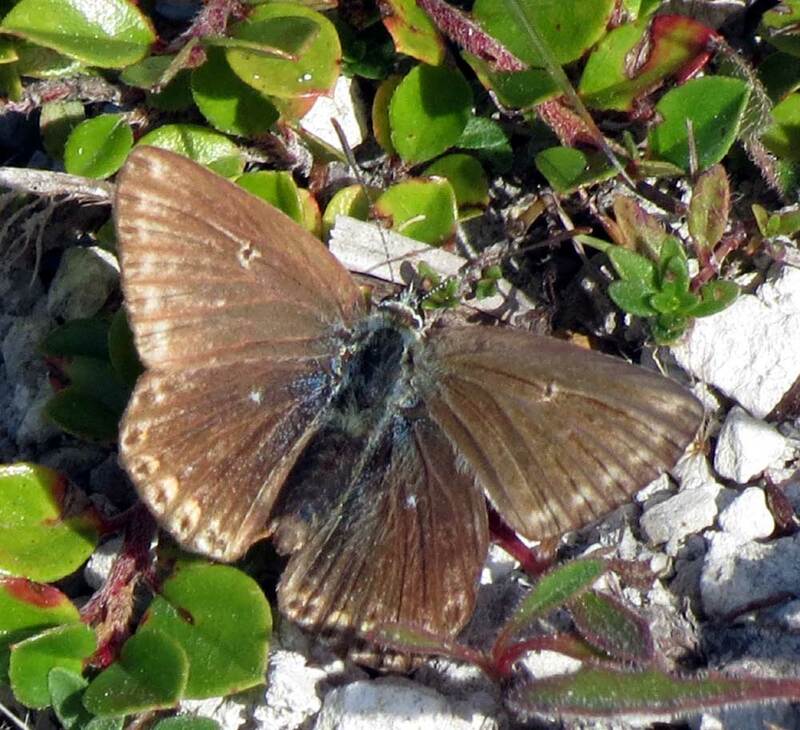 Quite often the female Chalkhill Blues landed on Cotoneaster. 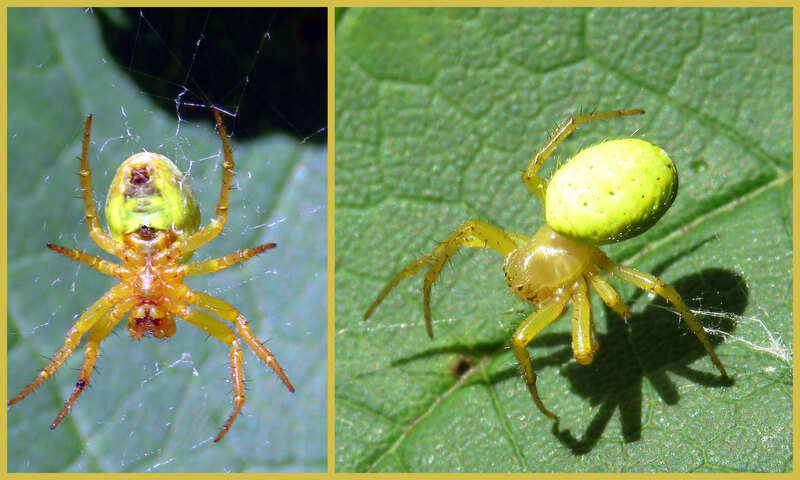 Cucumber Spider, Araniella cucurbitina, on the top of Chanctonbury Drive, north Shoreham. My first of the year Southern Hawker (dragonfly) was spotted at the top of Chanctonbury Drive, north Shoreham, together with a Holly Blue and Speckled Wood Butterflies. With a constant breeze (Force 6) under a cloudy sky, it was not a time to go outside the boundaries of Shoreham. So I didn't, I just made a quick cycle up Mill Hill Road to the outskirts of north Shoreham spotting a Large White Butterfly at the top of Chanctonbury Drive and a Holly Blue and a faded Wall Brown on the Pixie Path. 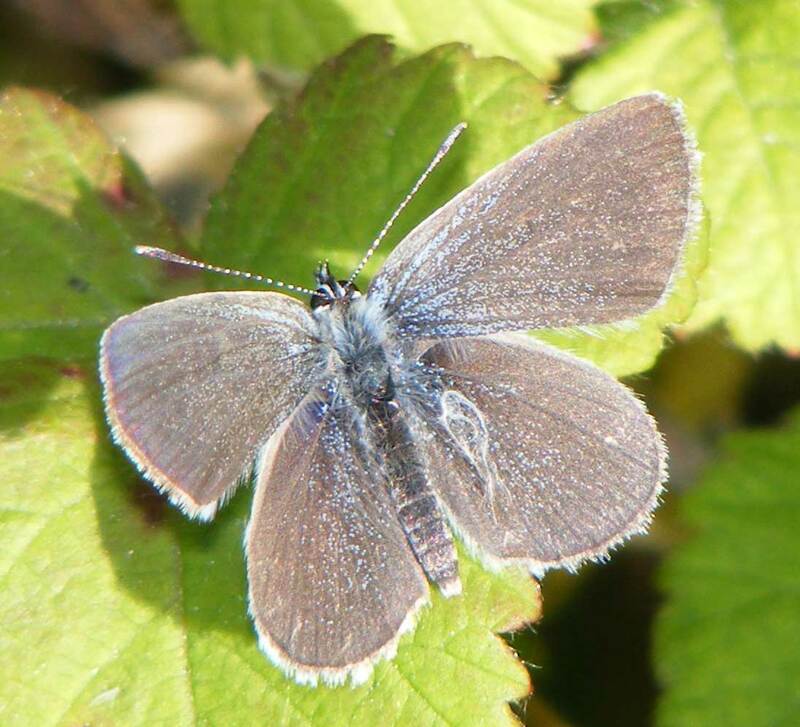 I climbed over the prostrate chestnut fencing to make my way to the Mill Hill Cutting (SW) where I spotted my first female Chalkhill Blue of the year amongst about a dozen males and a Silver Y Moth. 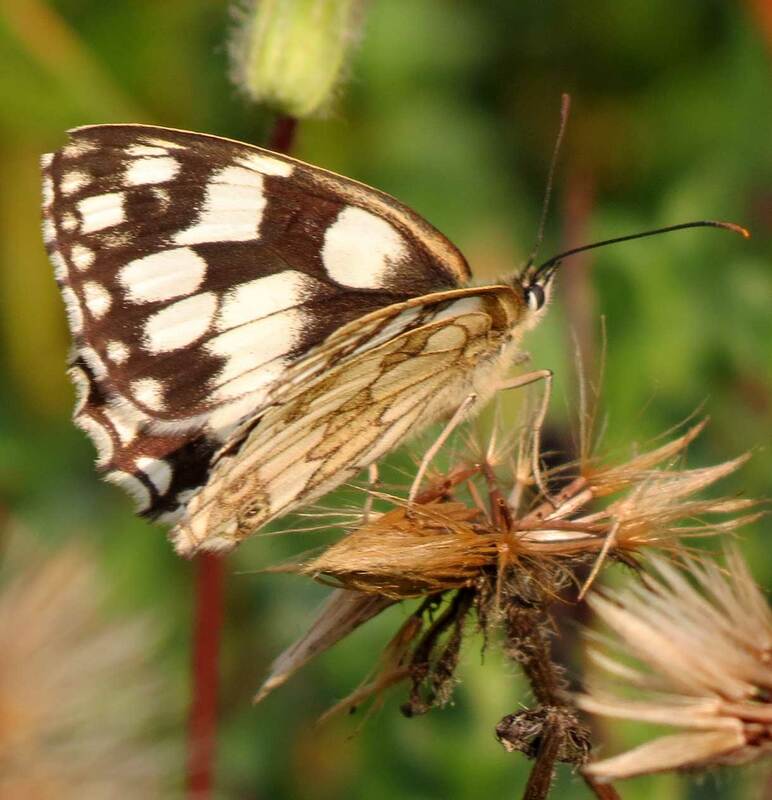 On the southern bank of Buckingham Cutting, frequent butterflies were all lively and unsettled, with half a dozen or more each of Ringlets, Marbled Whites and Meadow Browns in the afternoon. 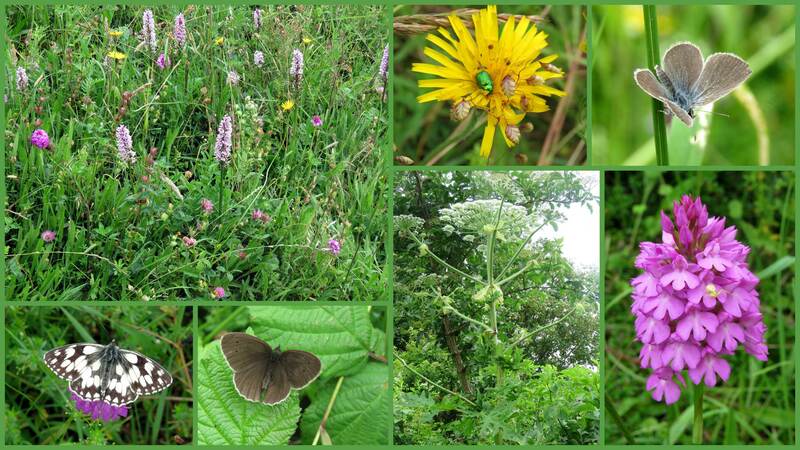 (There were no Small Blues, Speckled Woods or other butterflies seen on Buckingham Cutting.) 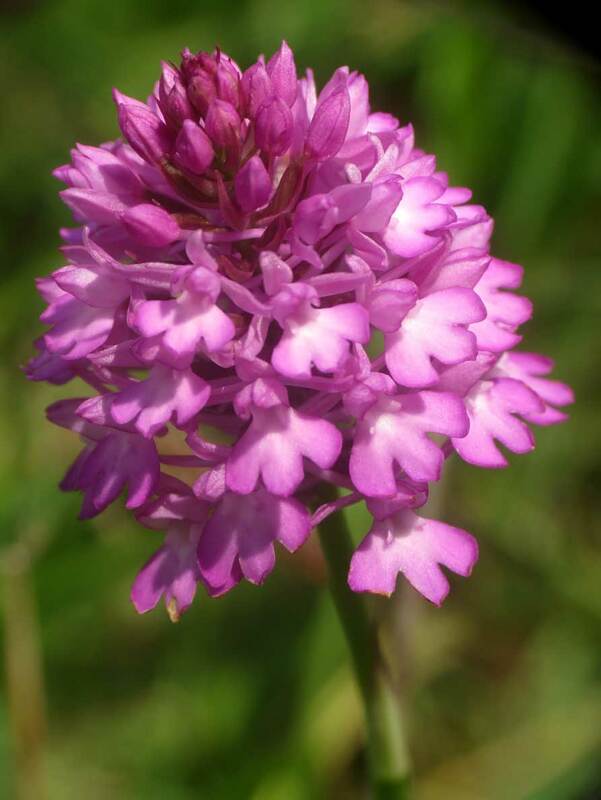 Pyramidal Orchids were in flower replacing the fading Spotted Orchids. Perforated St. John's Wort was beginning to flower. On another breezy afternoon, there was a Meadow Brown on the southern bank of Slonk Hill Cutting and a Burnet Companion Moth on Buckingham Cutting and that was all of special interest. 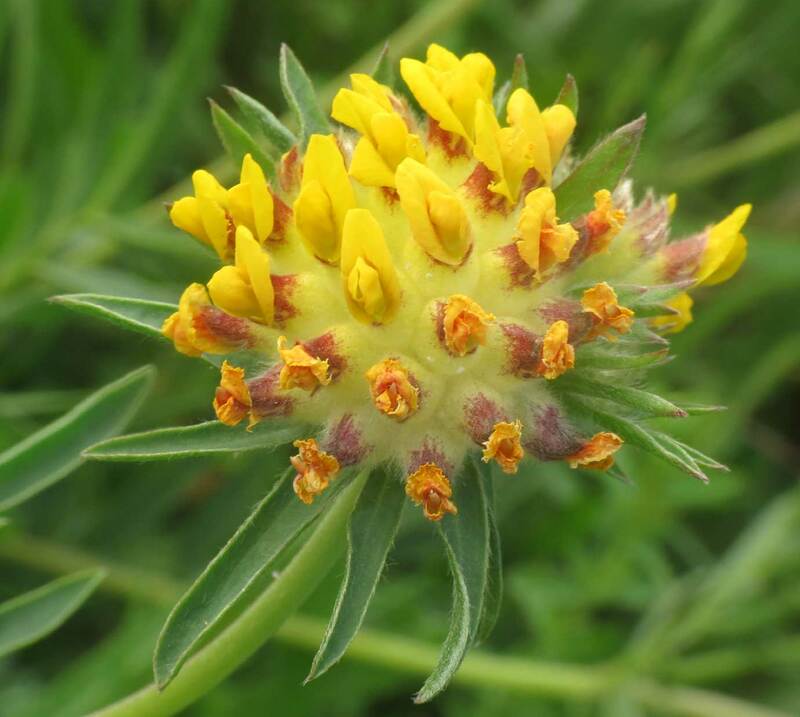 The first KIdney Vetch was seen with two flowers on Buckingham Cutting. Two Speckled Woods courted at the top of Buckingham Park in the shade of the trees. In a humid afternoon on the southern bank of Buckingham Cutting with tricky bright light I struggled to take any pictures. 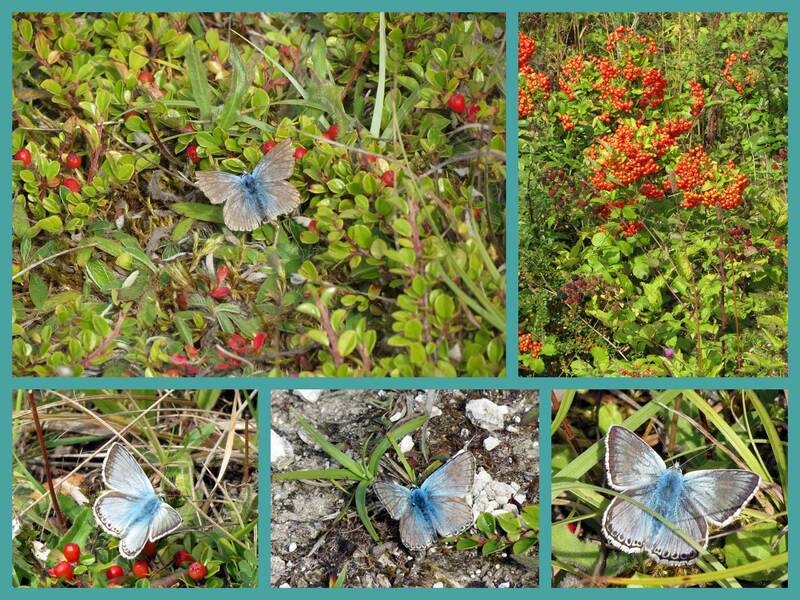 Holly Blues were fluttering around the Bramble and the was even one on the roadside meadow. 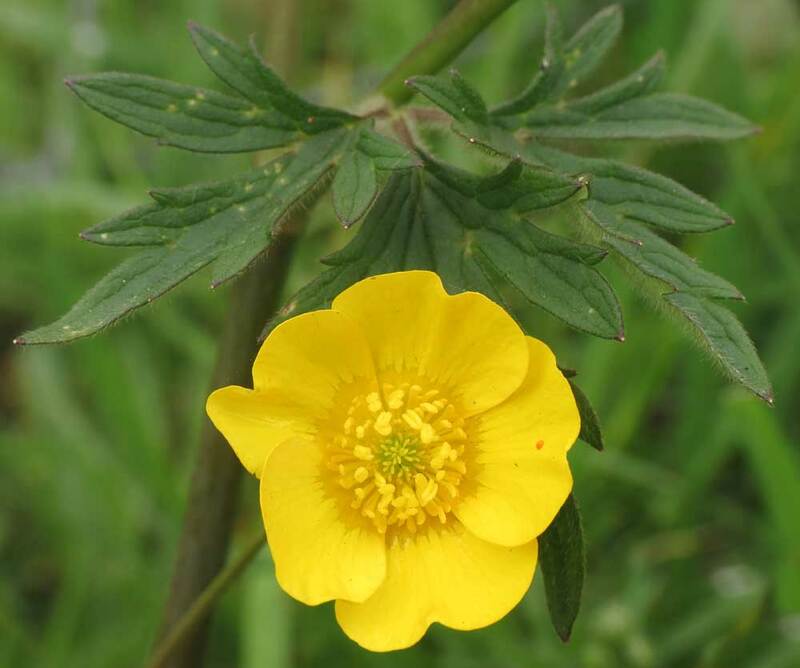 My first Small Blue Butterfly of the year would settle on my camera strap and enticed on to my finger, but it would not transfer to a Greater Bird's Foot Trefoil (in the absence of any Kidney Vetch). My first of the year Marbled White was lively and when it did settle on a Red Clover, it was immediately chased off by a Meadow Brown. My second Large White Butterfly of the year fluttered by. 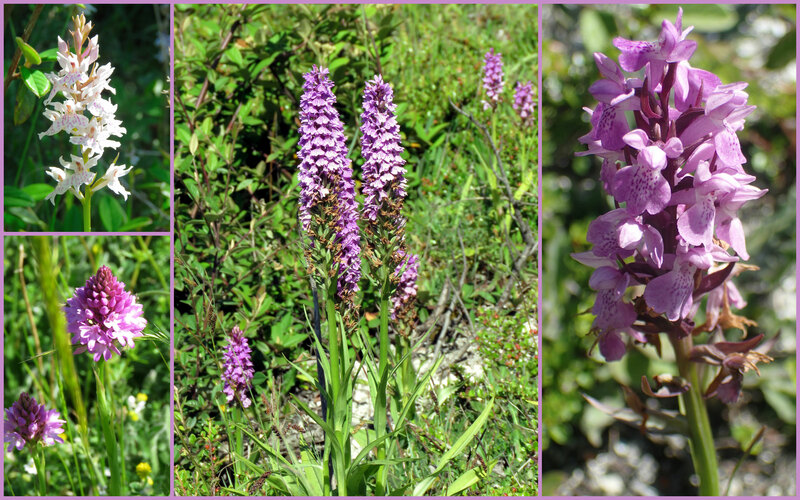 Spotted Orchids were common and beginning to turn brown and the occasional Pyramidal Orchid was budding or showing their first flowers. 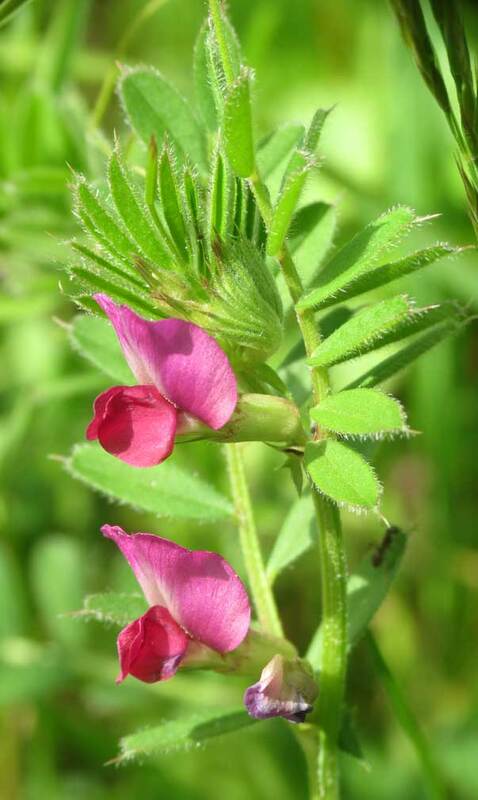 My first Restharrow and yellow Meadow Vetchling of the year were noted in the roadside meadow. At last the breeze was gentle (Force 3) on a sunny humid day. On the approaches to Mill Hill, I recorded a few Speckled Woods, a few Holly Blue Butterflies; and a Meadow Brown on Mill Hill Cutting (SW). At the top of Chanctonbury Drive I spotted what was probably my first Large White Butterfly of the year. 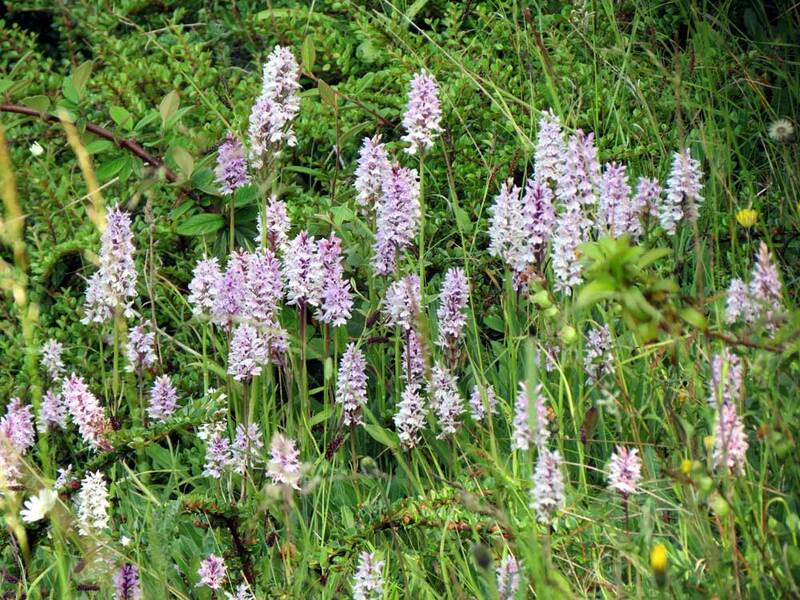 On the southern side of Mill Hill Cutting there were over a hundred Common Spotted Orchids with a handful of both Southern Marsh Orchids and Pyramidal Orchids. 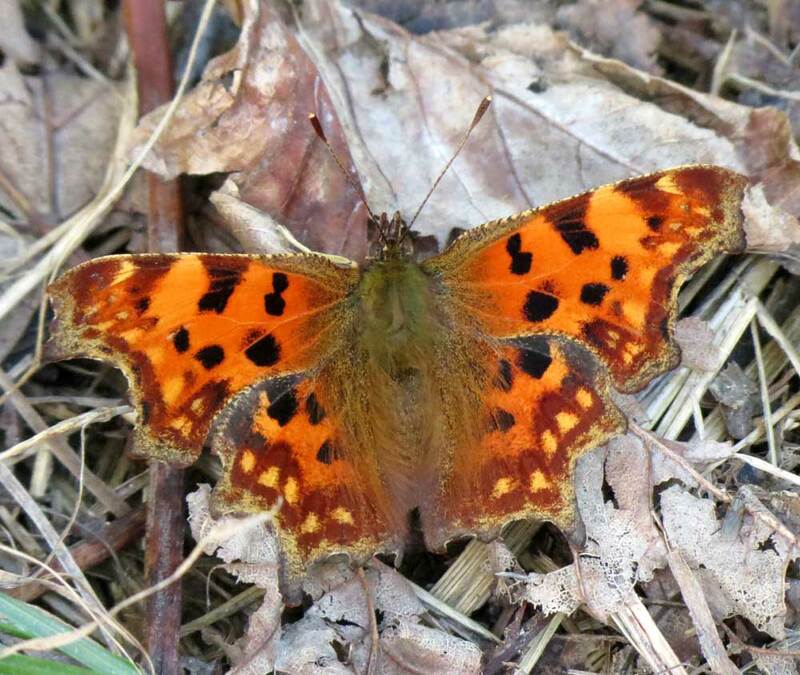 In the weak but welcome first sunshine of the year a Red Admiral pipped a Comma as my first butterfly of the year by about five seconds. 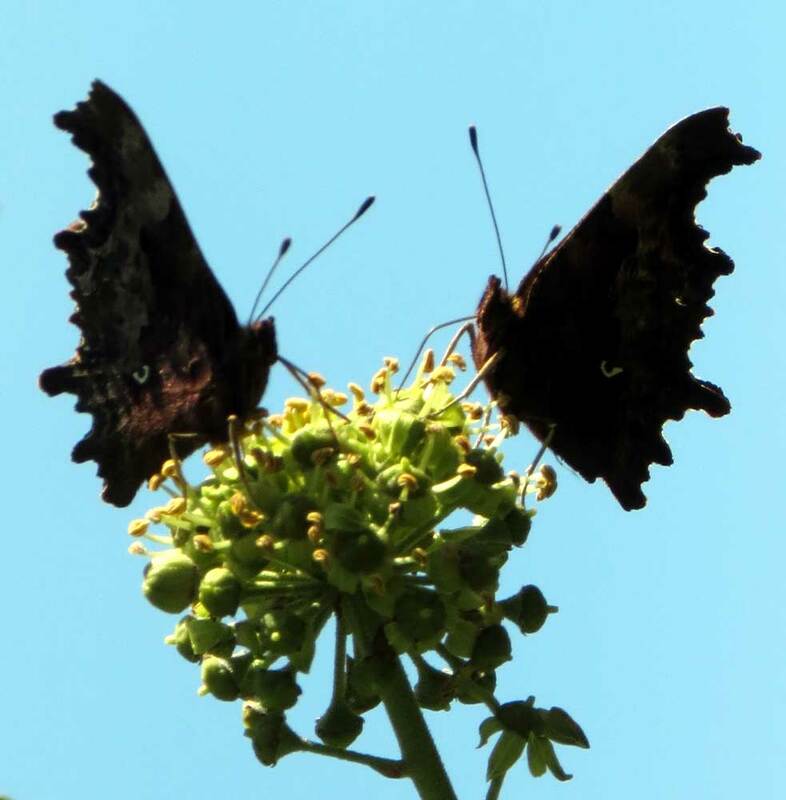 Both butterflies made their appearance at the top of Chanctonbury Drive (Dovecote Estate) amongst the undergrowth beneath the trees (SE of the bridge ot Mill Hill). This semi-wild area hosted floweringSweet Violets which were visited by my first Honey Bee and my first of the small hoverflies of 2017. The sun came out and the air temperature measured 14° C at its highest at 4:00 pm. A dead Mole was discovered under the copse between the top of the Drive and Buckingham Cutting (south). Buckingham Cutting (south) was covered in Hawkbit leaves. Hairy and not red underneath, I thought the flowers were Rough Hawkbit despite being late in the season. 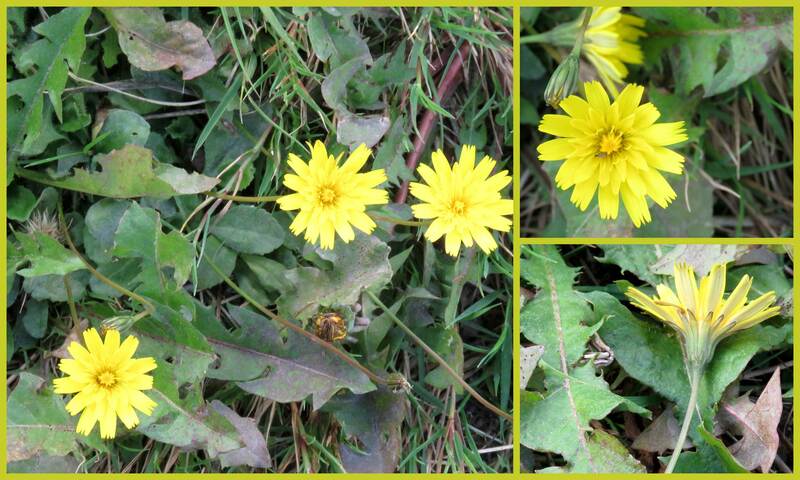 To make identification even more tricky the grass verge at the top of The Drive also included Lesser Hawkbit. 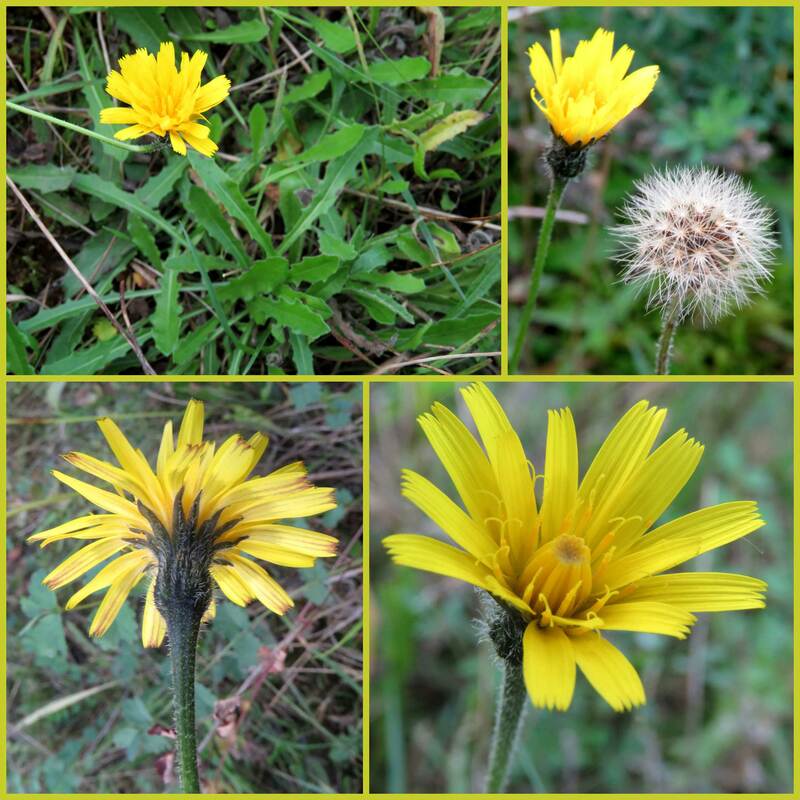 There did not seem to be any Autumnal Hawkbit. Sunshine shined weakly in the afternoon. Six Red Admirals led the way with five probable (seen at a distance only) Small Whites on the outskirts of town. 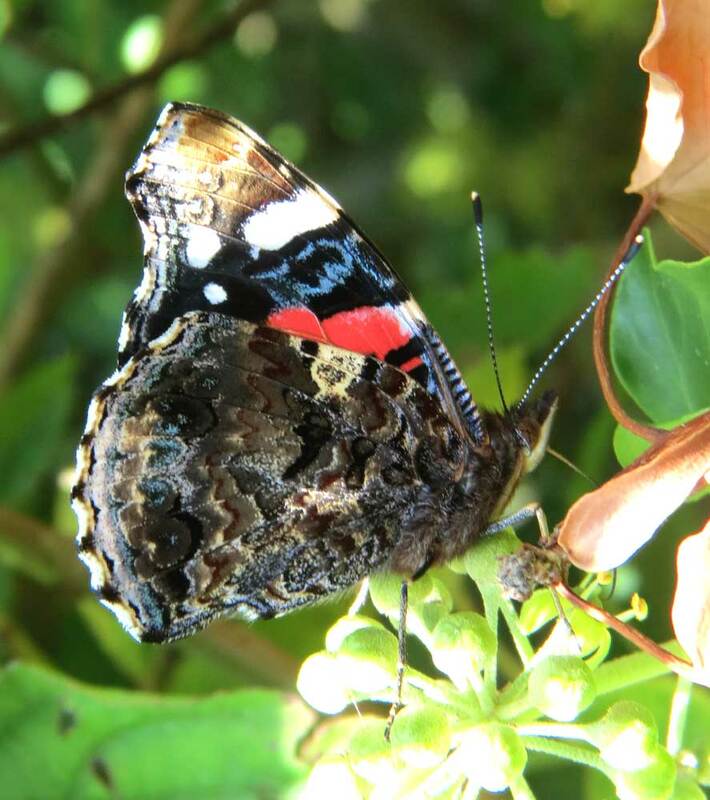 The photographed Red Admiral was seen (one of two) on Ivy next to the Footpath 3140 that goes past Frampton's Field where it joins The Street. 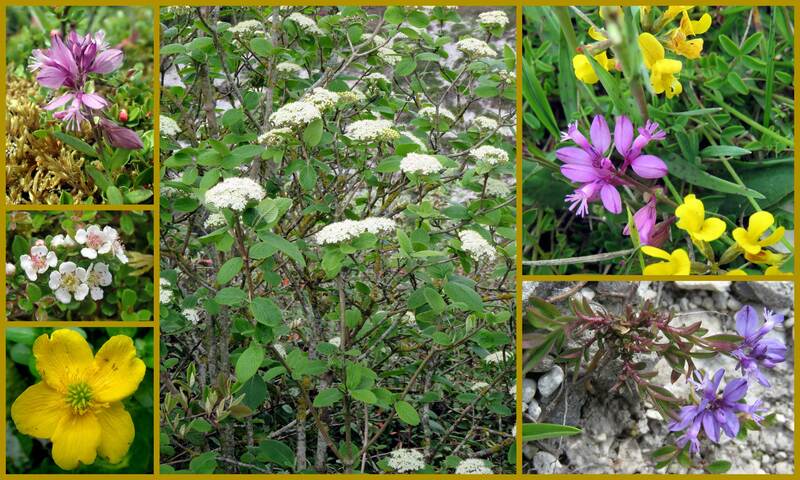 There was a very autumnal look to the downs with wild flowers going to seed and the first berries. 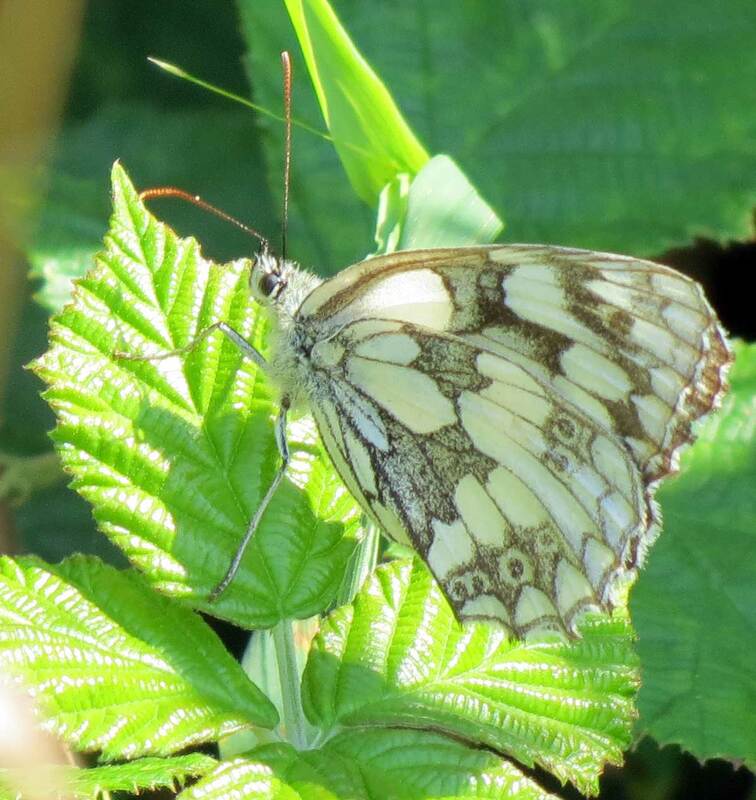 Large Whites, Small Whites, and definite Green-veined Whites were all identified in five minutes at the top of Chanctonbury Drive, north Shoreham with amorous Speckled Woods. 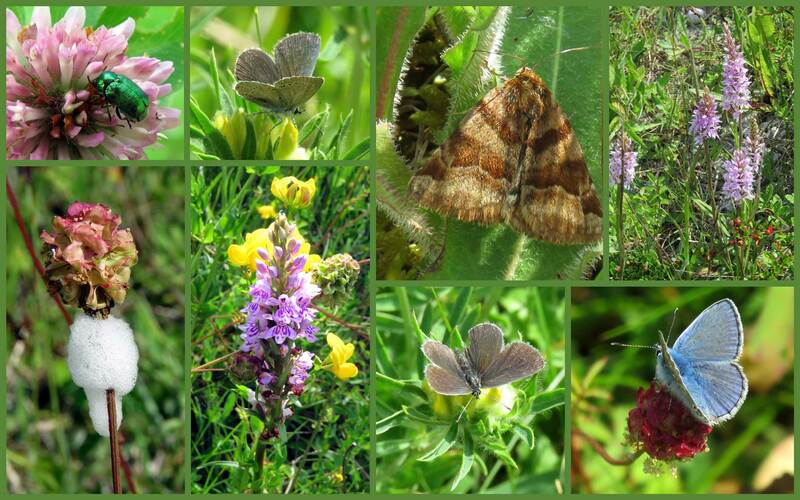 There were no butterflies at all on Mill Hill Cutting (SW) despite the weak sunshine. There was a Slow Worm under under a discarded piece of plastic litter. A Southern Hawker (dragonfly) cruised over the Pixie Path (NW of Frampton's Field) where I recorded a Holly Blue amongst the Ivy and Holly, Ten minutes later, a Red Admiral settled on the chestnut fencing right in front of me. On a breezy warm day I cycled straight to Mill Hill Cutting (SW) where three large Slow Worms were coiled up under a discarded piece of plastic litter. 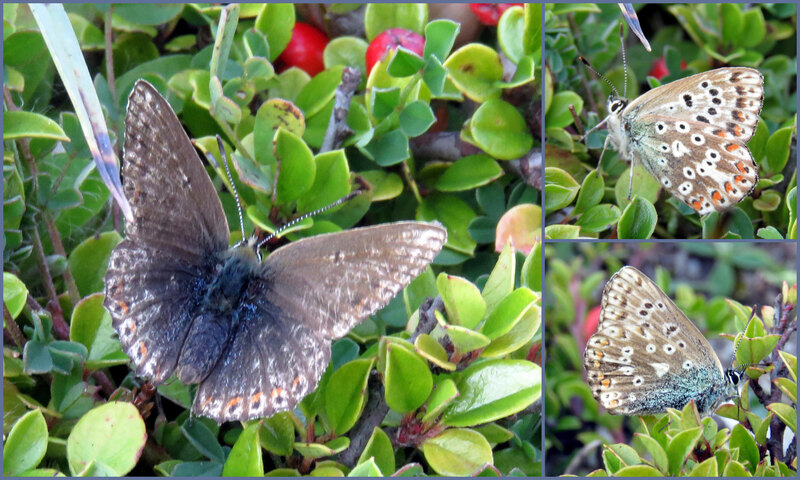 There were occasional butterflies fluttering around: three male Common Blues, three male, three male Chalkhill Blues, and a brown female of undetermined identity, illustrated above. Two common species of grasshopper hopped around. A spider had made a funnel-shaped web amongst the Cotoneaster. it did not seem to be occupied by any spiders or spiderlings. It is most likely to be the home of the Labyrinth Spider, Agelena labyrinthica. 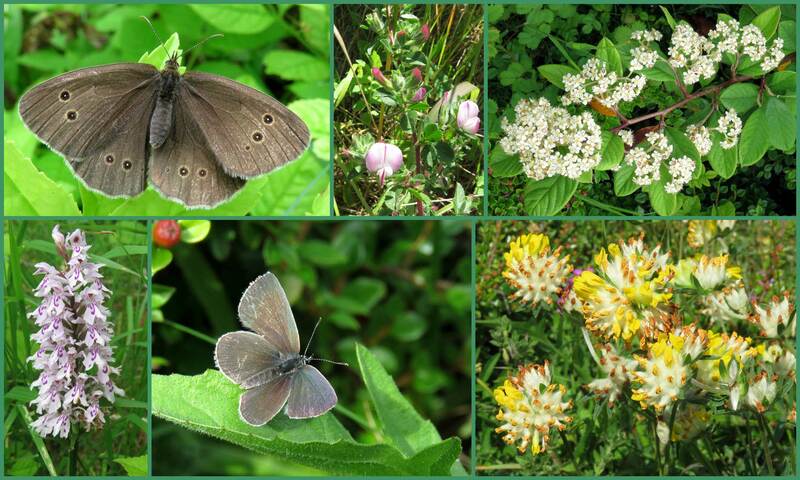 On the Pixie Path I noted occasional Large White Butterflies and one Meadow Brown. 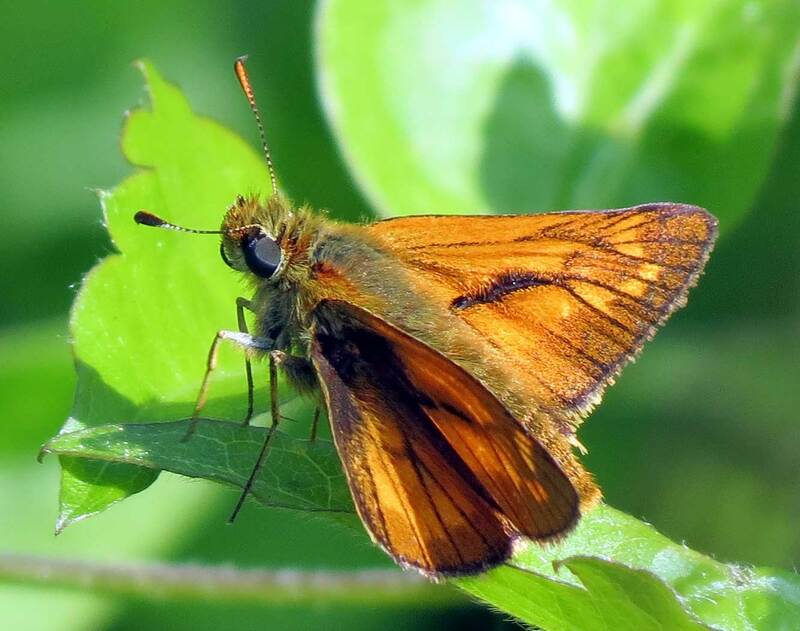 On the Pixie Path there was a Small Skipper to add to the list and a Yellow Shell Moth which hid in a Wayfaring Tree. 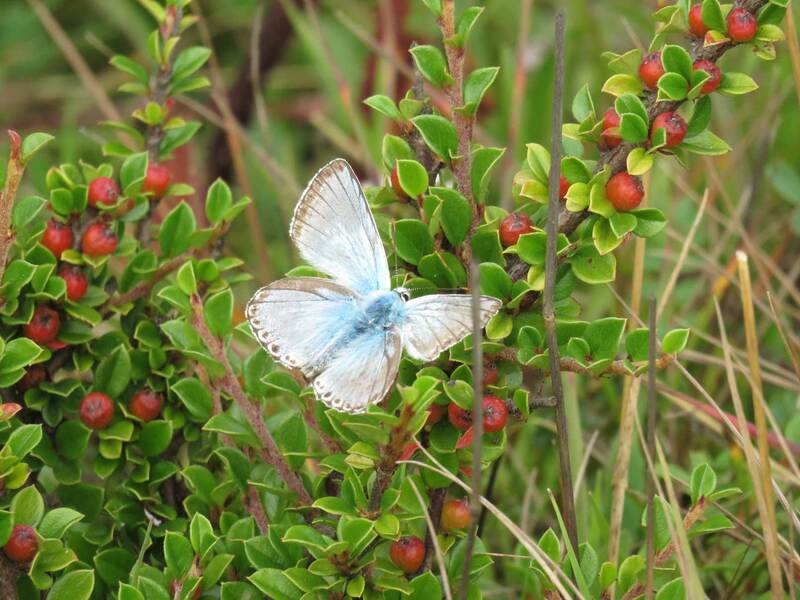 On Mill Hill Cutting (south) nine Chalkhill Blues were in active flight, and one female was spotted crawling over the Cotoneaster and Horseshoe Vetch leaves. 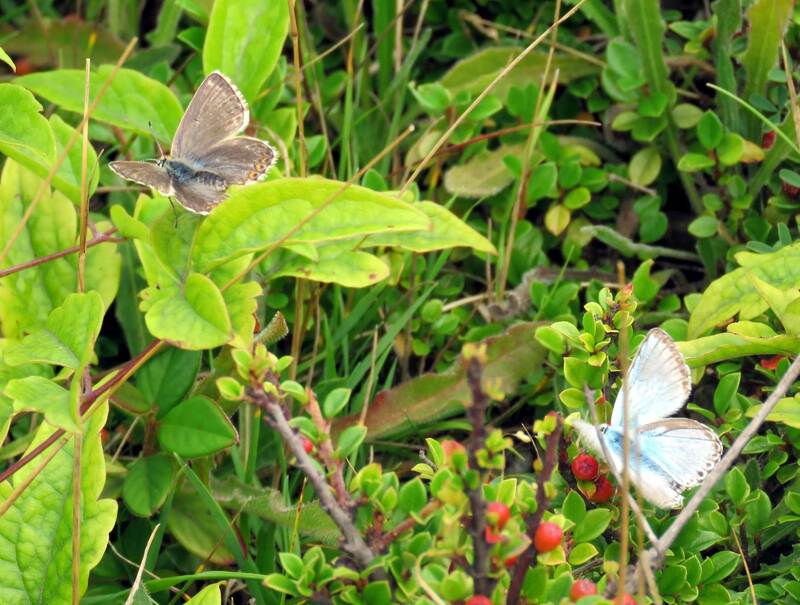 Three male Common Blues danced in the breeze. One large Slow Worm hid under a large piece of cardboard. 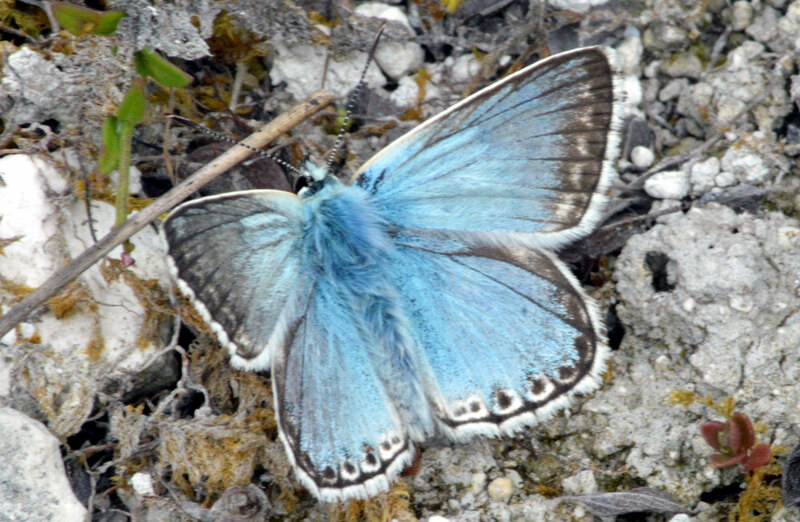 On a cloudy and breezy afternoon inimical for butterflies I cycled to the Mill Hill Cutting (SW) via the Pixie Path (from the west).On the small chalk bank I observed one Peacock Butterfly that settled for an instant, a Large White and eight male Chalkhill Blue Butterflies in almost constant flight. Two large Slow Worms hid under a large piece of cardboard. 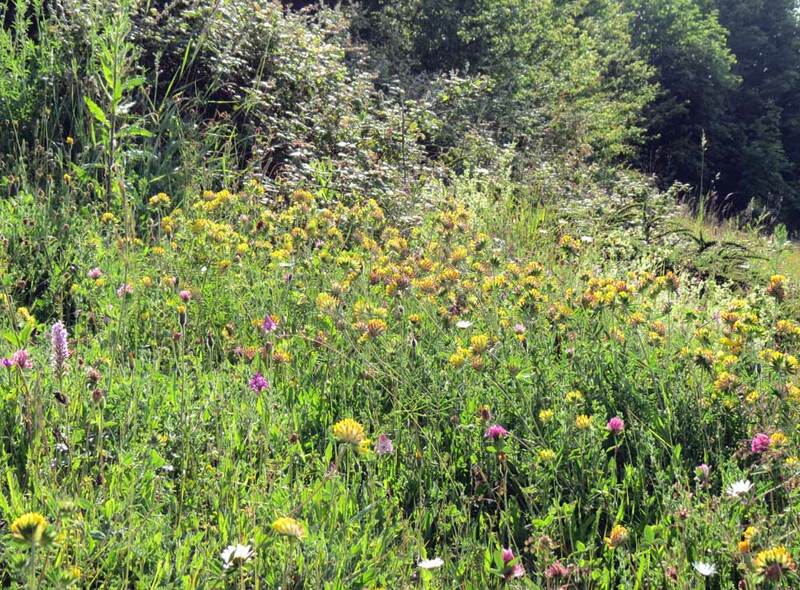 On the Pixie Path (northern section ) I added one Red Admiral, occasional Meadow Browns, a few Gatekeepers, one Small Skipper, one male Chalkhill Blue, and one male Common Blue. A Shaded Broad-bar Moth, Scotopteryx chenopodiata, was also spotted on the path. On Buckingham Cutting (south) there were two Speckled Wood Butterflies in the shade and on the open verge there were a few Meadow Browns, a few Gatekeepers, and at least one Small/Essex Skipper and at least one Red Admiral and at least one 6-spotted Burnet Moth. Large Whites and Small Whites were present in the sunshine. The first impressive Volucella zonaria hoverfly of the year was seen on Buckingham Cutting (south). The bumblebee mimic hoverflyVolucella bombylans var. bombylans was seen in the same area a minute later. 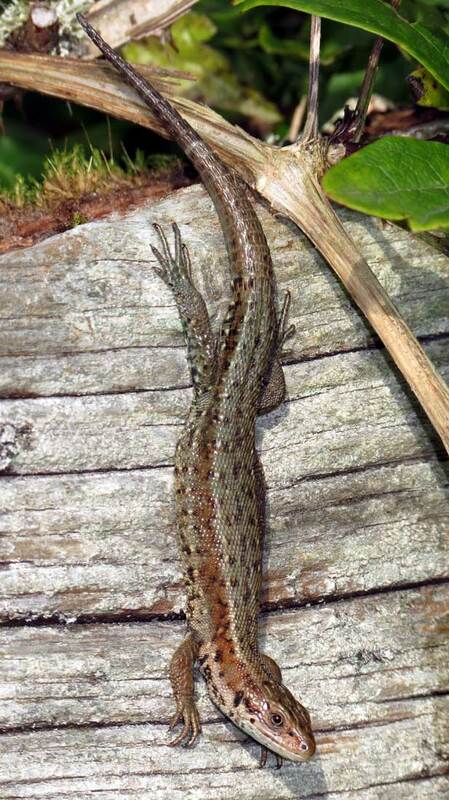 An olive green Common Lizard, Zootoca vivipara, rested on the Cotoneaster, but skitted slowly into immediate cover and disappeared with my shadow. On a cloudy cool day, there were about ten fresh Red Admirals, a Marbled White and a Gatekeeper on the Pixie Path 3138 (northern section). 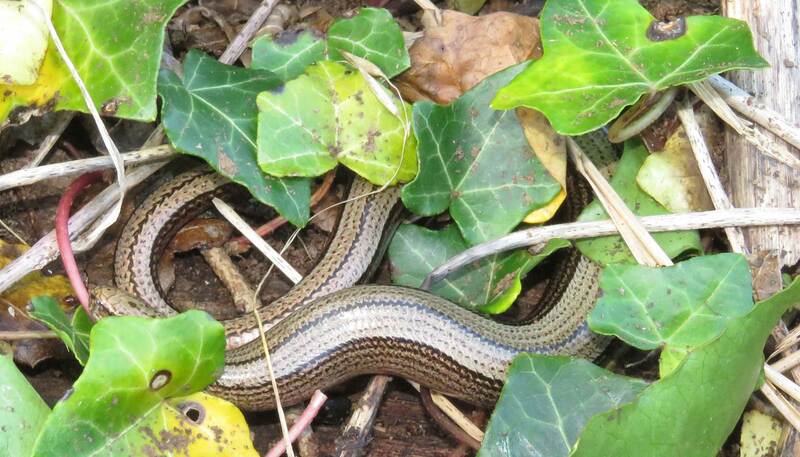 On the Mill Hill Cutting (south) I discovered a Slow Worm at least 25 cm long, as big as I had ever seen one. It was under a large piece of discarded cardboard. Early in the afternoon I detoured to Buckingham Cutting (south) and added another Meadow Brown, two or three Marbled Whites, one Red Admiral, one Small Skipper, and at least one slow flying Ringlet. 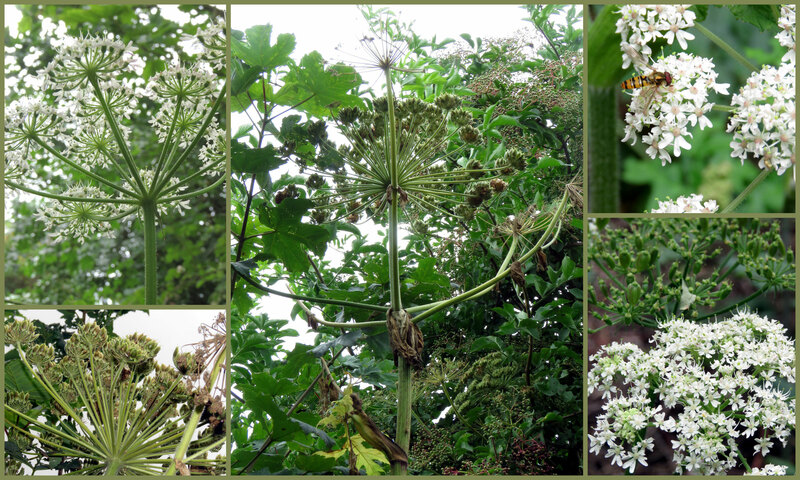 Still cloudy and overcast and too breezy for the open downs, I stll made a detour to Buckingham Cutting (south) where the Giant Hogweed had grown much higher than a person towering at least three metres above the path. It did not seem to be a week since I last visited but that was because of the intervening thunderstorms and rain. 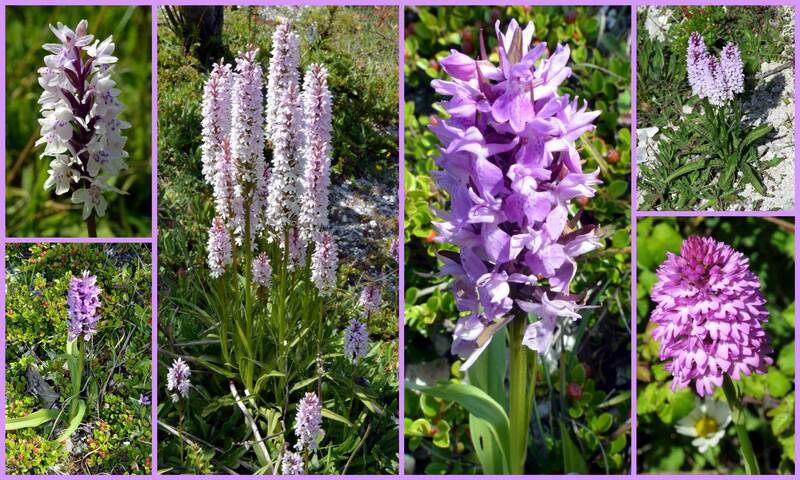 The orchids and other plants in flower did not seem to have changed all that much in a week. 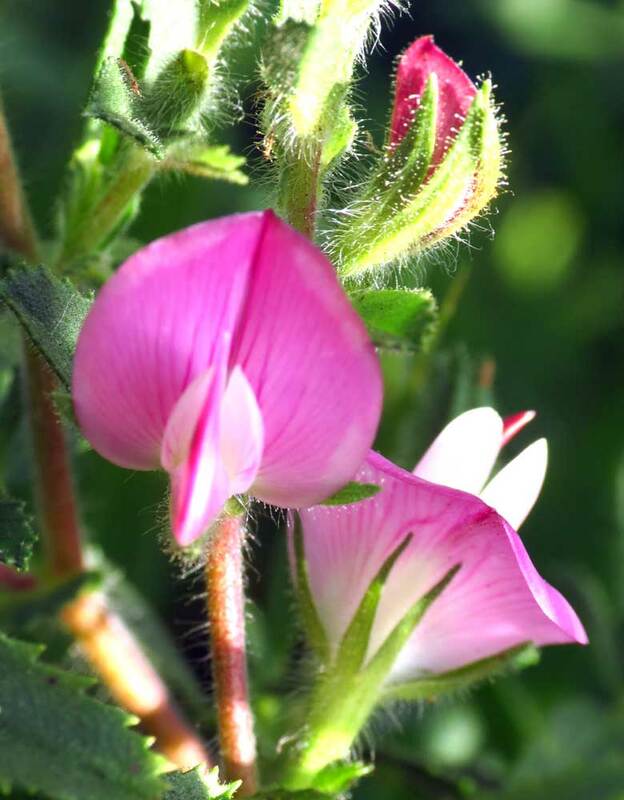 Restharrow was now flowering. Self-heal grew tall in the tall vegetation. A few small Perforae St. John's Wort were budding. I stayed long enough for a few butterflies to be disturbed. 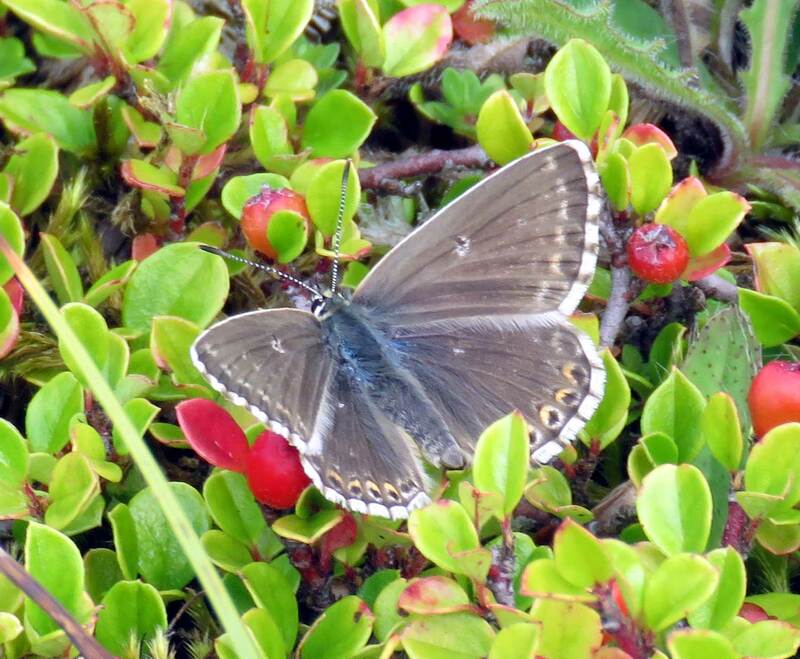 The first a lively Meadow Brown of several males only, followed by a languid flight of the first of a handful of Ringlets of both genders, followed by the lively flight of about the same number Marbled Whites and lastly two Small Blues. 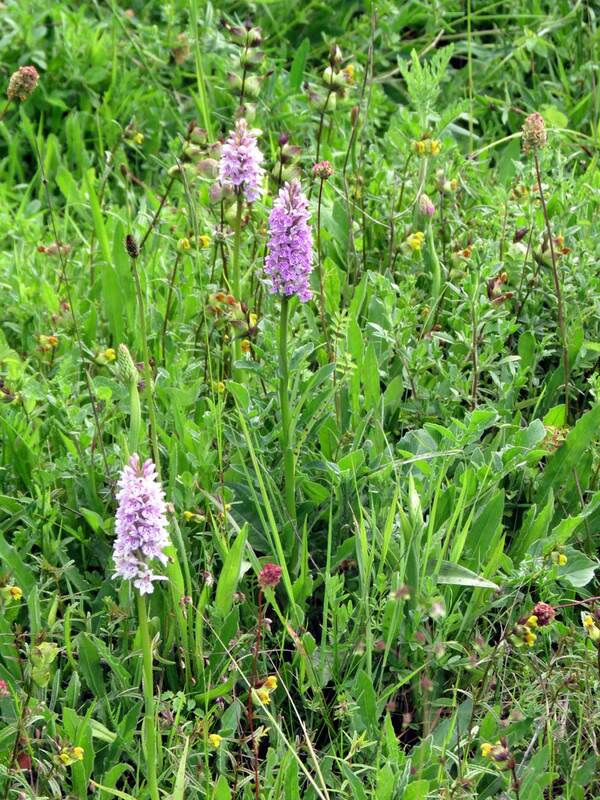 Still cloudy and wet from the over night rain, but still worth a detour to the Slonk Hill Cutting (south bank) where the hundreds Spotted Orchids were not so abundant as usual years and were already joined by a few budding Pyramidal Orchids. The languid fluttering of my first Ringlet Butterfly of the year was soon followed by a more energetic first and fresh male Meadow Brown. 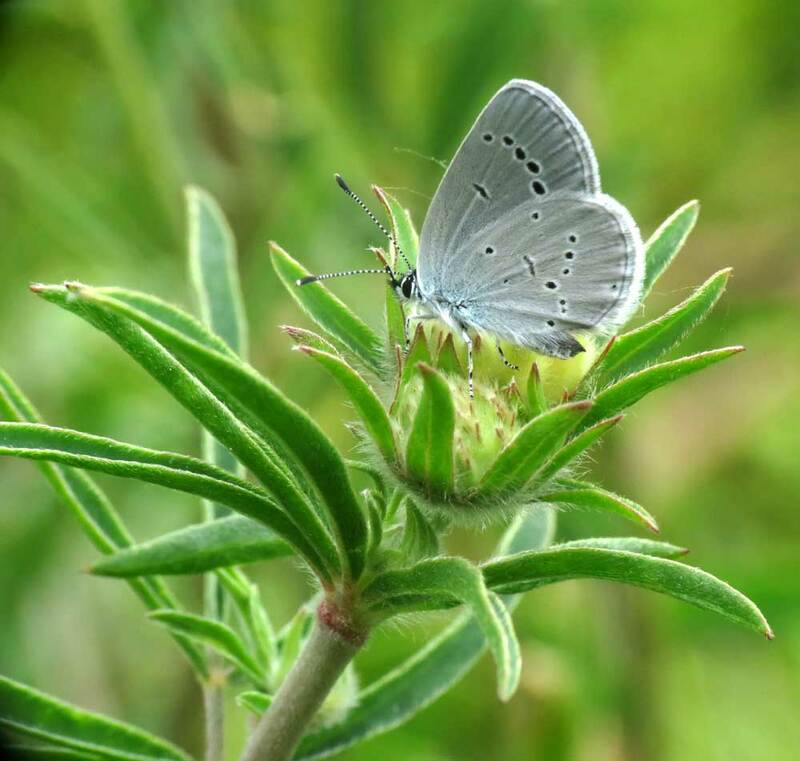 A flash of blue was identified as a Holly Blue Butterfly. Spiders had spun at least thirty large webs over the ground vegetation including the Cotoneaster. 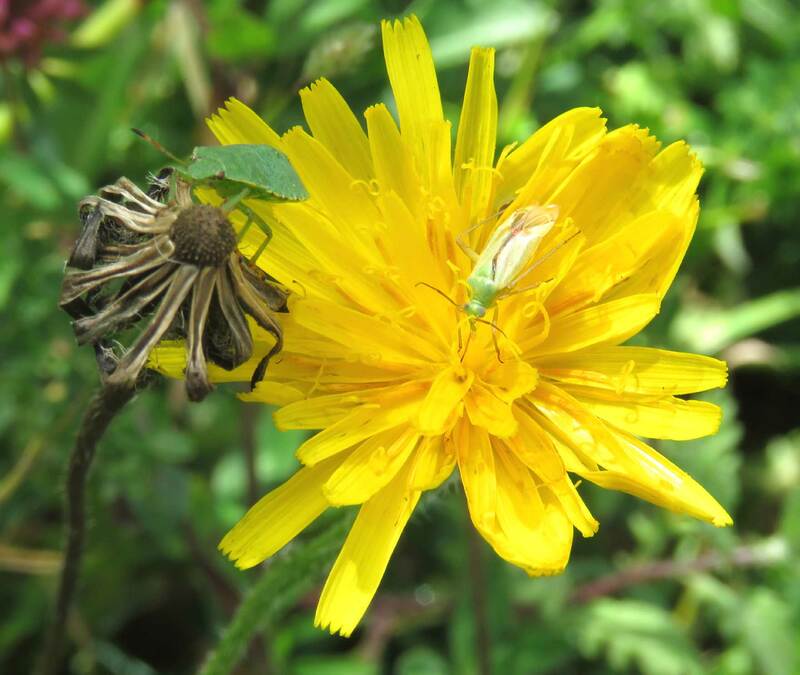 There were two species of yellow Dandelion/Hawkbit-type (Cichorioid Daisies) flower amongst the orchids, grasses, Lady's Mantle and Salad Burnet. 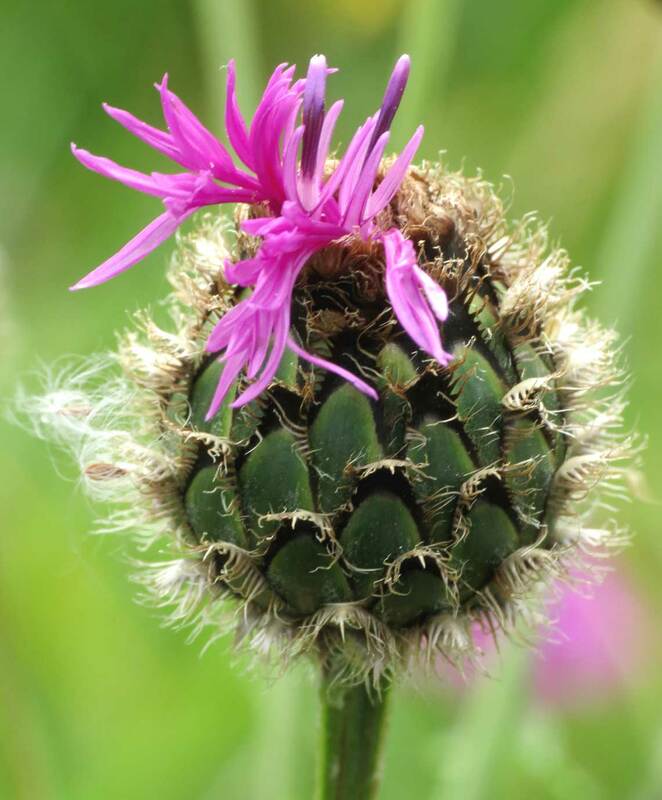 One of the two was Rough Hawkbit. The linear copse path to Buckingham Cutting (south) was overgrown and just about passable (from the east). 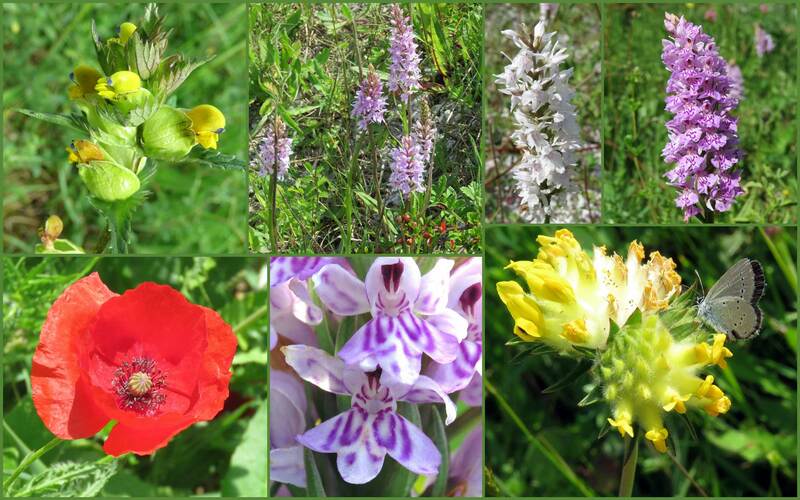 There were more orchids on this small patch of roadside verge with Red Clovers, Yellow Rattle, Ox-eye Daisies, Greater Bird's Foot Trefoil, Kidney Vetch, Hedge Bedstraw etc. The tiny butterfly was a Small Blue. 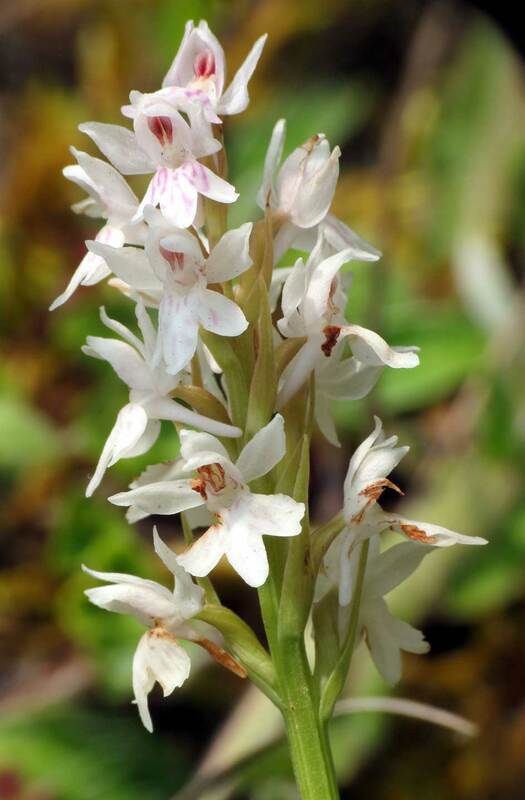 As an afterthought I looked out the meadow-like road verge at Buckingham Cutting (south) where the first Common Spotted Orchids were budding and showing their first flowers. 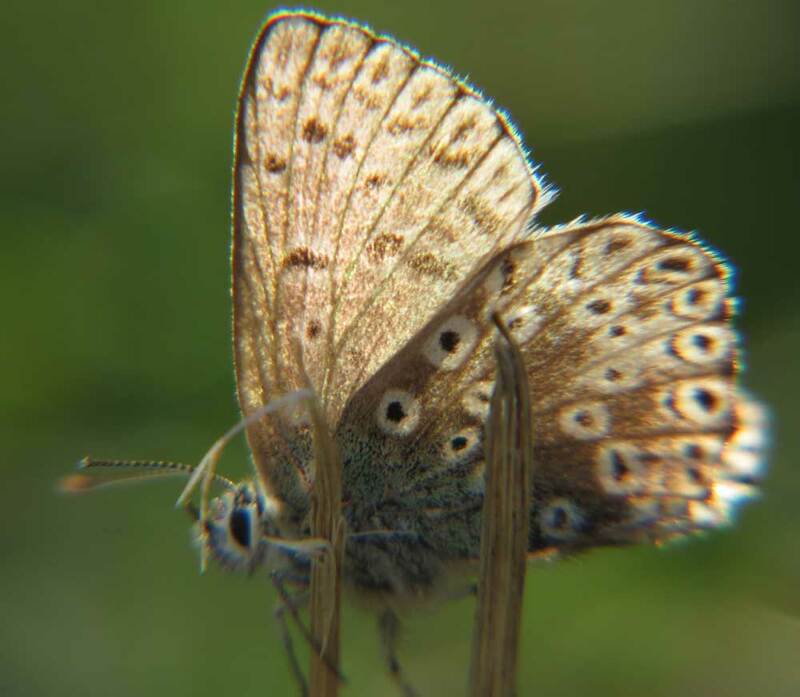 After a little bit of exploring my eyes keyed into my first Small Blue Butterflies of the year. 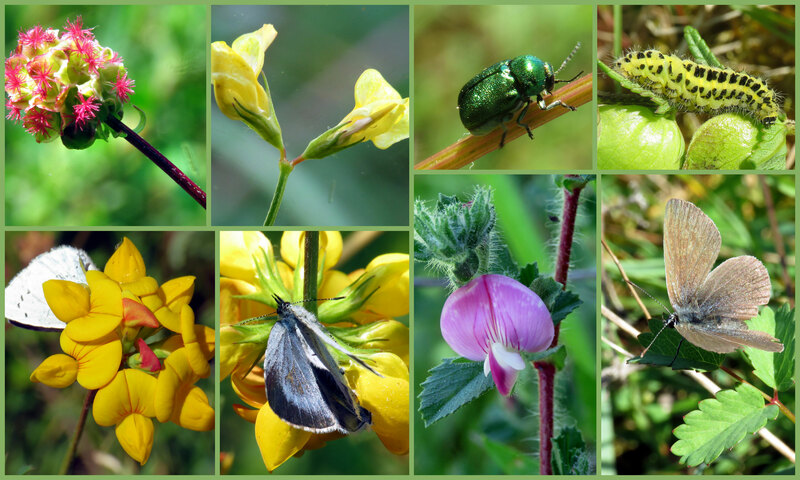 This small garden-sized area also hosted my first Yellow Rattle in flower and two species of small green beetles: the common Thick-legged Flower Beetle, Oedemera nobilis, and the equally common Cryptocephalus, as well as a Common Blue Damselfly. NB: The Marsh Marigold was from my garden. 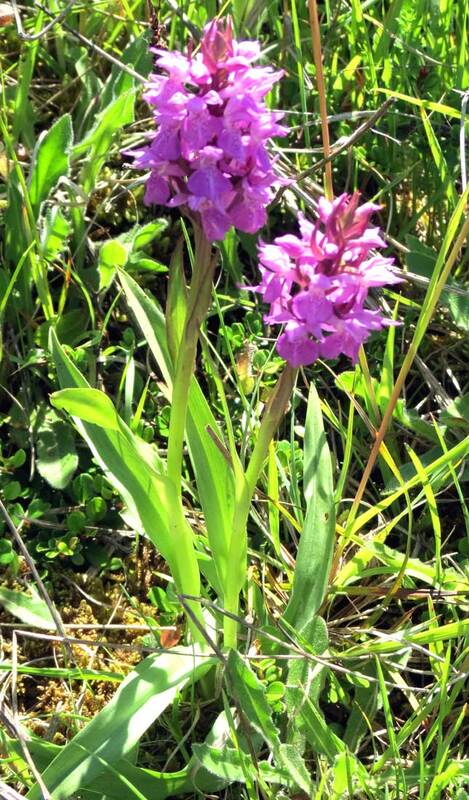 I looked for the usual Southern Marsh Orchids on the road cutting on the south side of the Mil Hill Gap without success only finding evidence of human vegetation clearance and discarded rubbish. 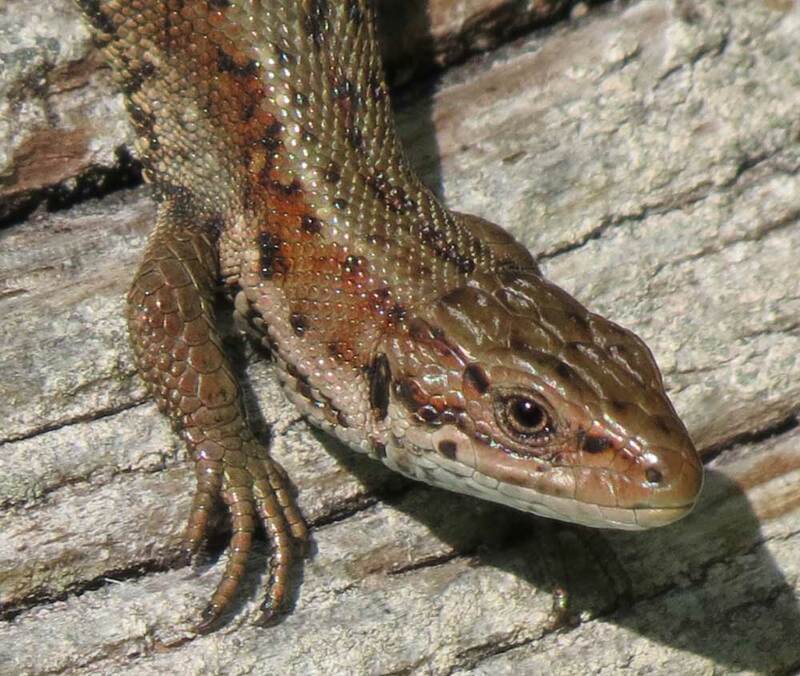 A rustle amongst the Cotoneaster on the meadow of Buckingham Cutting (south) was a Common Lizard, Zootoca vivipara, in the weak sunshine. 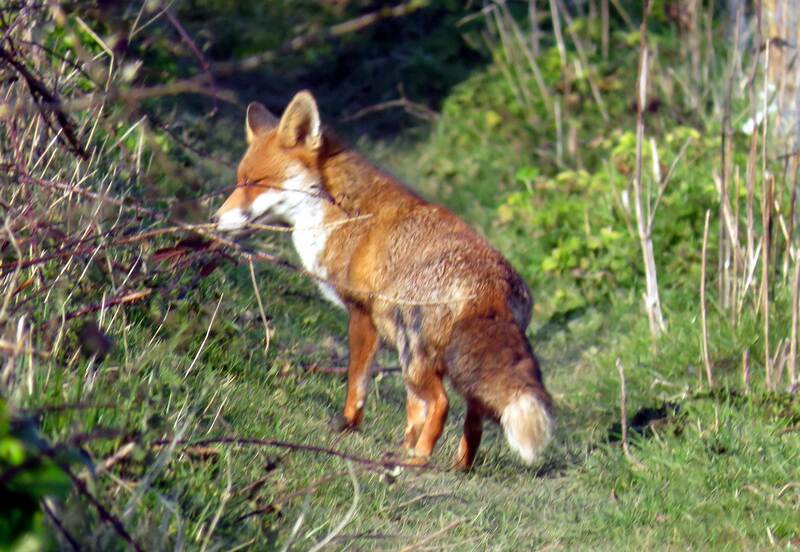 A Fox in the afternoon on Footpath 3138 from Old Shoreham to MIll Hill (west boundary of Frampton's Field, divided into Horse runs) in its usual position half way up on the north-south part of the footpath. In the fading light of the late afternoon, I spotted the silhouette of a small bird in a budding Elm tree on the footpath by Frampton's Field, Old Shoreham, near where the footpath meets The Street. 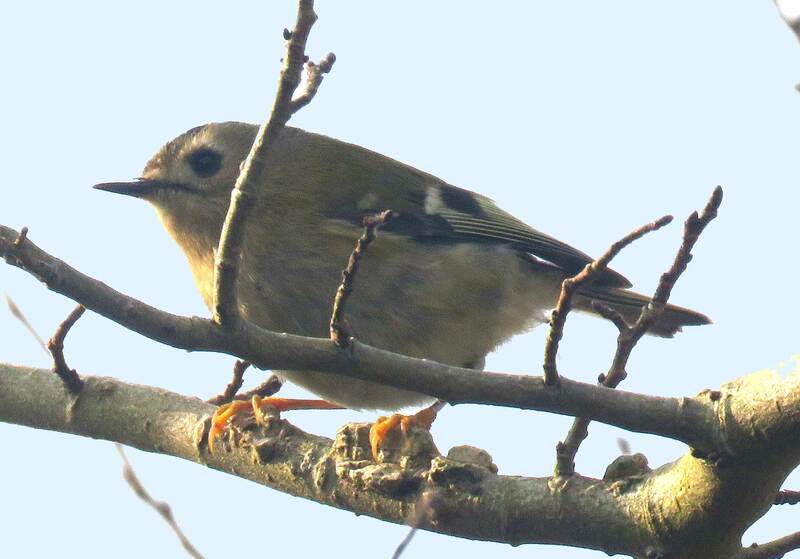 It turned out to be the first Goldcrest I have seen locally for several years. Blue sky and sunshine (> 17.3 °C) throughout with a Light Breeze (gusting to Force 6) prompted an early afternoon visit to Mill Hill. Under a disconnected prone strip of chestnut fencing next to the Pixie Path and adult and a juvenile Slow Worm lay in a nest of red/brown flying ants. Both of the legless lizards were quickly disturbed but returned to their position an hour later. 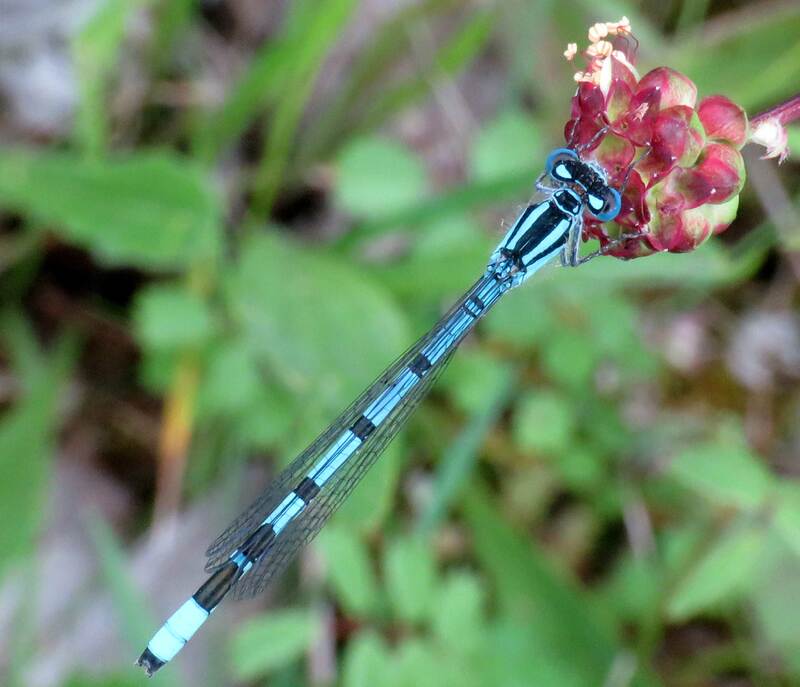 Four Common Darters were seen over the north-west corner of the Pixie Path. Ants location: OS grid ref: TQ212065 I-spot: Temnothorax nylanderi is suggested. 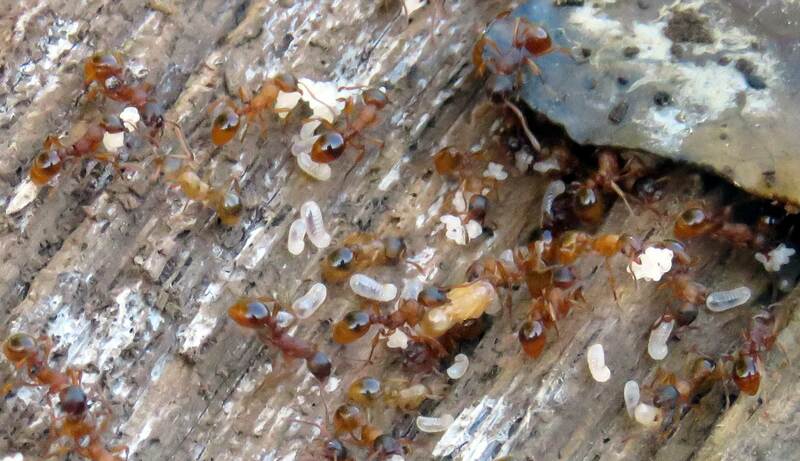 The Meadow Ant, Lasius flavus,is arguably more likely. 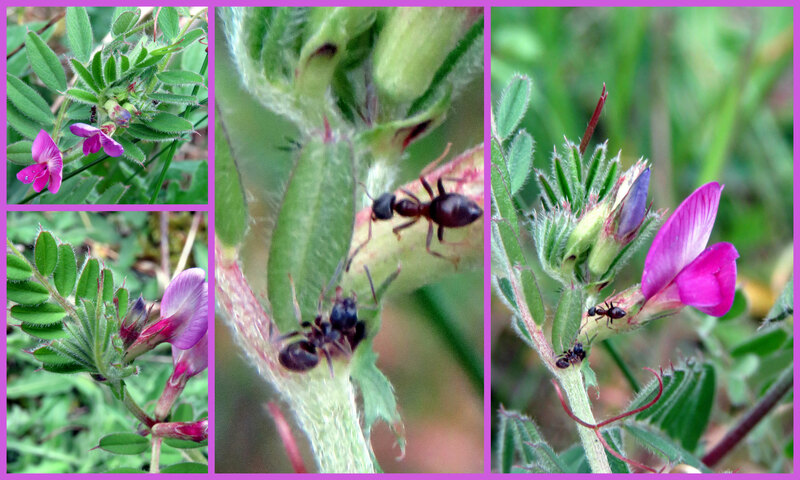 Slow Worm Ants, possibly Temnothorax sp. Cloudy but at least it was not raining and anything fluttering in the breeze was more likely to be a fallen leaf as the equinox passes and the days become even shorter. 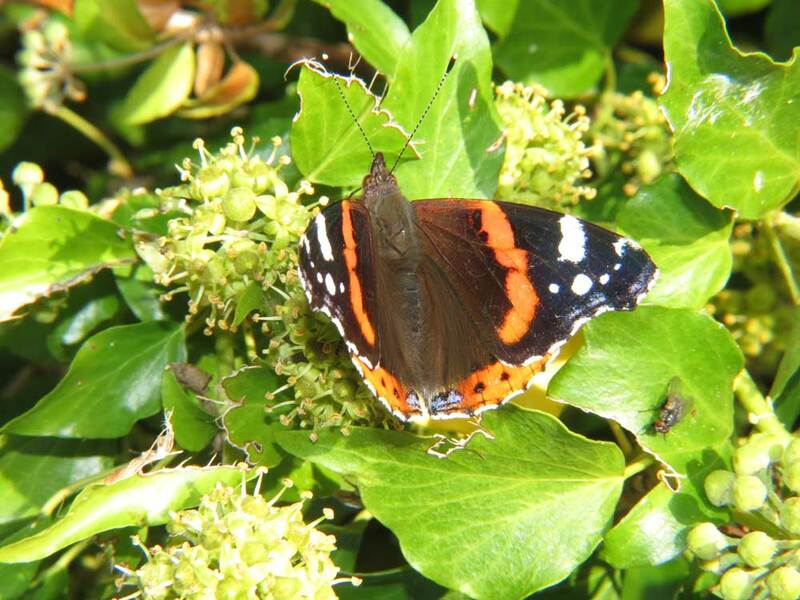 I disturbed four or five Red Admirals in a single Ivy bush on the Pixie Path, north Shoreham. The Pixie Path hosted a Small Robber Fly, Machimus atricapillus, three Common Darters (dragonfly) and a larger dragonfly. As they all appeared simultaneously so I did not get a chance to chase the larger dragonfly to find out what is was. I fancied it to be a Migrant Hawker rather than the more usual Southern Hawker. 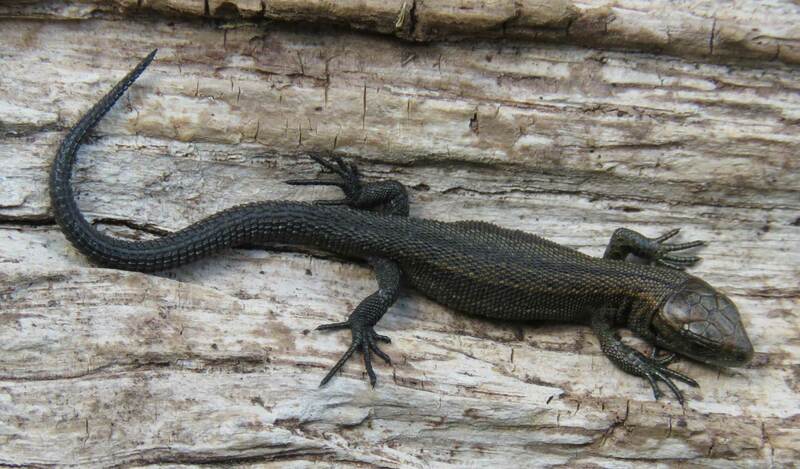 On the prone chestnut fencing of the Pixie Path, there were about twenty Common Lizards, Lacerta vivipara, seen in various different places. 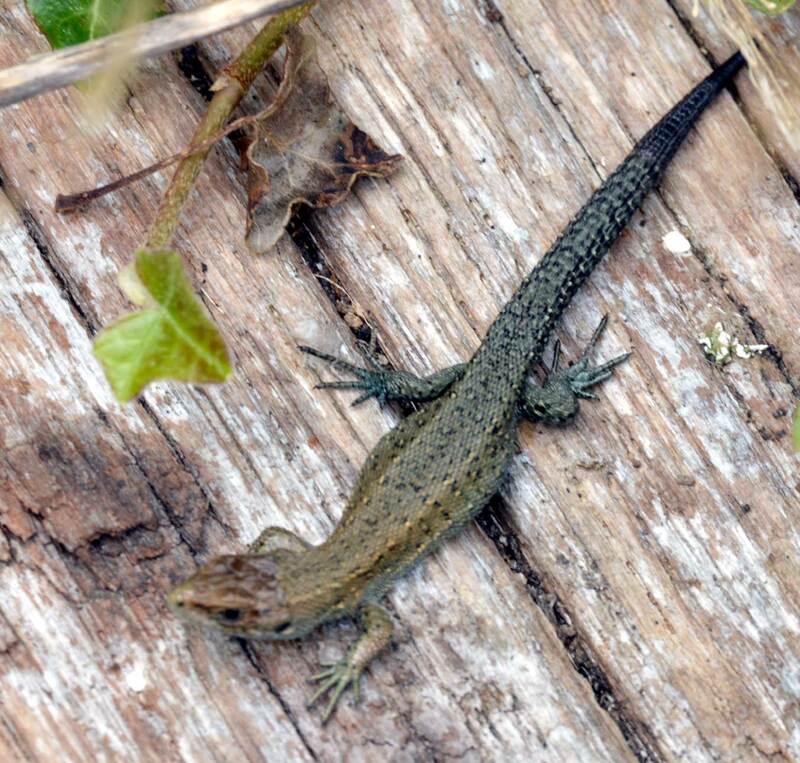 Highlight of a grey and cloudy day was another family of two adults and five full-sized juvenile Common Lizards, Lacerta vivipara, on the prone chestnut fencing, 20 metres to the west of where a family of lizards was seen a week previously. I looked at the location where I found the lizards before and uncovered an ants nest and spotted a very small Slow Worm, which was the first I had seen this year. 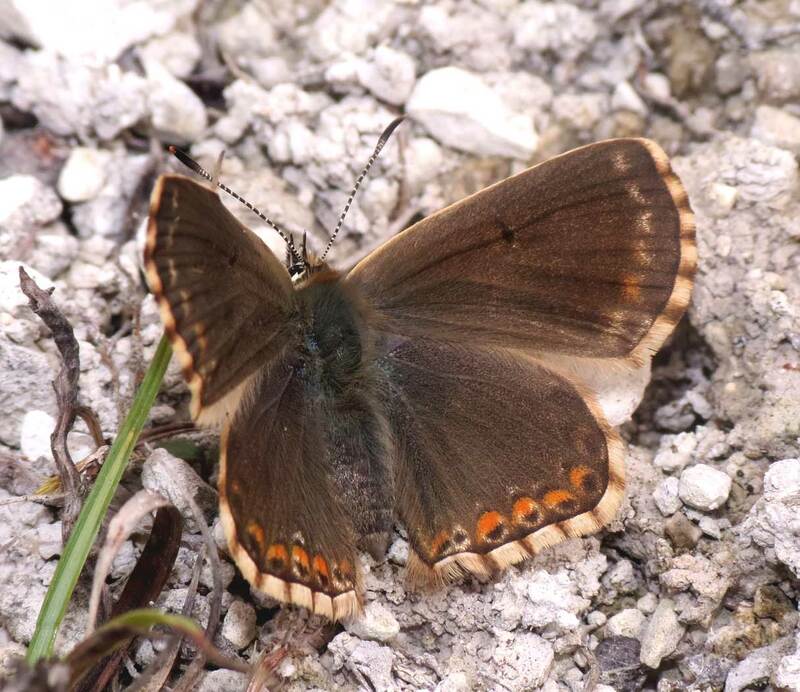 At the top of Chanctonbury Drive (SE of Mill Hill Nature Reserve) a Holly Blue fluttered by and four Speckled Woods were quite lively with a Large White and a Red Admiral on the edge of the trees. 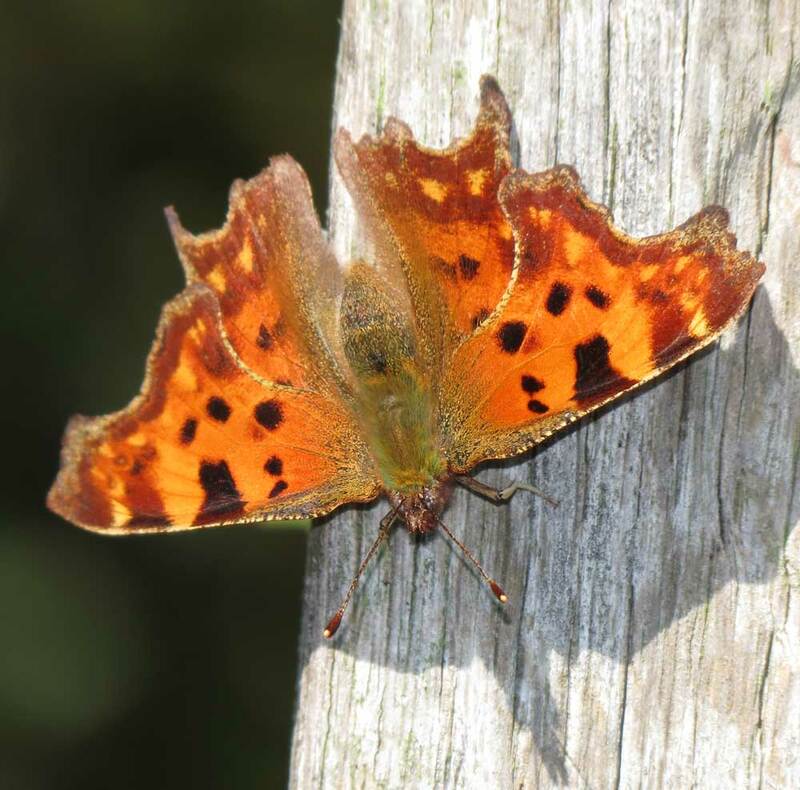 The Pixie Path (north) hosted two Small Whites, three Holly Blues, a Speckled Wood, a Meadow Brown, and last but not least a fresh Comma Butterfly. Other insects of note were a Southern Hawker (dragonfly), a Common Darter (dragonfly), a Small Robber Fly, Machimus atricapillus and occasional hoverflies. 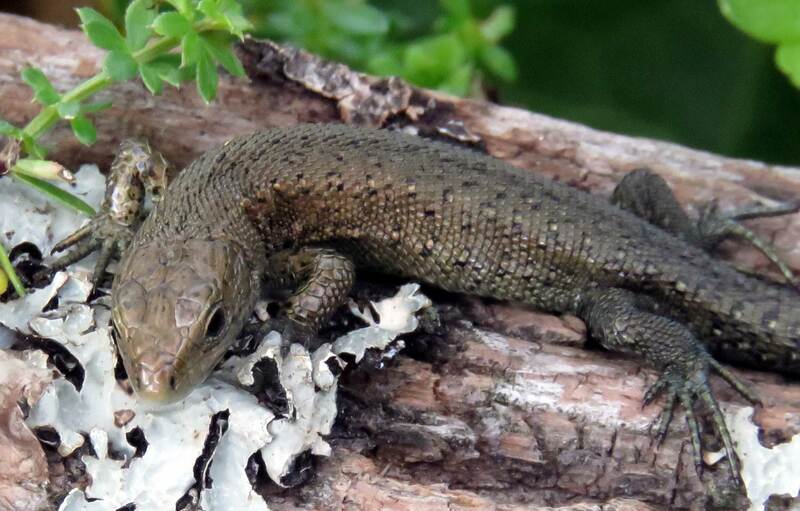 I first spotted an adult Common Lizard, Lacerta vivipara, on the Ivy at the top of the Pixie Path 3138 to Mill Hill, followed after a few minutes by five much darker juveniles as shown in the photograph above. 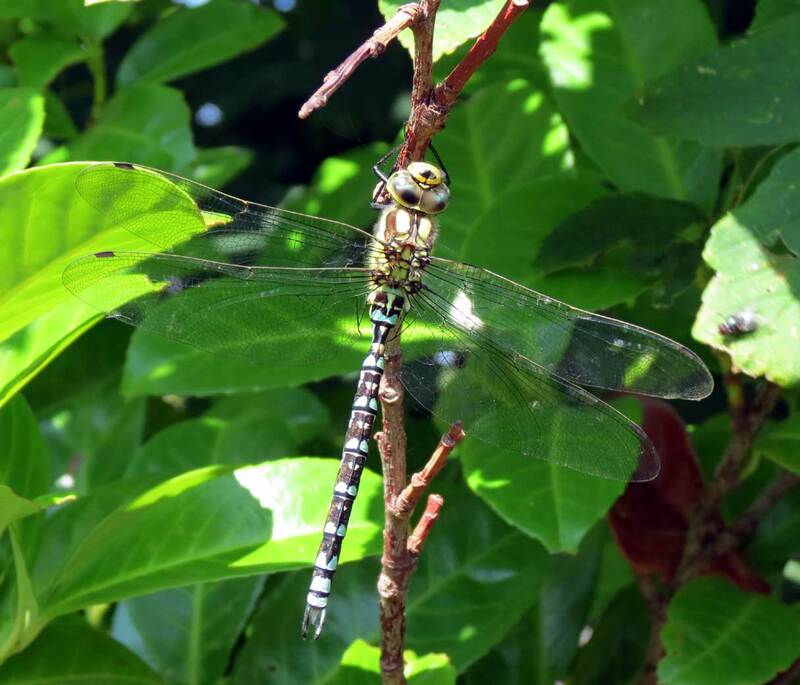 On a cloudy day a Southern Hawker (dragonfly) patrolled over the Pixie Path. 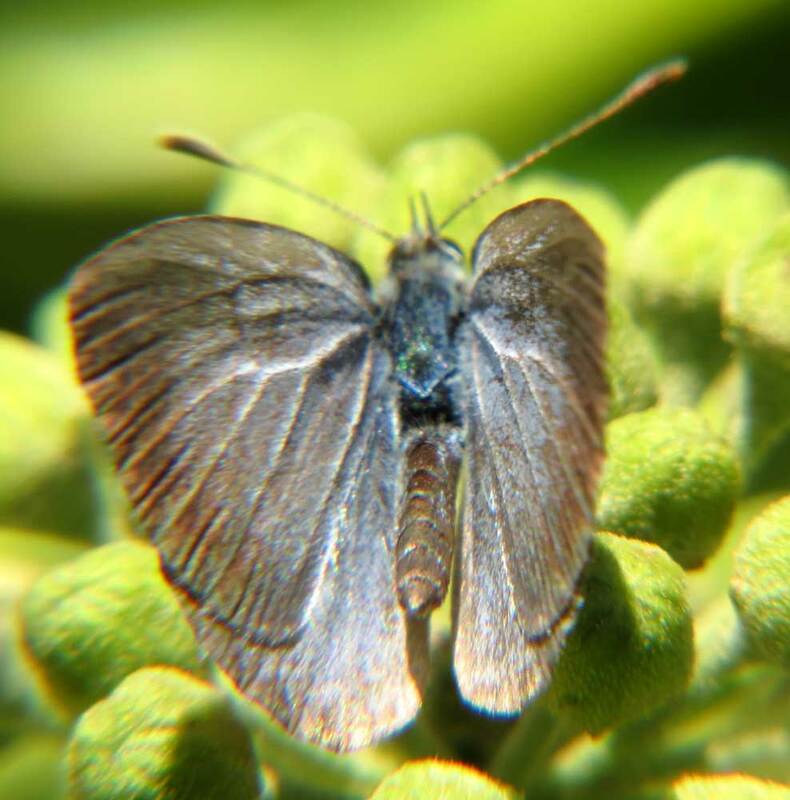 A dozen Holly Blue Butterflies were on the Ivy on the road (northern) side of the Pixie Path. They were quite lively whereas most of the other butterflies were hiding. 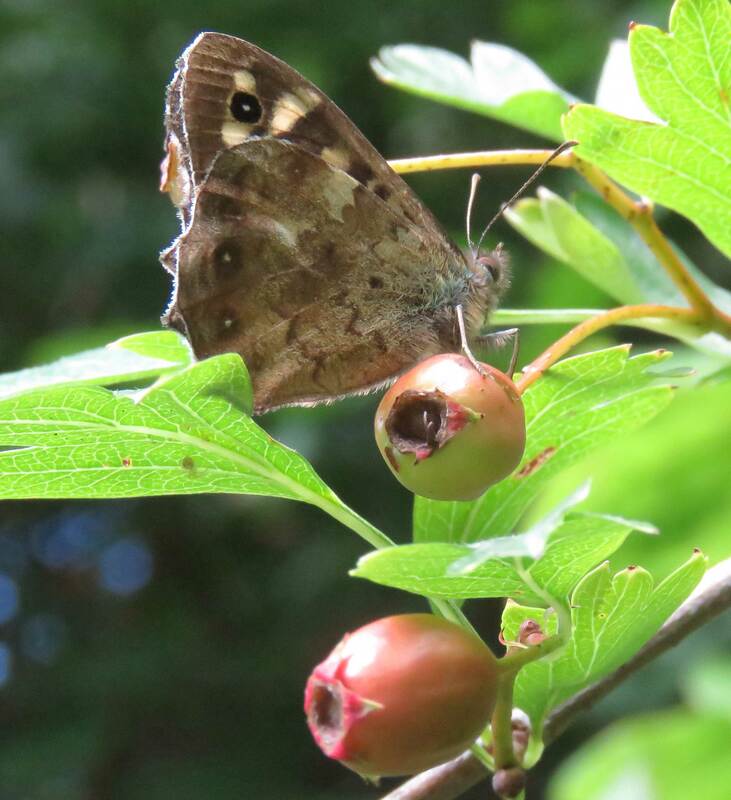 Ten Speckled Woods fluttered amongst the Hawthorn berries (Haws). 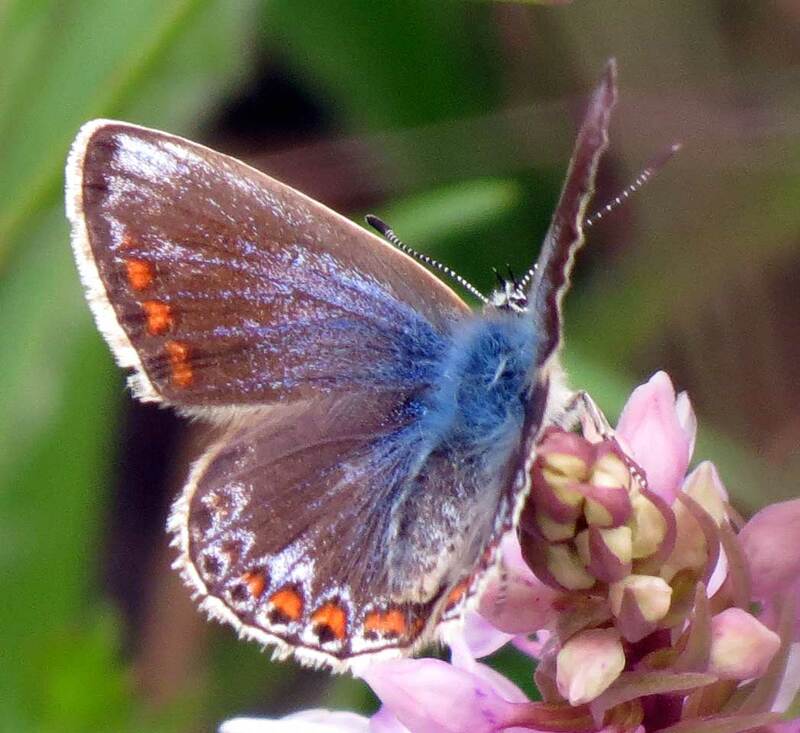 There were a pair of worn Chalkhill Blues on Mill Hill Cutting (SW) and there may have been more but I did not loiter around to look for them. 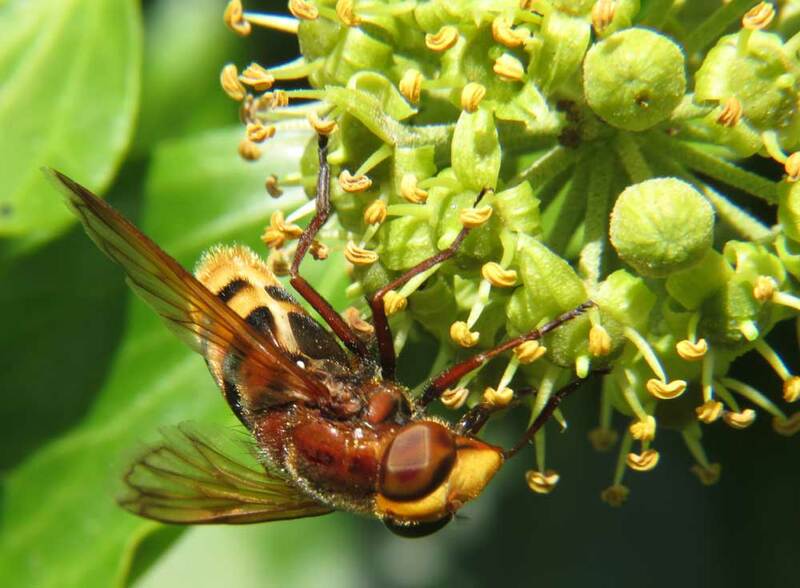 I also spotted a Rhingia hoverfly on the Ivy and the rarely seen hoverfly Dasysyrphys albostriatus. Circumstances restricted me to Shoreham town and outskirts in the afternoon sunshine which was favourable for twelve species of butterflies in the town and immediate outskirts (south of the A27). Adding the northern part of the Pixie Path 3138 and Frampton's Field added a handful each of Gatekeeper and Meadow Browns, two to four Wall Browns, occasional Common Blues and frequent Holly Blues and at least eight fresh dark Speckled Woods. 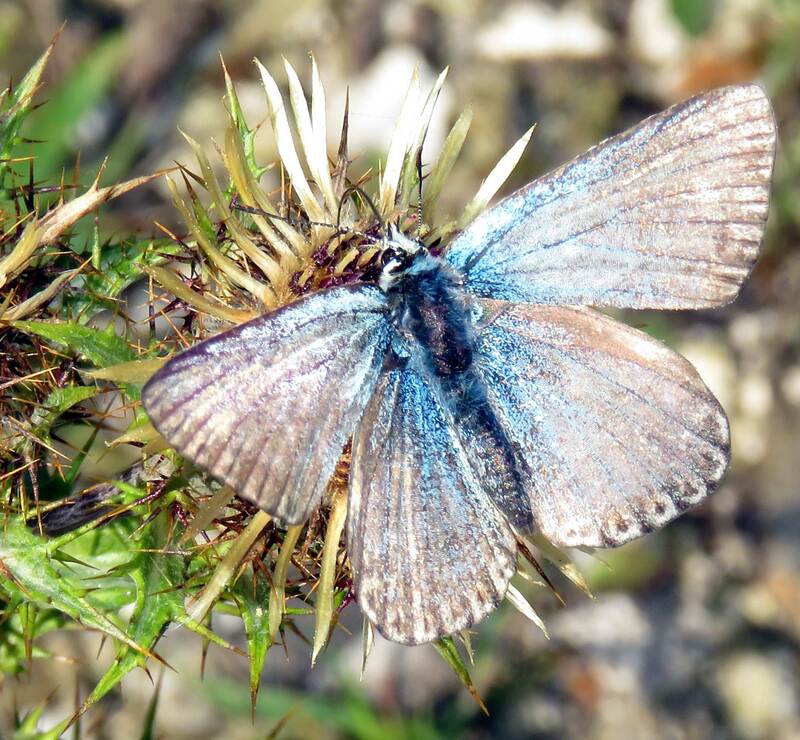 The southern bank of the Mill Hill Cutting added fifteen lively Chalkhill Blues of which ten were faded females, but there was at least one very fresh male. 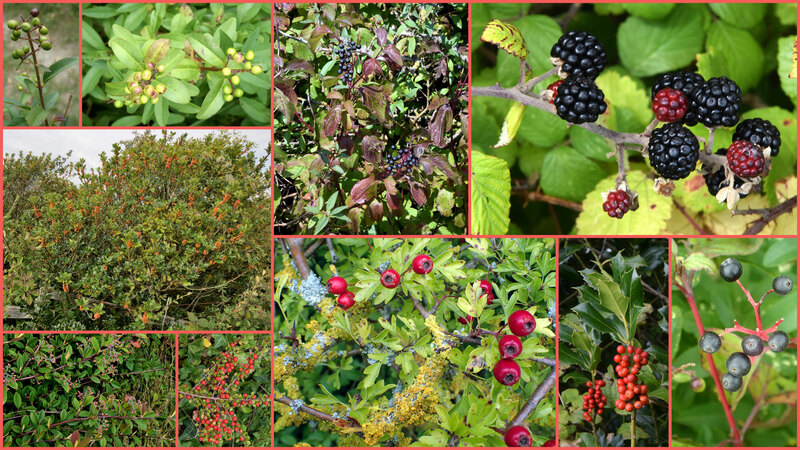 Hawthorn, Wayfaring Tree and Brambles were beginning to berry. 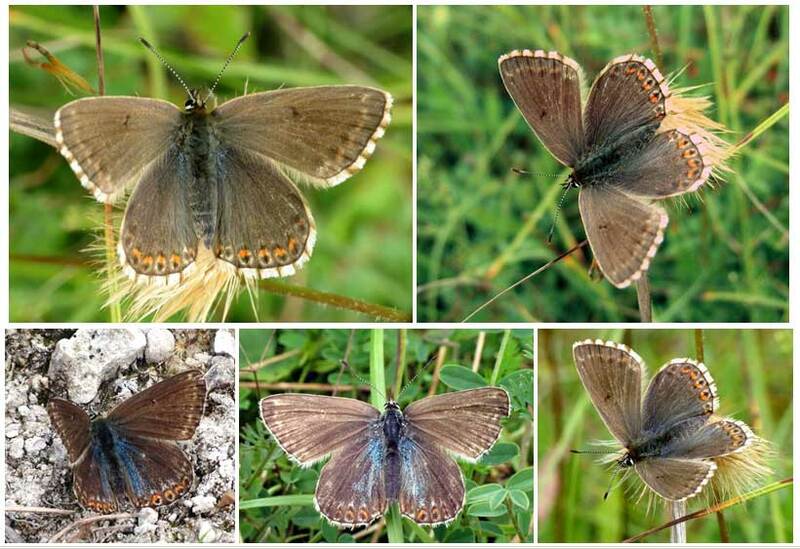 NB: I am not sure of some of the Chalkhill Blues were females or males that have lost their blue sheen? Almost all of them were like the photographs above. On a passage cycle journey I made a quick decision to detour to the southern bank of the Mill Hill Cutting via Pixie Path 3138 (from the south) where 12 Holly Blues were the most prevalent butterfly on the path, with a few Gatekeepers and Meadow Browns, a Speckled Wood, Red Admiral and one Wall Brown. 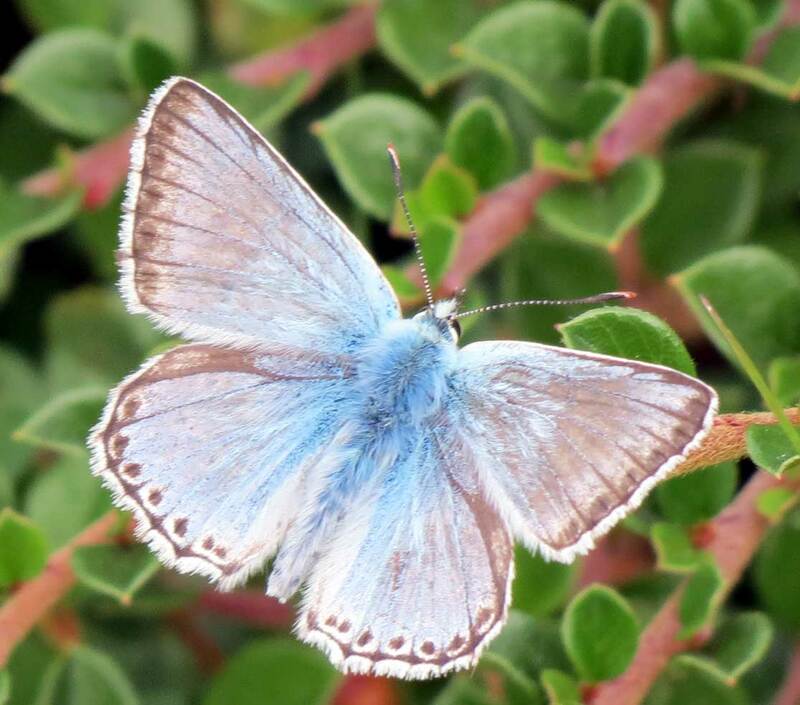 Clambering over the chestnut fencing and Ivy onto the crumbly chalk road verges stabilised with Cotoneaster, a male Common Blue was seen immediately, the first of 9, and almost simultaneously the first of frequent Chalkhill Blues fluttering around on an overcast day. In a garden-sized patch an estimated 24 (20+4) were seen in 20 minutes with 15 males seen flying around at the same time. They were in various condition, from pristine to good and some a bit worn, and included four females which the males had difficulty in finding. After the thunder and rain, a few butterflies came out in the afternoon: on Buckingham Cutting (south) I saw a few each of Holly Blues, Common Blues, Brown Argus, one or two Small Blues, one Red Admiral and a Silver Y Moth. 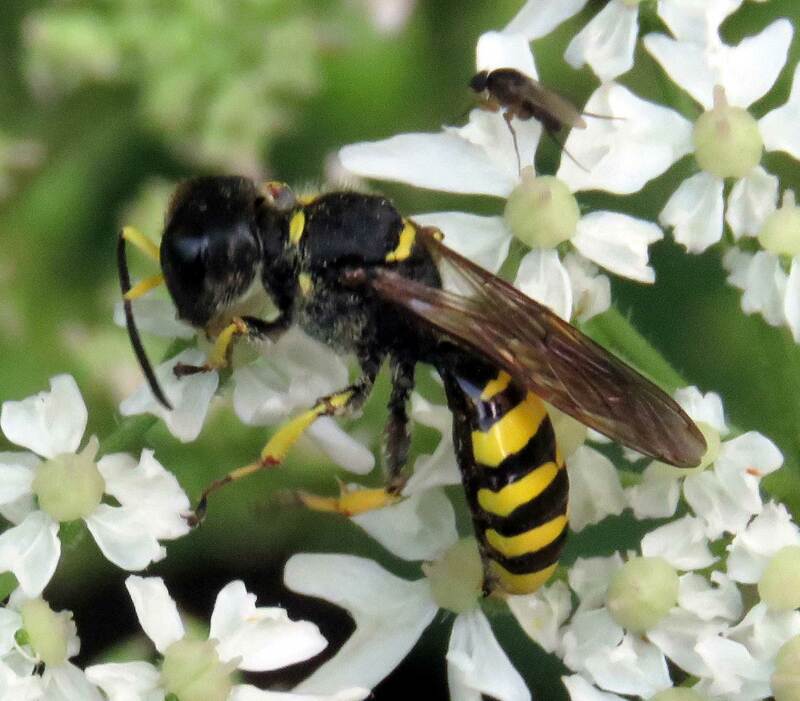 Hoverflies, of least four species, plus a Digger Wasp Ectemnius sp. and other flies, visited the Hogweed. On approaching Buckingham Cutting (south) I immediately spotted a Large White, Red Admiral and Comma Butterfly, followed in under a second by a Meadow Brown, and shortly afterwards on the meadow-like road verge by a Small Skipper. After less than a minute three Holly Blues flew by. 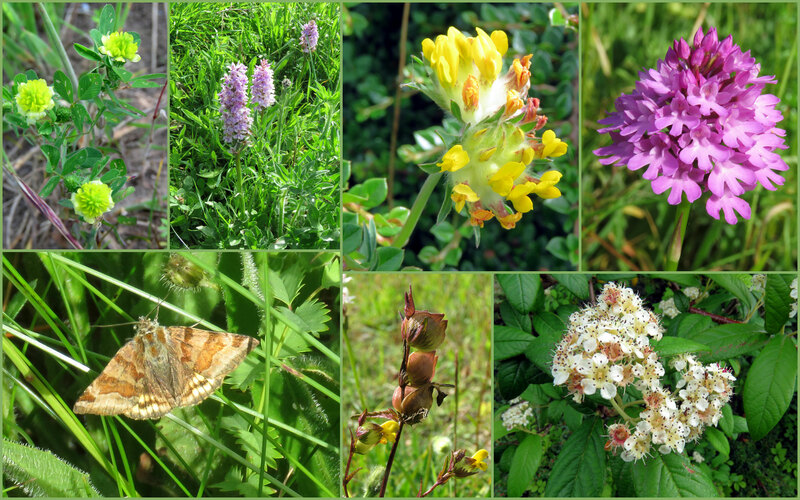 The meadow area was inhabited by Six-spotted Burnet Moths and after a few minutes I spotted a Small Blue Butterfly. 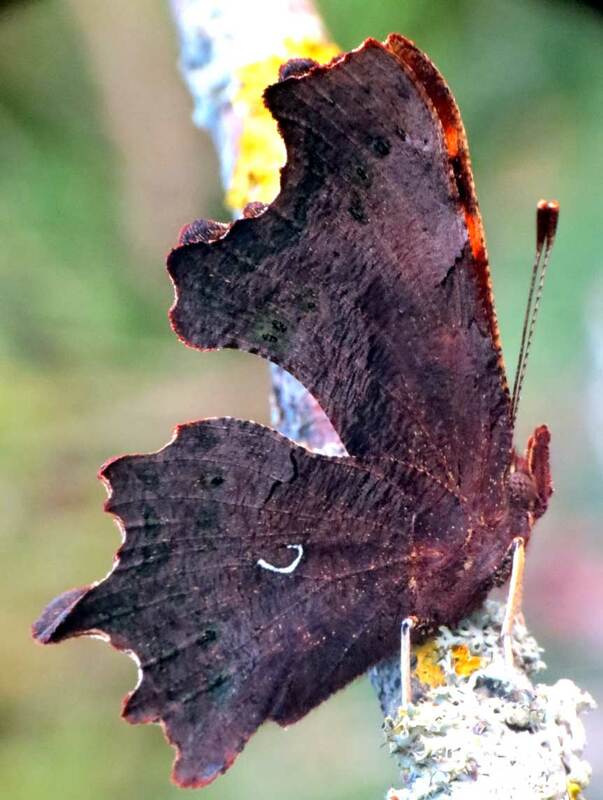 Amongst the Brambles a Speckled Wood arrived with a Gatekeeper and a Comma Butterfly. 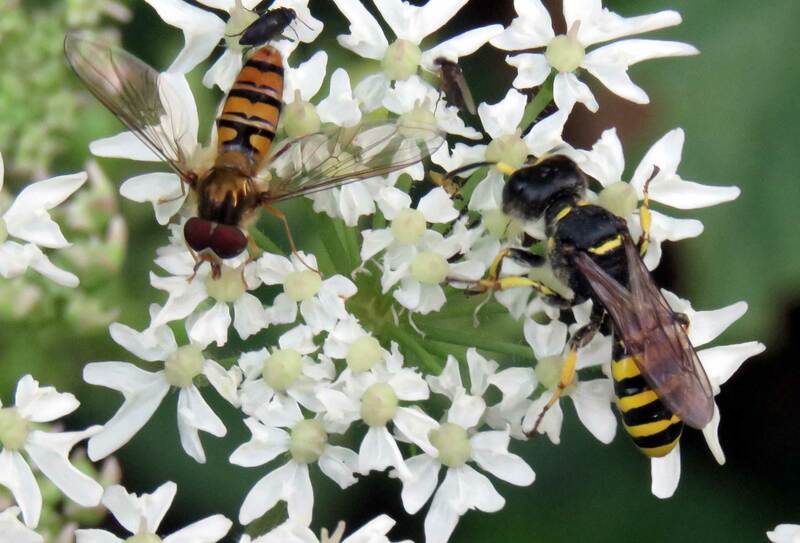 Hoverflies visited the Common Hogweed, Heracleum sphondylium. There was a Volucella zonaria hoverfly in the shade. 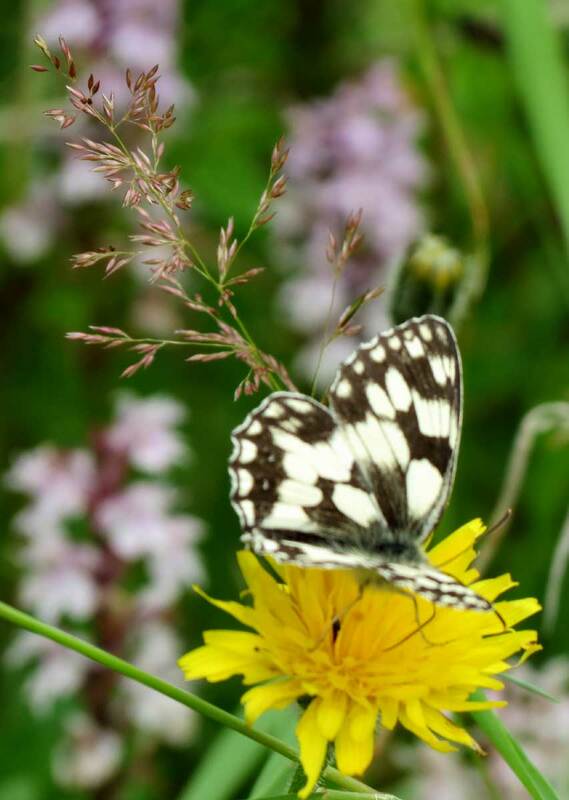 A Small White Butterfly was spotted over the Dovecote Estate. 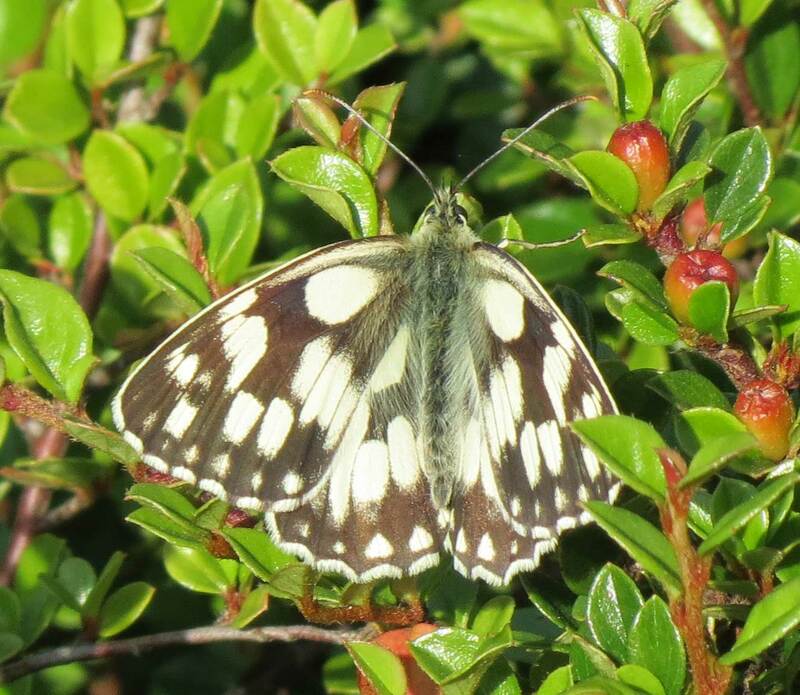 Within the Shoreham town boundaries the tally of butterflies were about ten Ringlets around Slonk Hill Farm Road (three north of the Bridge, and seven on the southern bank), with a few Small Whites and a few Large Whites seen in Shoreham town. On Buckingham Cutting (south) I added a handful of Small Blues, a Small Skipper and half a dozen Meadow Browns all seen immediately and a Comma and Gatekeeper added after ten minutes. 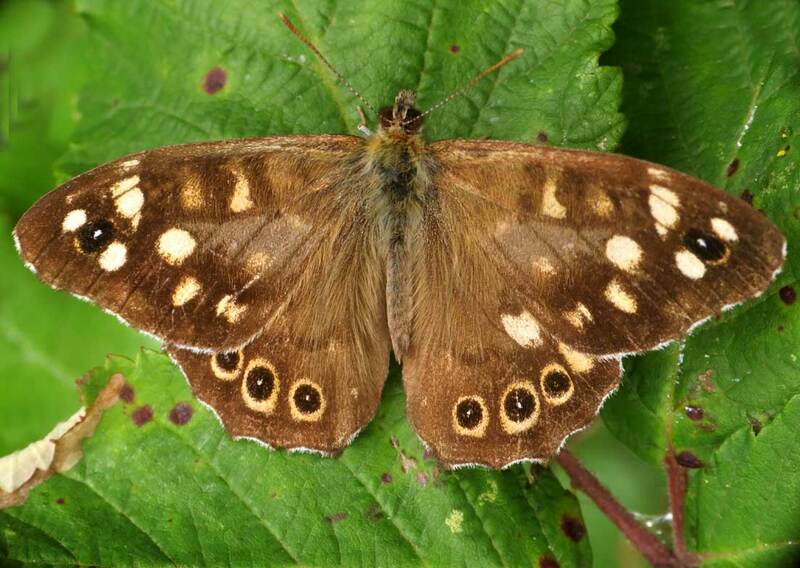 There was a Speckled Wood at the top of Buckingham Park. 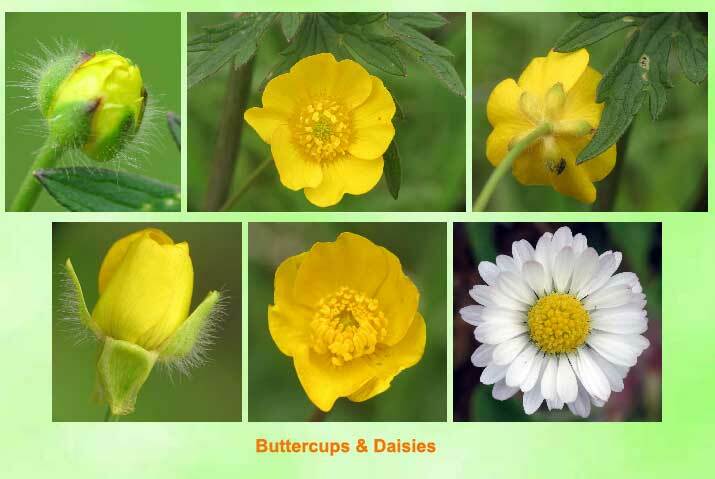 On a sunny day, I cycled along the linear copse path from Slonk Hill Drive to Buckingham Cutting (south) where I spotted a Speckled Wood Butterfly in the shade, and at Buckingham Cutting a dozen or so Small Blue Butterflies were fluttering around the Kidney Vetch now flowering. After a few minutes I managed to disturb a male Common Blue Butterfly, two unsettled Burnet Companion Moths and as I was about to leave after over five minutes a Cinnabar Moth flew rapidly out of the Cotoneaster. 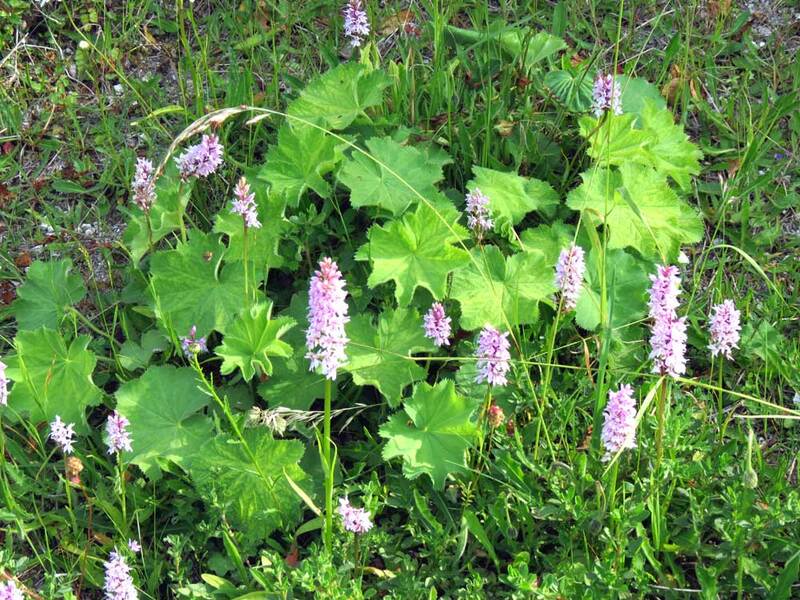 There were frequent small moths in the meadow-like road verge. 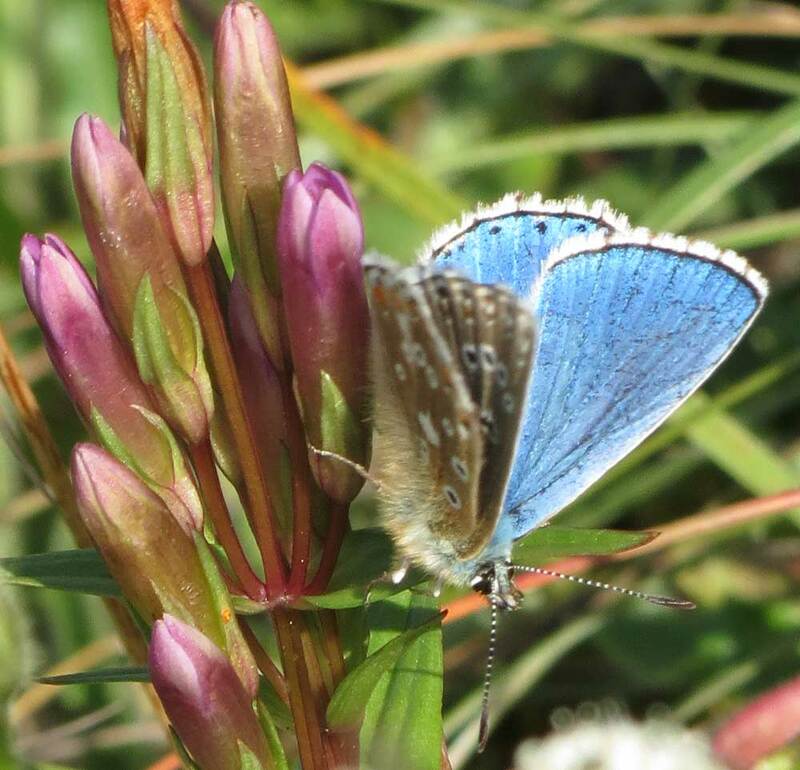 A Holly Blue Butterfly was spotted in Buckingham Park. 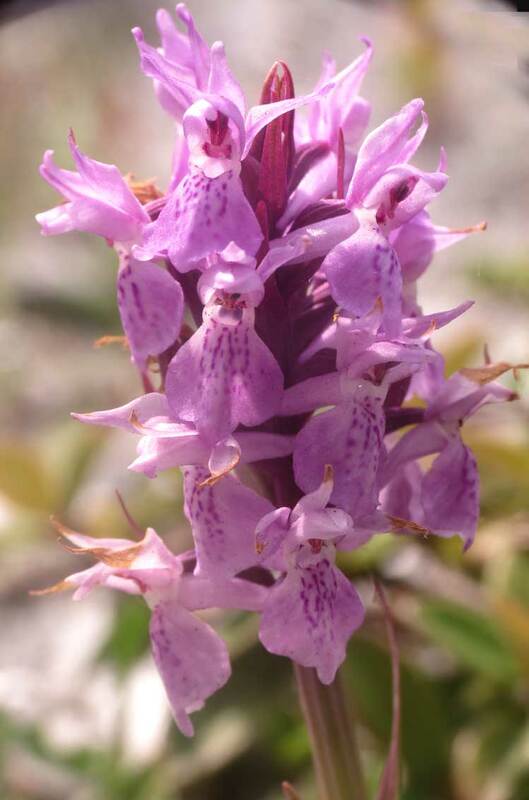 A few more Common Spotted Orchids appeared in flower on the southern back of Buckingham Cutting, north Shoreham where there were the first signs of flowering Kidney Vetch. 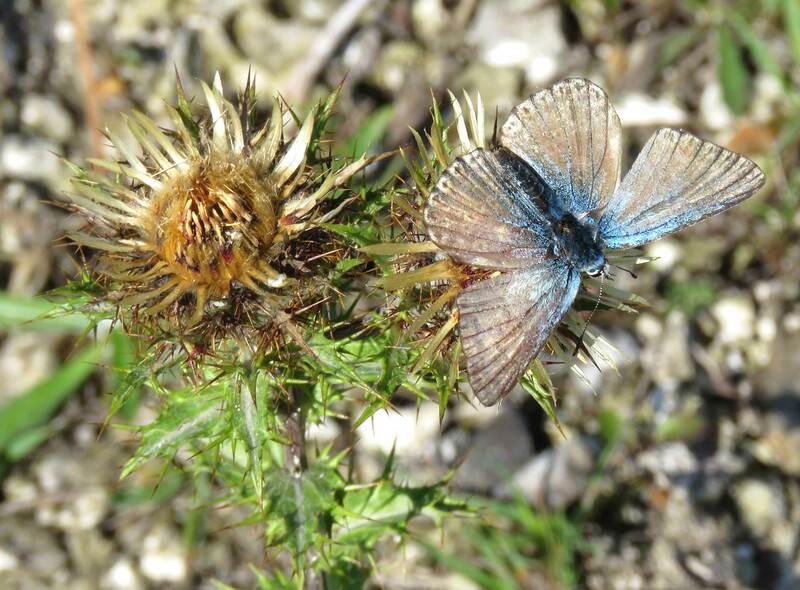 Butterflies present were a male Common Blue, a Speckled Wood and a pair of Red Admirals. The breeze was making spotting anything a little tricky. I caught a glimpse of my first definite Burnet Companion Moth of the year. 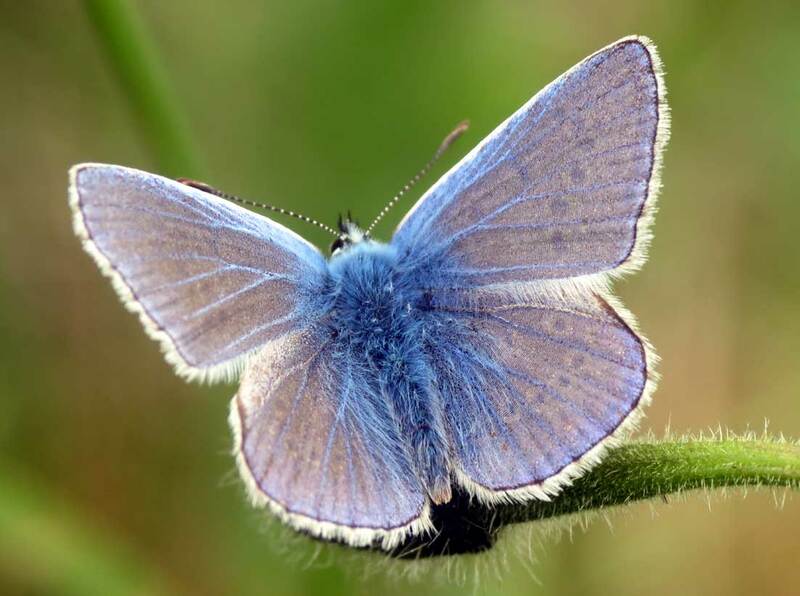 Such were the frustrations of the wind, that I was about to leave when I glimpsed the gentle fluttering of my first Small Blue Butterfly of the year. 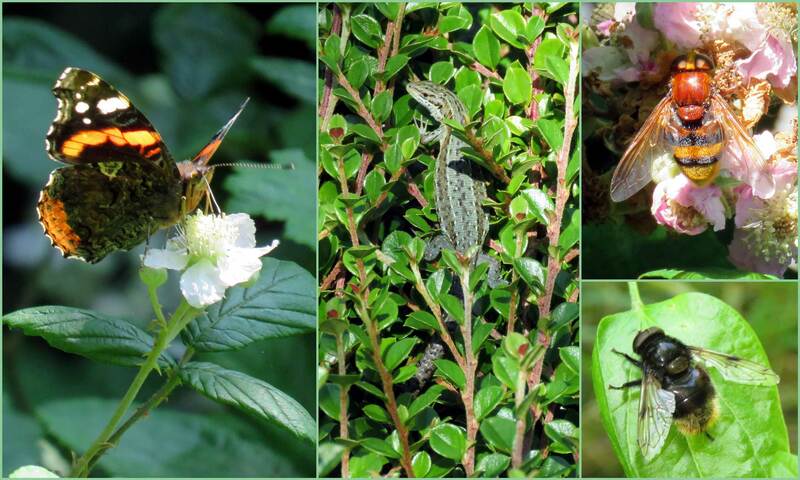 I chased it around and when it settled on the patch of Cotoneaster, I noted my first two Common Lizards of the year scrambling around the red berries and green leaves. I had never seen them amongst Cotoneaster before. A tiny spider Agalenatea redii had produced so many web threads on Salad Burnet that it almost obscured this predator and I had to brush them away before getting a poor photograph. 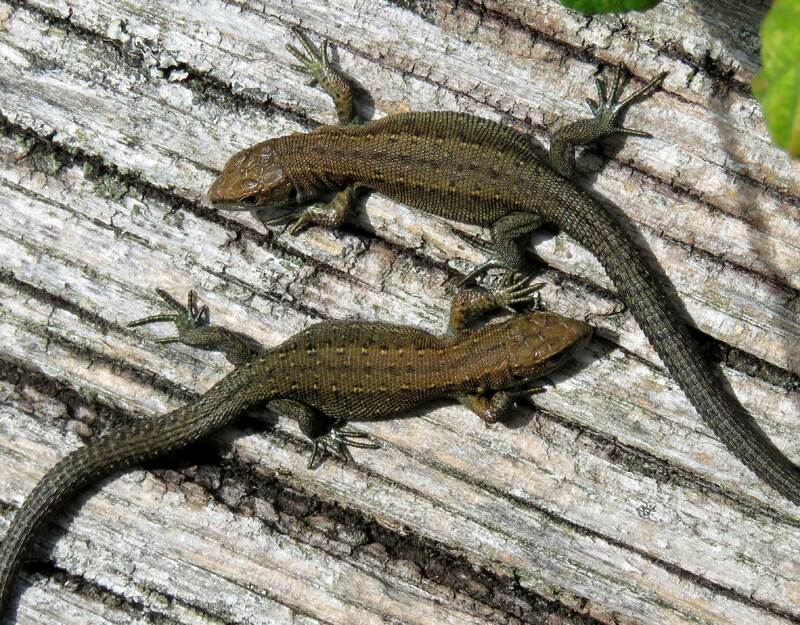 I spotted half a dozen stumpy Common Lizards, Lacerta vivipara, on the chestnut fencing at the top of the Pixie Path that had all lost part of ,or for two of them, almost all of their tails. 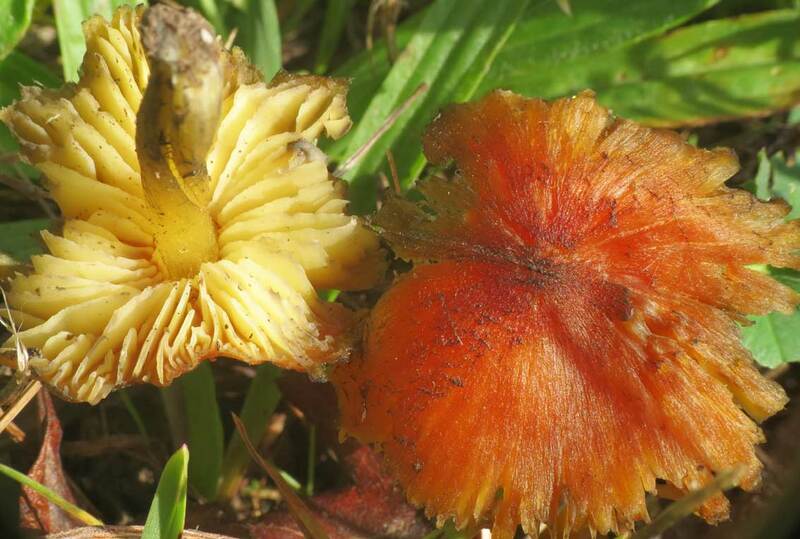 These were the first I have seen this year. 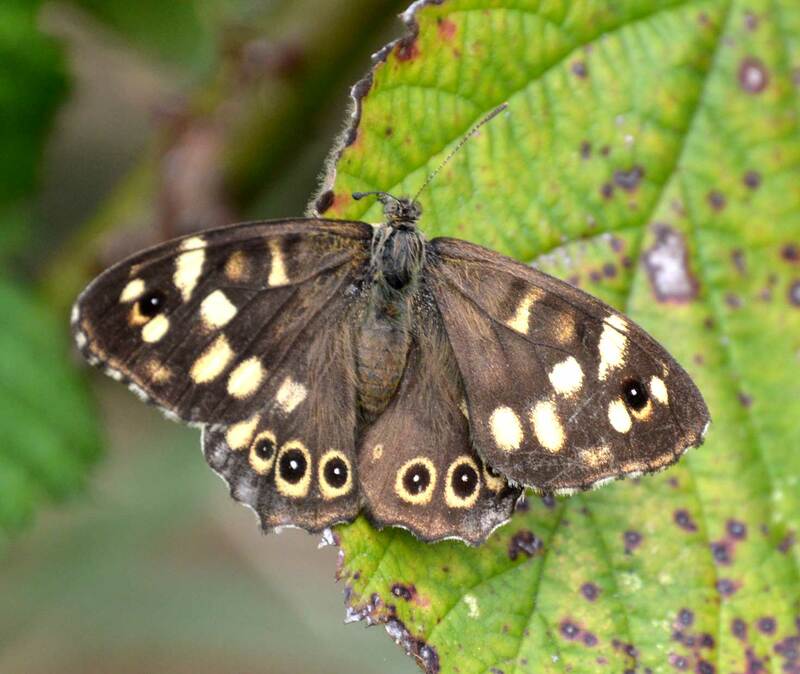 Two pairs of Speckled Woods were courting over the Waterworks Road, altogether 13 from there via the Pixie Path to Chanctonbury Drive north. A probable Wall Brown settled on the path but flew off before I could be sure. Other than that it was just Large Whites and no butterflies at all seen on Mill Hill Cutting SW.
By the time I decided to visit the road verges of the Mill Hill Cutting (SW) it was decidedly cool and a breeze has started. The pathway route was completely overgrown and impassable so I clambered over the chestnut fencing and rusty barbed wire. It was worth it for a dozen Chalkhill Blues simultaneously in flight with fresh males, worn males and a few very faded and worn females, as well as a solitaryCommon Blue female. This was all in an area scarcely larger than a town back garden. 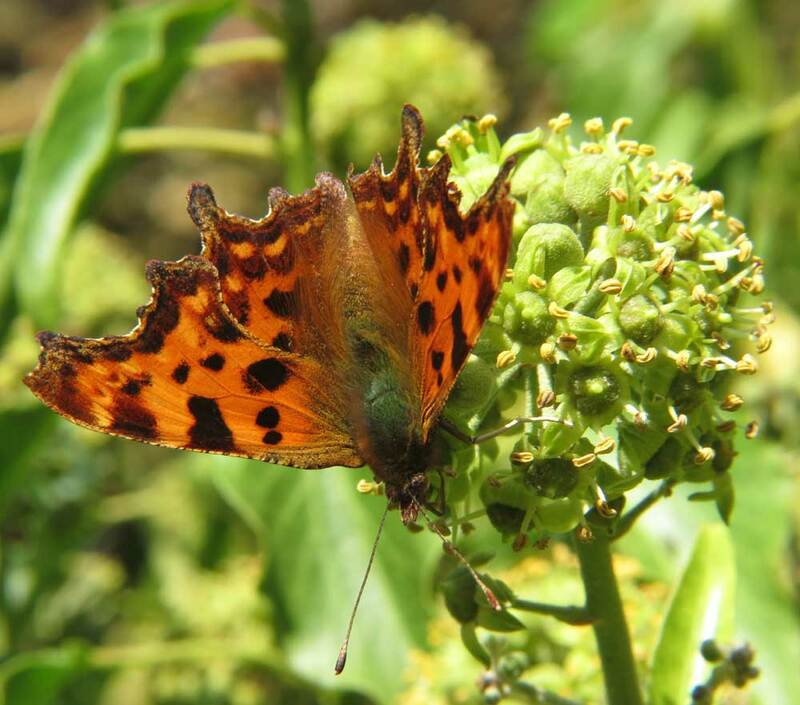 On the Pixie Path there were two Red Admirals rising from the Ivy, a Large White and a Speckled Wood. Also a Robber Fly, Machimus atricapillus, which are easily overlooked, landed on the chestnut fencing, on which it could be seen clearly. 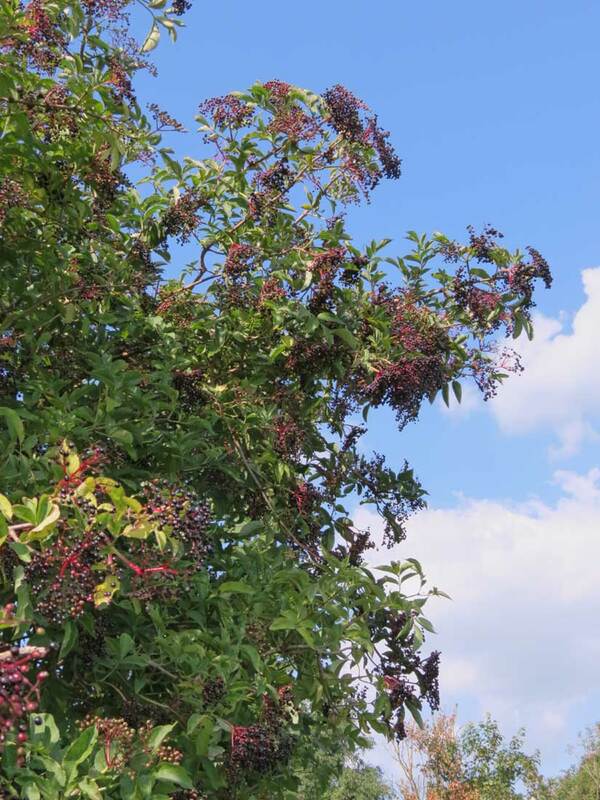 Wayfaring and Cotoneaster were in berry. It felt like autumn with a cooling breeze and berries on the bushes. 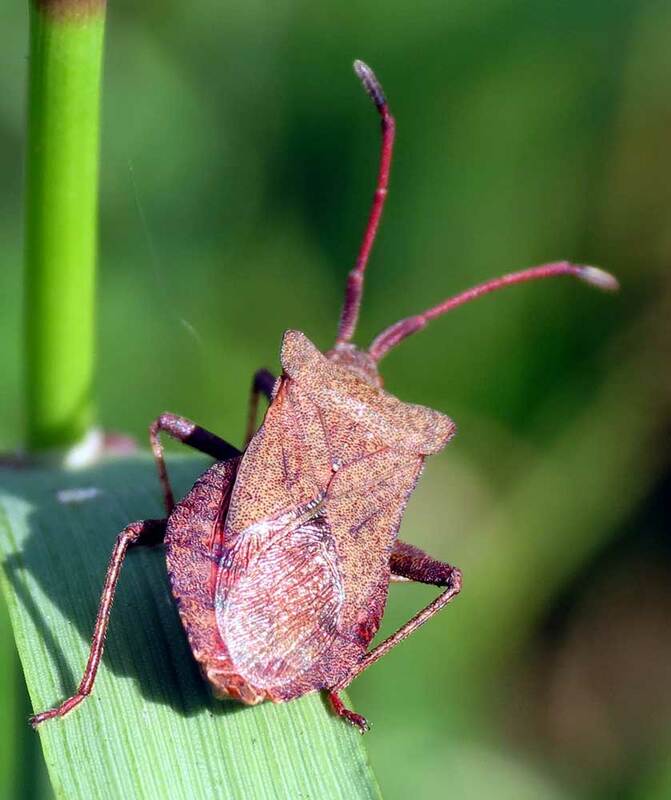 The road verges on the southern side of the A27 opposite Slonk Hill were devoid of anything of interest, no butterflies and the only thing that moved were active grasshoppers and a Silver Y Moth. The shaded woody areas turned out to be better but with just a Green-veined White Butterfly, a Holly Blue and finally a small yellow and black Digger Wasp Ectemnius sp. On a slightly cooler summer's day, a short detour to the outskirts of north Shoreham (top of The Drive & Buckingham Cutting south verge) was rewarded with a little more than expected: twenty Common Blue Butterflies (including courting couplets), at least one Brown Argus for the first time this year (only discovered after examining the underwing spots on photographs), two Small Blues (not seen yesterday), twenty plus Speckled Woods (including the ones at the north of Buckingham Park), an handful of Holly Blues, one Gatekeeper, one Meadow Brown, one Small Skipper, occasional Large Whites, a Brimstone Butterfly and a 6-spotted Burnet Moth. The second of two Southern Hawkers landed in front of me. This dragonfly is an avid butterfly predator as was a Hornet Robber Fly that looked ominous. On the warmest day of the year at 27.6°C (so far) I did not venture out to leave the Shoreham town boundaries and by late afternoon (5:00 pm) the breeze had cooled off the sunshine. The road verge at Buckingham Cutting (south) was empty of any butterflies at first but within five minutes, I saw two Gatekeepers, one Green-veined White, one Small White, one Large White, a few Speckled Woods, two Holly Blues, a Silver Y Moth, a Red Admiral and I finally disturbed a roosting Small Blue Butterfly. 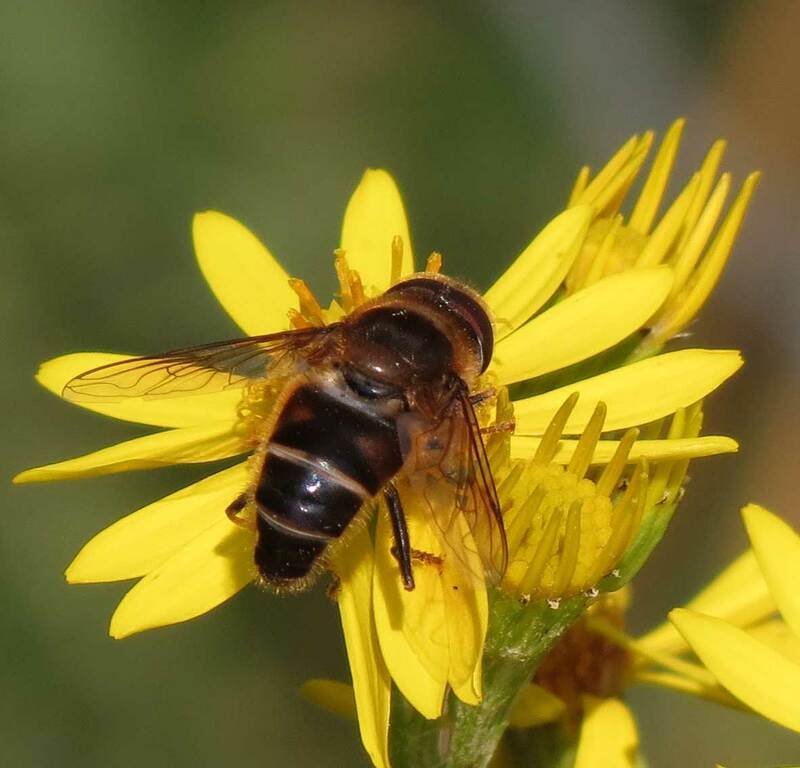 There was a Volucella zonaria hoverfly on Buckingham Cutting (south). 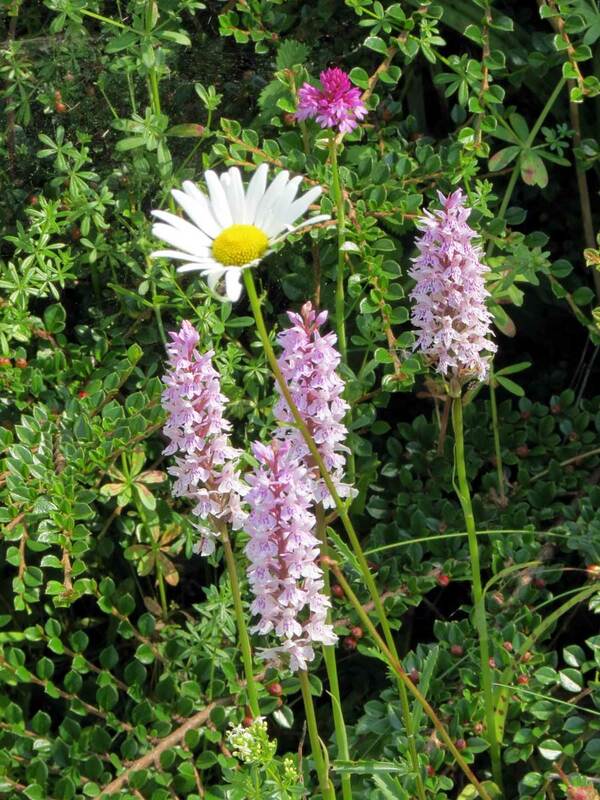 Road verges can often be productive in wild flora and fauna, and the road verge on south side of the road south of Buckingham Barn is conveniently located within the Shoreham town boundaries. 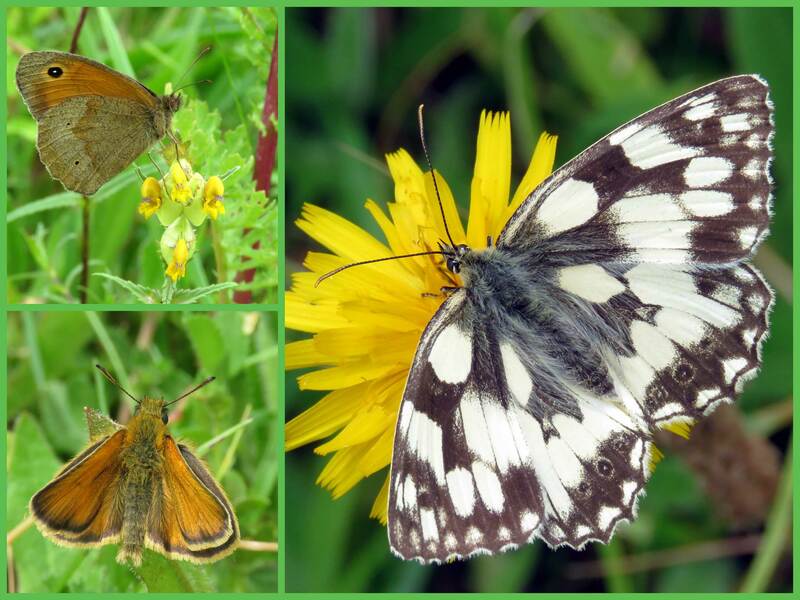 On an overcast afternoon, the butterflies were not very lively, but two Meadow Brown Butterflies were seen immediately followed a minute or so later by a settled Large Skipper and a restless Marbled White. Then nothing for quarter of an hour until I glimpsed a bright Red Admiral over the Brambles to the south of the path. I was pleased to spot the Large Skipper as I only see a handful very year, but more surprised by my earliest ever Gatekeeper in the long grass and dense vegetation. 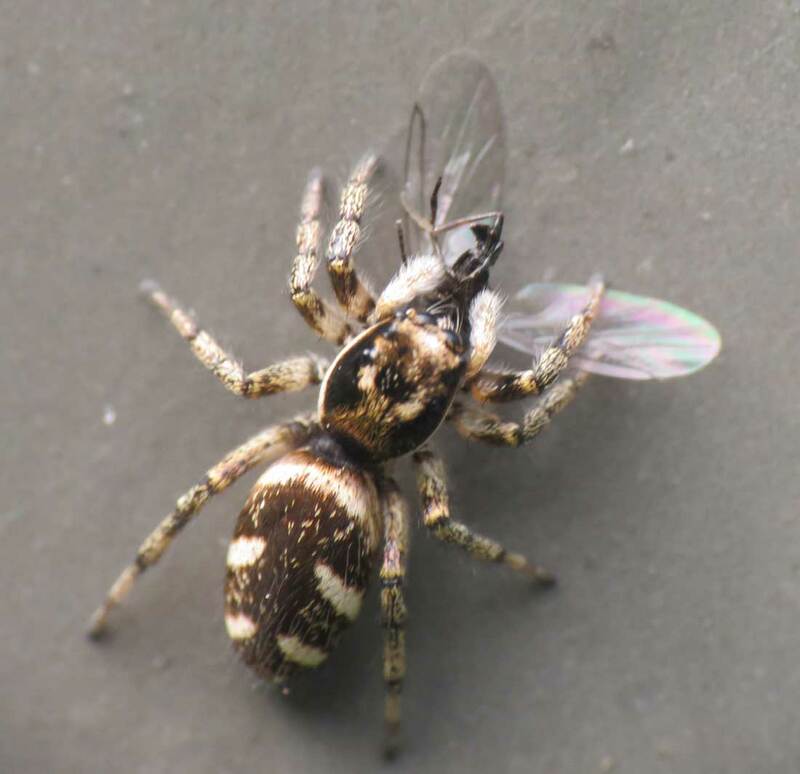 I had to chase it around to confirm its identity as a fresh male specimen. 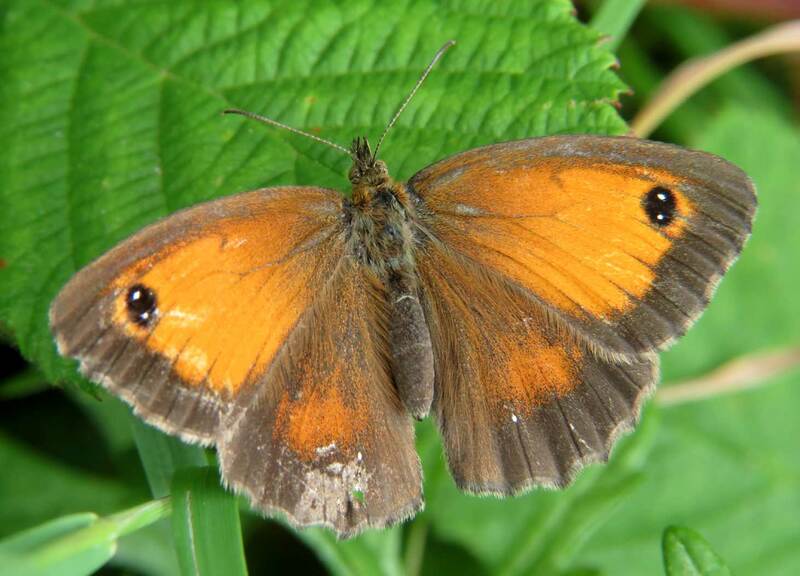 This was a first record of a Gatekeeper in Sussex this year. 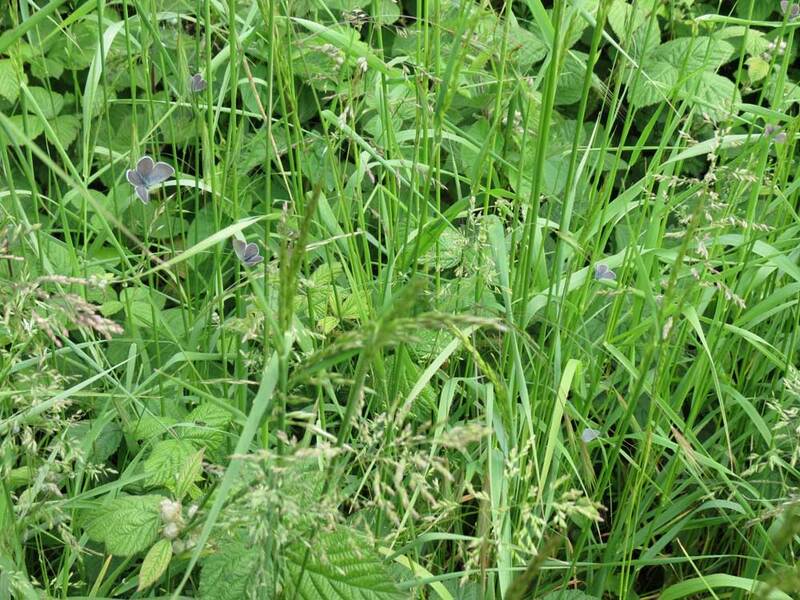 A Silver Y Moth was similarly elusive in the meadow-like vegetation. 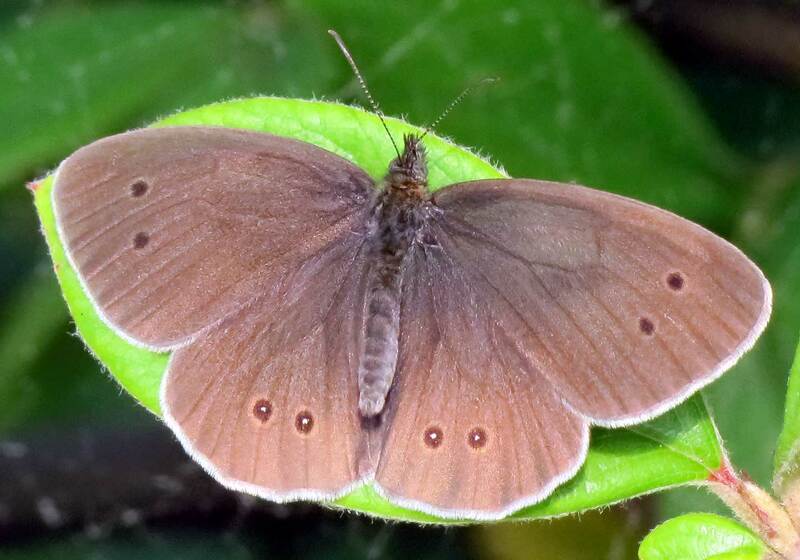 The slow looping flight of a butterfly on the southern bank of the A27 opposite Slonk Hill was characteristic of my first Ringlet Butterfly of the year. Despite its languid flight it fluttered over a lot of the verge meadow, over the last of the Spotted Orchids, and there were at least four seen in this area on a sunny mid-afternoon, with a Red Admiral. 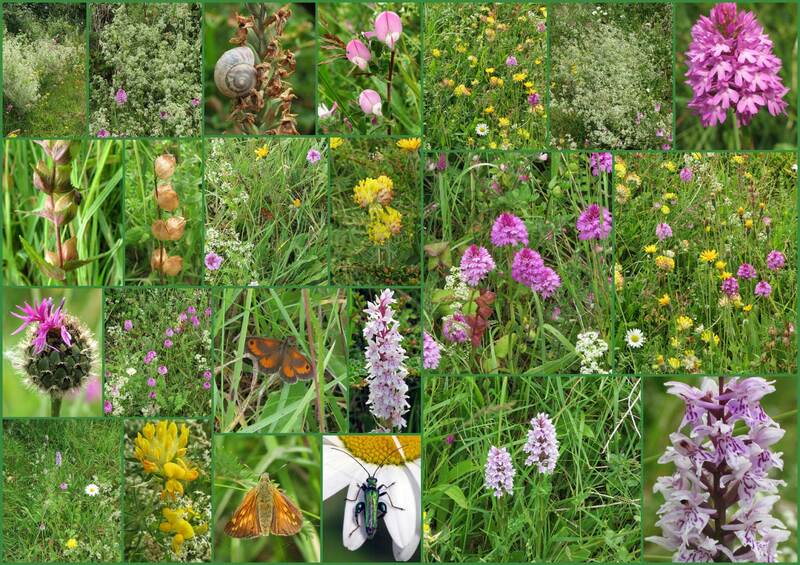 I cycled the narrow path through the linear copse up to the road embankment opposite Buckingham Barn where the verge had a more colourful flower display in whites (Ox-eye Daisies, Hedge Bedstraw, Bramble), yellows (Kidney Vetch, Greater Bird's Foot Trefoil, Yellow Rattle) and purples (Spotted Orchid, Pyramidal Orchid, Greater Knapweed). 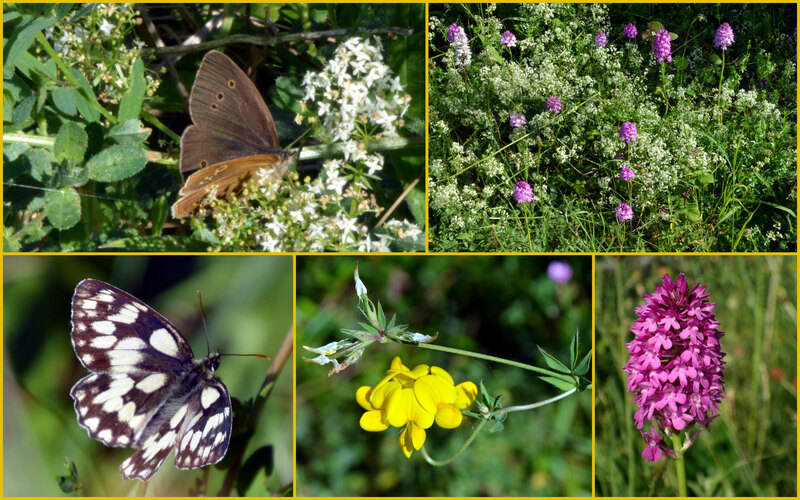 The flowers attracted two Meadow Brown Butterflies, six more Ringlet Butterflies, a courting pair of Small Blues (there were probably more), two restless Marbled Whites and my first Burnet Moth of the year. It was in its familiar whirring flight so I could not counts its spots. 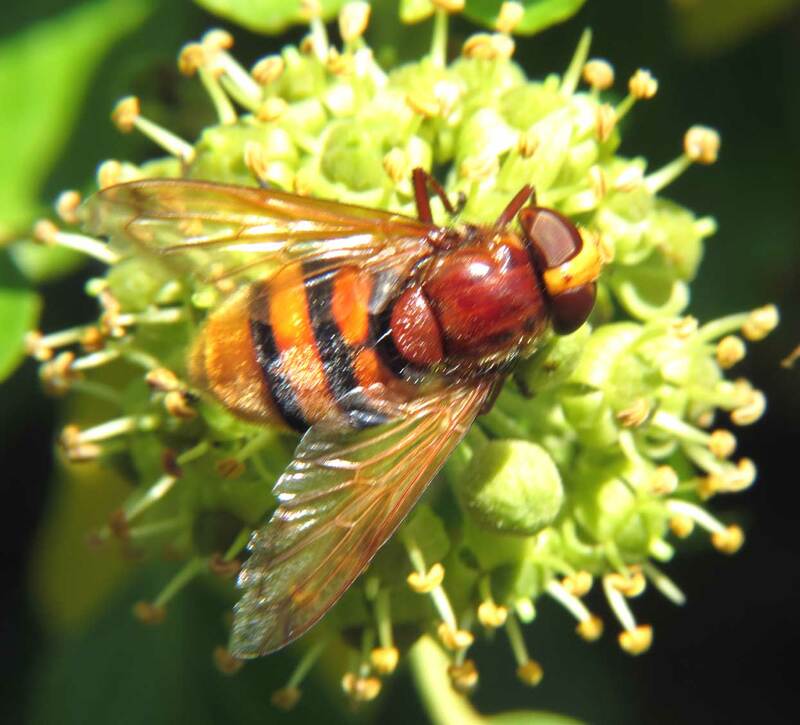 As I was leaving I spotted by first of the year of the most impressive of hoverflies Volucella zonaria. 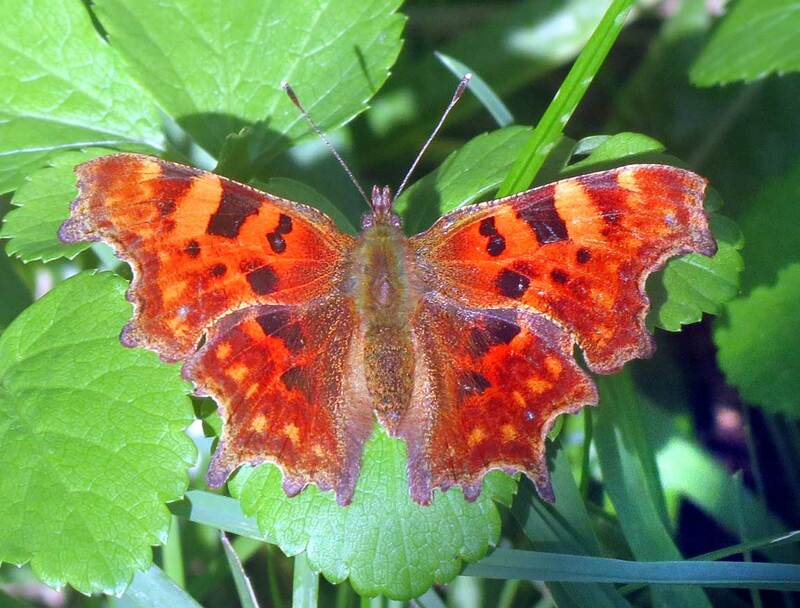 On a hazy day I took a detour up the overgrown Pixie Path (FP 3138) where I spotted a Yellow Shell Moth, followed by a courting pair of Comma Butterflies and a courting pair of Small Tortoiseshells. 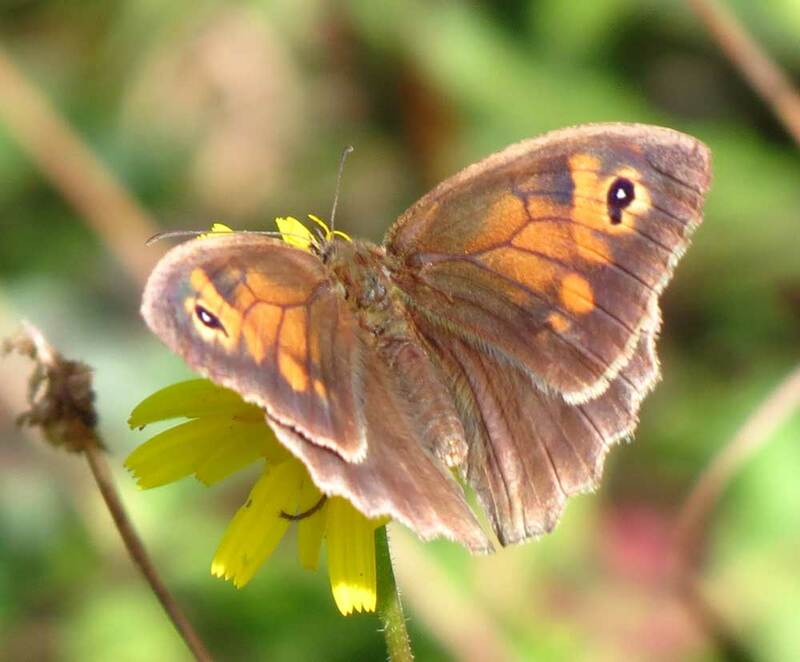 A Meadow Brown was seen in the long grass of Frampton's Field. 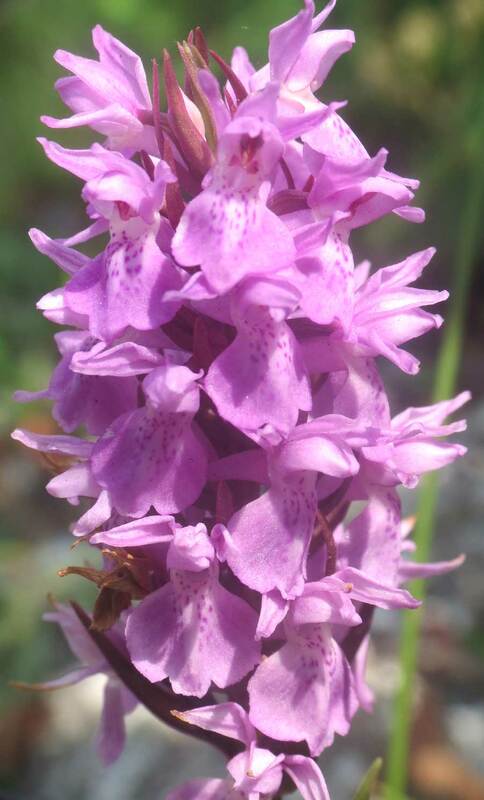 Three species of orchid were seen on the Mill Hill Cutting SE bank: Common Spotted Orchid, Pyramidal Orchid and Southern Marsh Orchid. A bit later than in most years, I discovered my first Small Blue Butterflies of the year on my first visit to the southern road bank opposite Buckingham Barn, north Shoreham. These tiny butterflies were hiding in the tall vegetation in the late afternoon, but after four minutes I spotted the first pair of about ten butterflies basking on some green leaves. 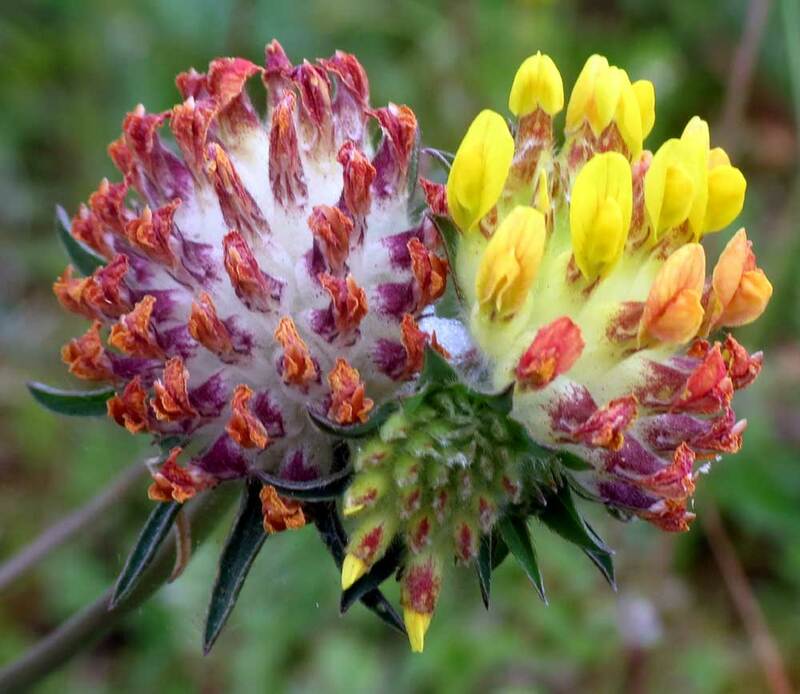 Kidney Vetch was beginning to flower nearby (caterpillar plant of the Small Blues) with a spiky display of Common Spotted Orchids and a first glimpse of the yellow flowers of Yellow Rattle. A Pyramidal Orchid was budding. After the over night rain deluge, the weather cleared and there was even a enough warmth for the surviving butterflies to be discovered in the breeze. 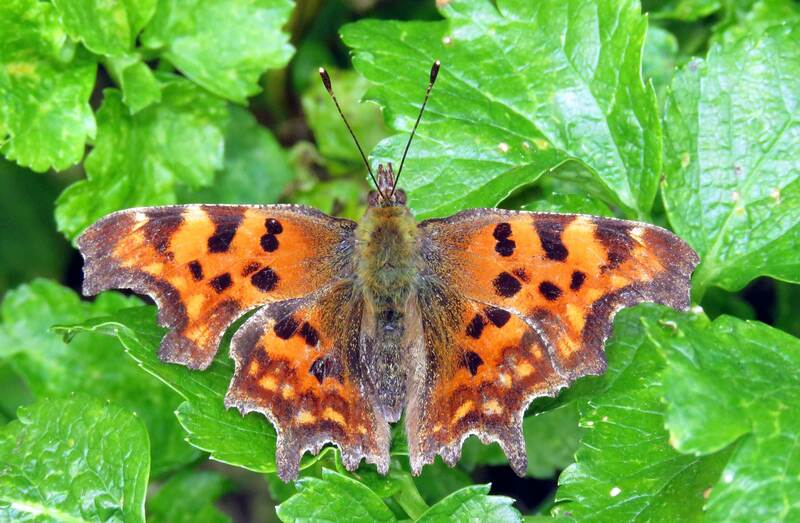 A flighty Red Admiral was seen over the Waterworks Road, Old Shoreham and a resting Comma on the Pixie Path. A flock/parliament of over twenty Rooks descended on Frampton's Field, a horse pasture halfway up the downs from Old Shoreham. On a warm breezy day, I made detour on the outskirts from Old Shoreham via the Waterworks Road on Footpath 3138 to Mill Hill Cutting (SW) and up the Pixie Path and back home through the Dovecote Estate. 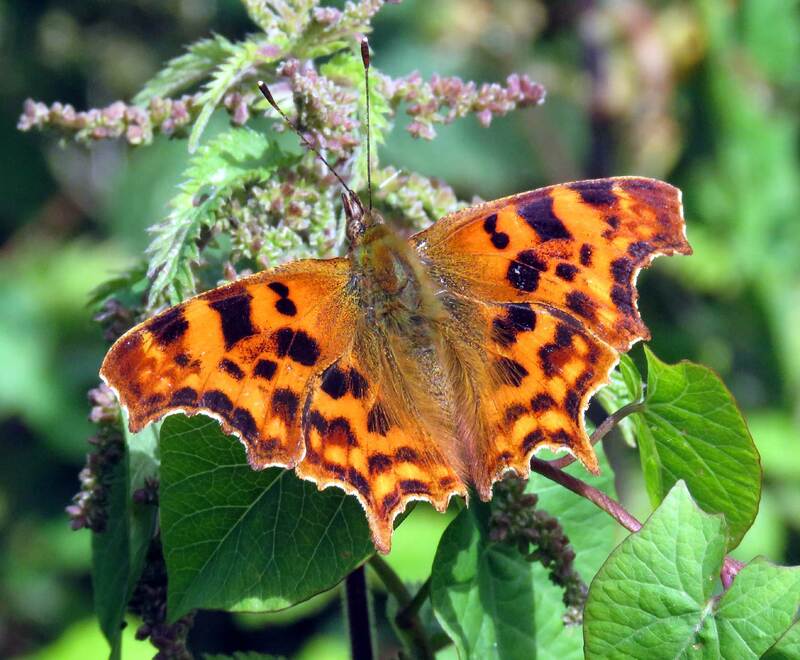 The butterflies seen were the frequent Large Whites and Small Whites, with a tattered Comma added on the edge of the Waterworks Road, with a few Speckled Woods. Frampton's Field and the path hosted Meadow Browns. Amongst the Ivy and Brambles there was a Holly Blue. 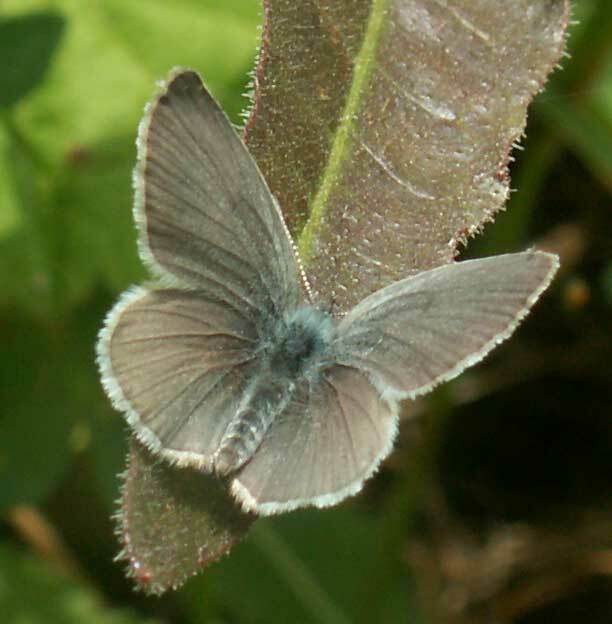 On Mill Hill Cutting, there were at least seven Chalkhill Blues including at least two females, with one seeing depositing an egg, but alas, not on the leaves of Horseshoe Vetch. 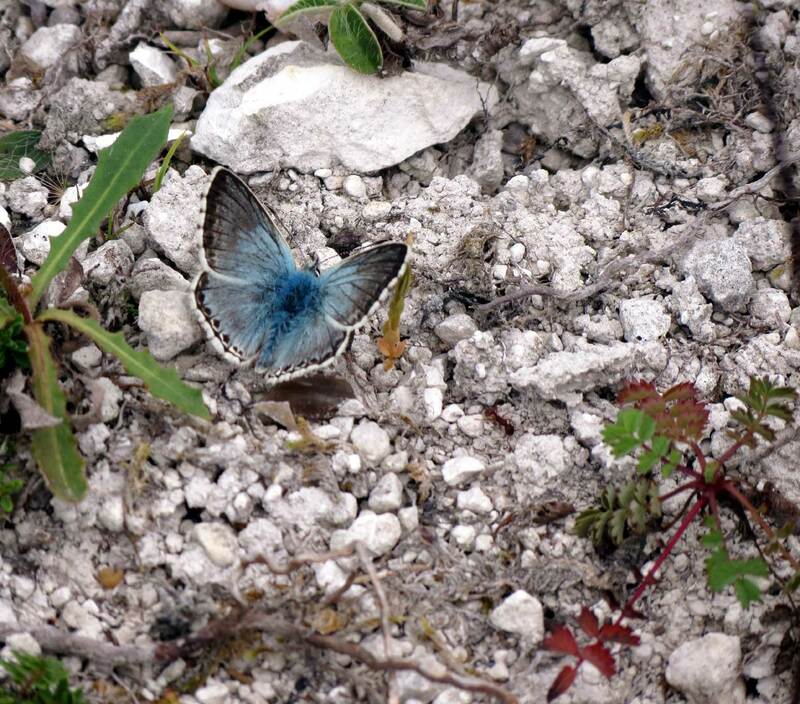 Common Blues fluttered around on the chalk embankment. 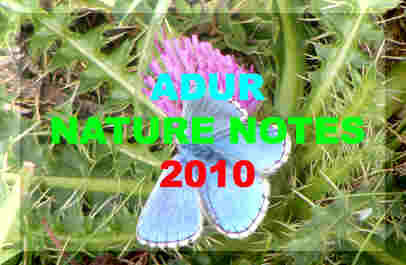 A Red Admiral over and one was seen before in Shoreham. 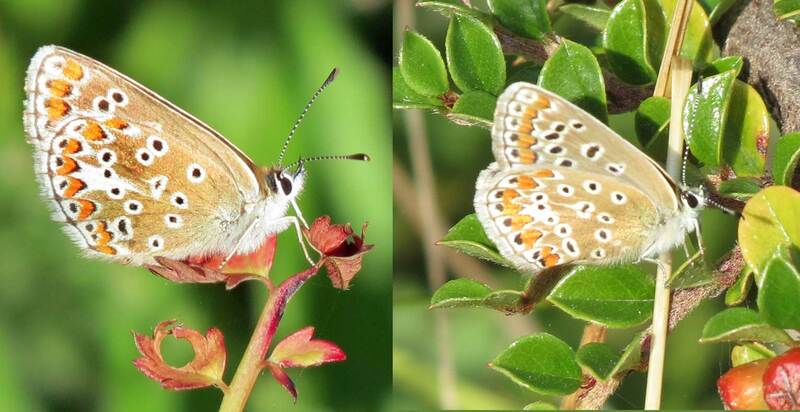 And then was the mystery brown butterfly photographed on the left which I have tentatively identified as a female Adonis Blue. There is a snag as no males were seen in the small area on the day and no females have been seen in the immediate area in previous years. Loaded Elderberry bushes drooped over the path through the Waterworks Road to Mill Hill Cutting (SW) produced Large Whites (frequently seen everywhere) a Red Admiral and a dozen or so Common Blues. 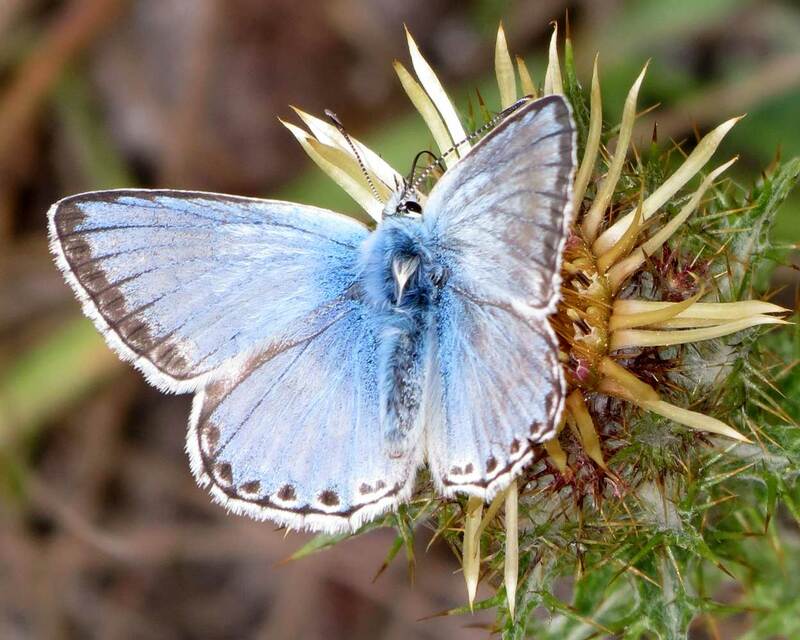 Mill Hill Cutting immediately produced half a dozen male Chalkhill Blues in flight in a total of 12 males seen in two minutes, and I disturbed simultaneously a surprising 13 female Chalkhill Blues in amongst the Horseshoe Vetch, Hippocrepis comosa, leaves. 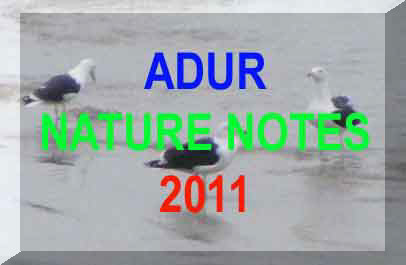 The females were all seen in an area of four square metres and this is an unprecedented density locally for the females. The Pixie Path on the west-east section (running parallel with the A27) hosted three Wall Browns, a few Speckled Woods, a few Meadow Browns and Holly Blues. Warm and humid and overcast and the summer weather has not broken yet. 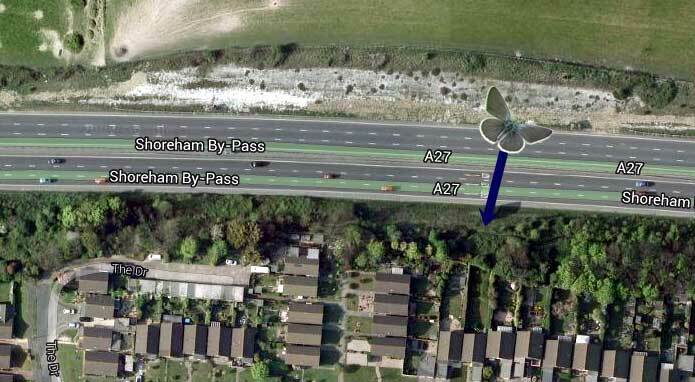 I made a rather unusual trip on the outskirts of Shoreham, the full length of the footpath surrounding Frampton's Field, starting at the The Street entrance and ending at the top of Mill Hill Road without crossing the bridge over the A27. Large Whites were the most widespread of the butterflies found in Shoreham town, but this route added occasional Holly Blues by the Ivy, a Red Admiral basking on the wooden footpath sign by the Butterfly Copse (juxta the Waterworks Road), a Peacock Butterfly on the Buddleia, a few Meadow Browns on and around the path, frequent Common Blues on the path and in Frampton's Field, a Small Tortoiseshell with a bite out of its wing, and a few Speckled Woods at the top of the Pixie Path by the hedge. 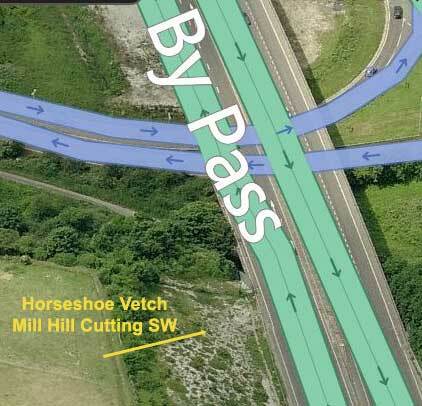 At the north-west corner of Frampton's Field it was possible to fight my way through the Brambles on the route of the old footpath to Mill Hill on to an area which I have names Mill Hill Cutting (SW) where a Small White Butterfly opened and then closed its wings. 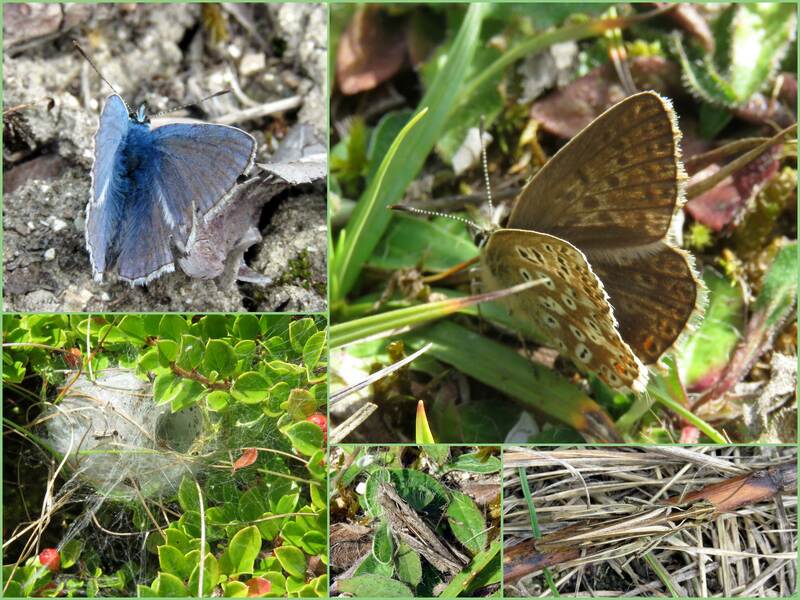 In an area of about twenty square metres of bare chalk bank covered with clumps of Horseshoe Vetch, Cotoneaster and the leaves of Mouse-eared Hawkweed, there was a fabulous showing of too many Chalkhill Blues to count accurately as I lost count at thirty, but estimated to be forty including ten females (I gave up counting these at seven) plus occasional Common Bluesof both genders to confuse the count. 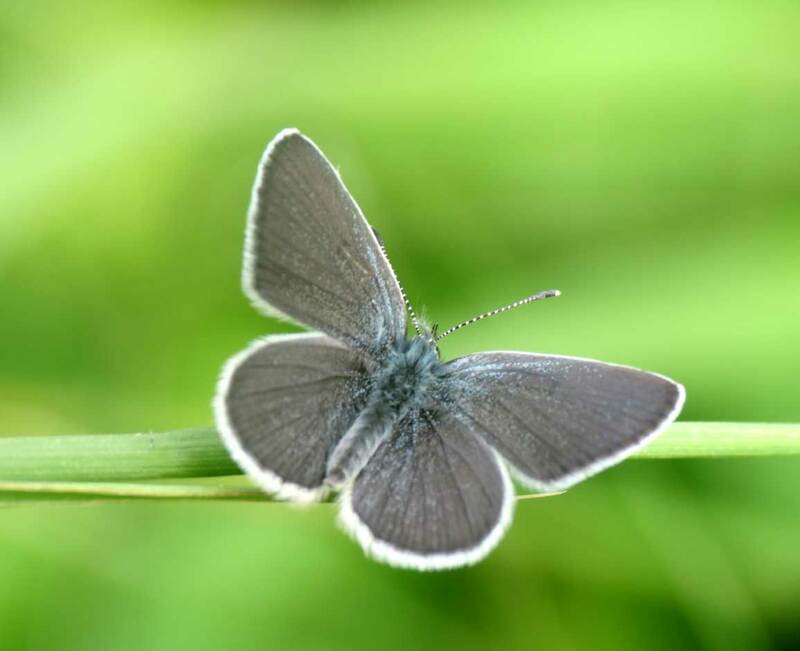 This count extrapolates to 800 Chalkhill Blues per acre which is the maximum density expected in a good year (and not seen on Mill Hill since 2003). 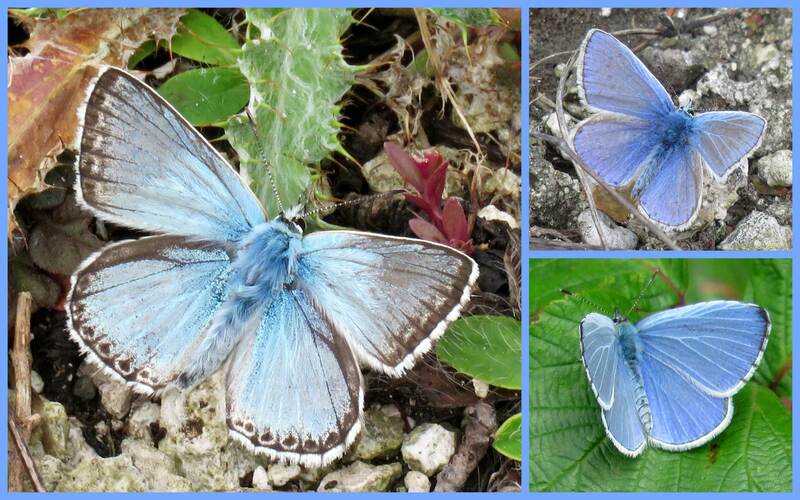 Most of the Chalkhill Blues were rather worn and tattered with a few with just minor damage. The pairs were courting and the females were laying eggs. There were also frequent Silver Y Moths. 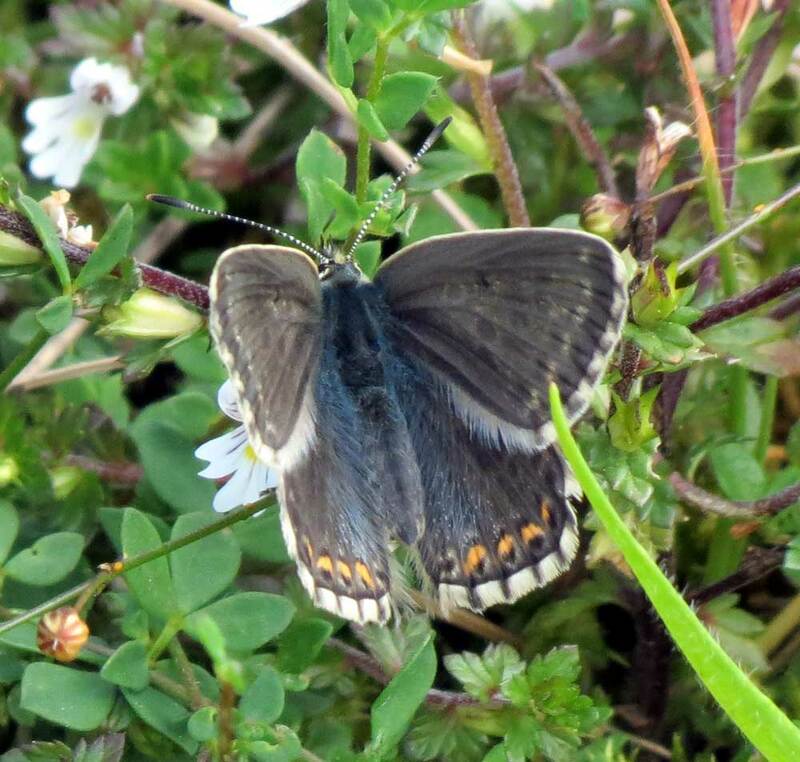 A partly tattered Small Blue Butterfly from Buckingham Cutting (south) was added to the list of the previous day, but despite having a close look at the Common Blues, I could not add a Brown Argus to the list. They were all female Common Blues. The list within the boundaries of Shoreham added Large Whites, Small Whites, Meadow Brown 1, Gatekeeper 1, Holly Blues, Speckled Woods only. Silver Y Moths were frequently seen in the undergrowth on the verges of the A27 at Buckingham Cutting (south) and Slonk Hill Cutting (south). I walked Path 3138 through the Waterworks Road and up the Pixie Path recording the butterflies in the order of first seen: Large White, Green-veined White, Small White, Holly Blue, Speckled Wood, Comma, Peacock, Small Tortoiseshell, and Gatekeeper, all seen in a few minutes at the bottom of the path around the Butterfly Copse with its Buddleia and Stinging Nettles. 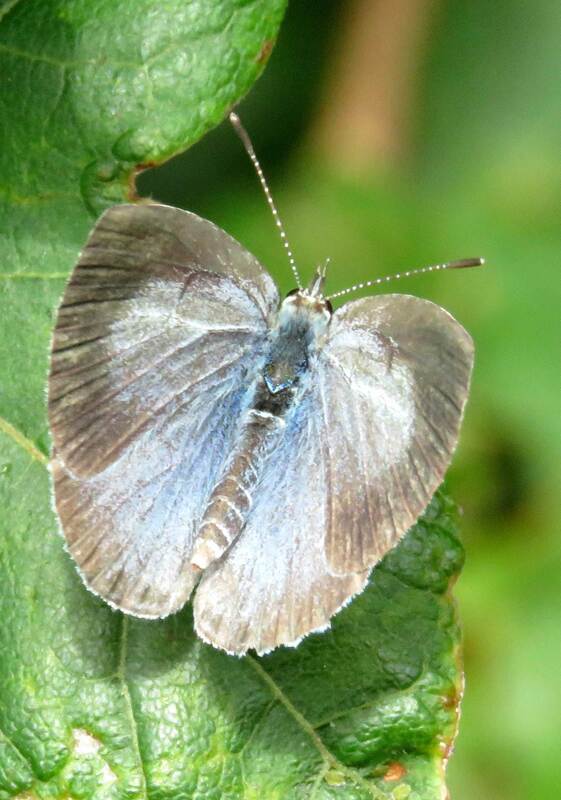 Mill Hill Cutting (south) added about fifteen Chalkhill Blues (including two females). Frampton's Field added occasional Meadow Browns and Common Blues. 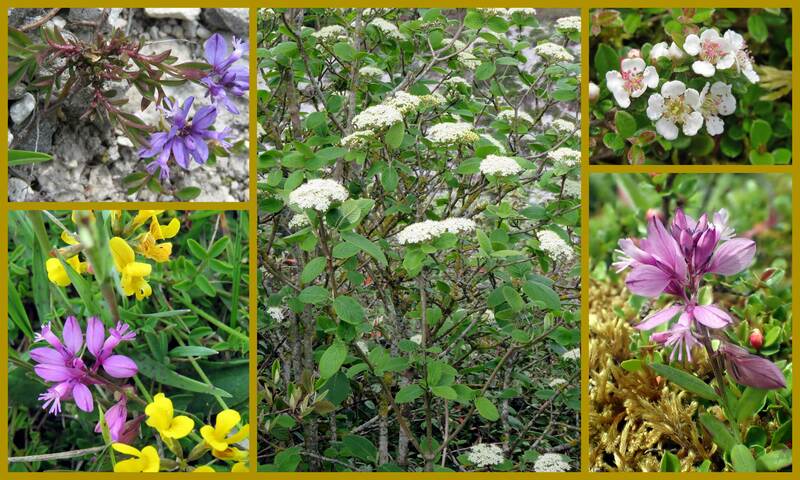 There were more Speckled Woods and Holly Blues at the top of the Pixie Path. A Wheatear flew rapidly into the bushes. Too breezy and overcast to visit the downs, I did venture to the top of The Drive where there were a few Speckled Woods, and to Buckingham Cutting (south) where there was Common Blue but no Small Blues in the early evening when butterflies should be roosting. 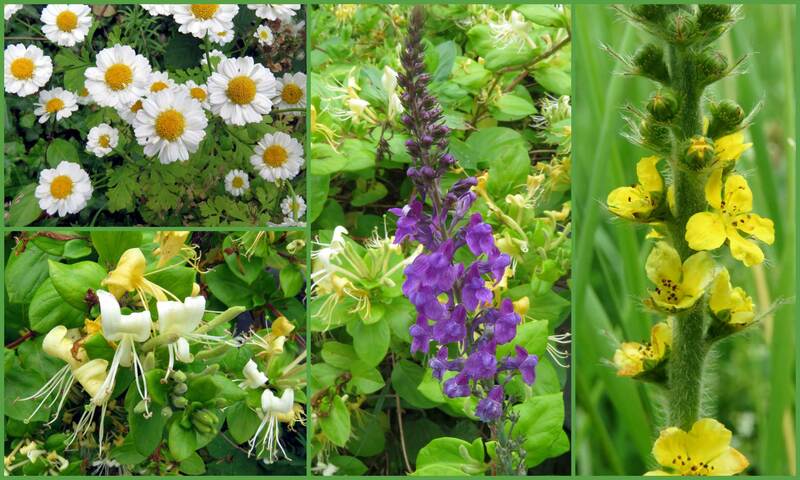 Green-veined Whites and both Large Whites and Small Whites were identified and a Red Admiral fluttered over. A Silver Y Moth flew out of the meadow vegetation. A few Holly Blues fluttered over the scrub/hedgerow, and I disturbed a few Meadow Browns, but no Ringlets, on the meadow-like road verges opposite Slonk Hill. Under a cloudy sky I decided on a purposeful detour from the Waterworks Road up the Pixie Path to Mill Hill Cutting (SW) a route I had not taken since 27 July 2013. I soon recorded a definite Green-veined White and a definite Small White Butterfly, the first of two Holly Blues (not recorded the previous day) and inevitable Gatekeepers and Large Whites before I fought my way though the Brambles to the north-facing southern bank of the A27 verge which is Mill Hill Cutting (SW). 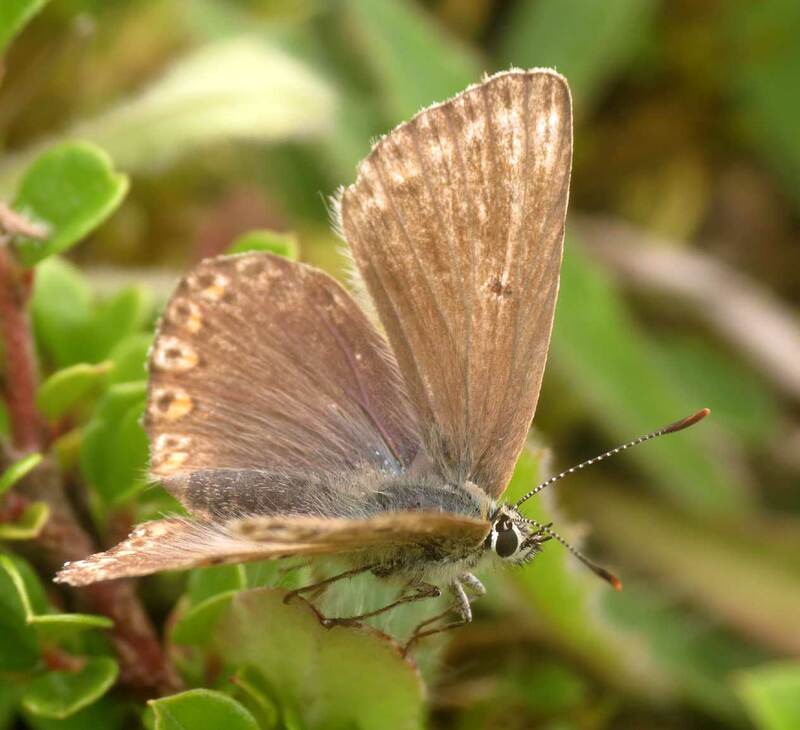 Despite being overcast eight male Chalkhill Blues were seen immediately flying simultaneously. As conditions were good for photography, I stayed around in this garden-sized area and at one time I estimated fairly accurately that their were thirty males and two female Chalkhill Blues. The males did not seem to be chasing the females as much as quarrelling with each other. 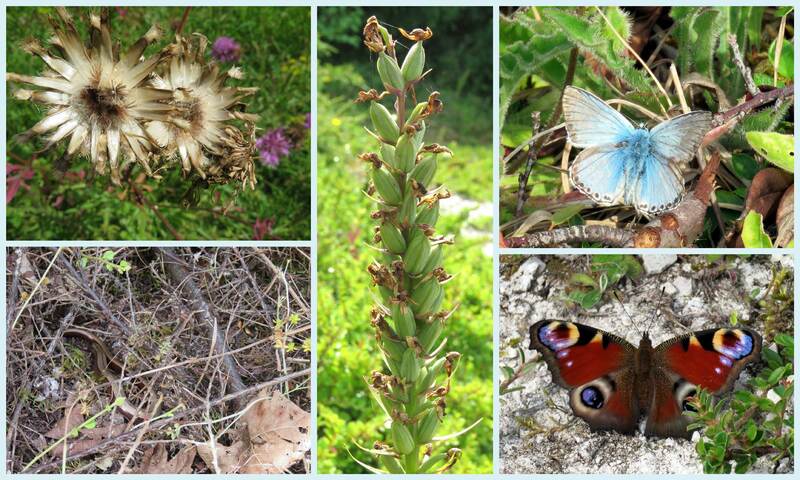 They used the few newly flowering Carline Thistle as nectar sources, but there were more butterflies than these plants. 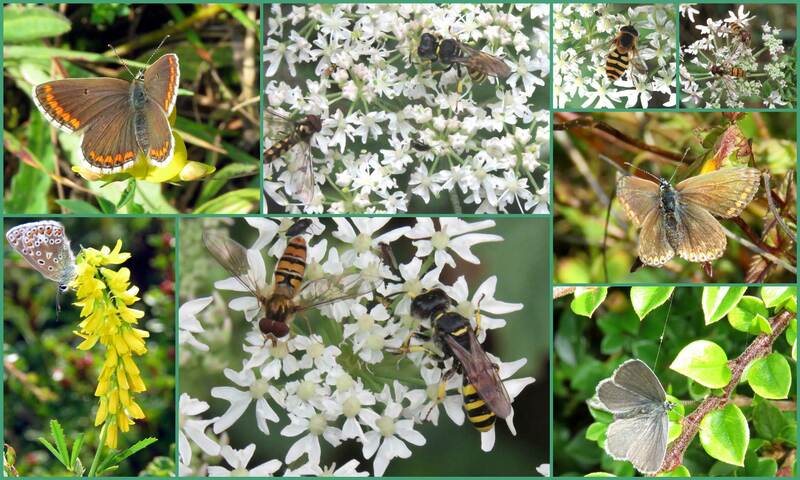 Silver Y Moths hid amongst the Cotoneaster. Advertising its arrival with a distinctive call, a Green Woodpecker arrowed its way across Frampton's Field from north to south. It flew at low level less than a metre above the long grass as the horse pasture had now in a large part become a meadow. So it was surprising I did not see any Meadow Brown Butterflies, but one flying Six-spotted Burnet Moth and a Peacock Butterfly over Frampton's Field. 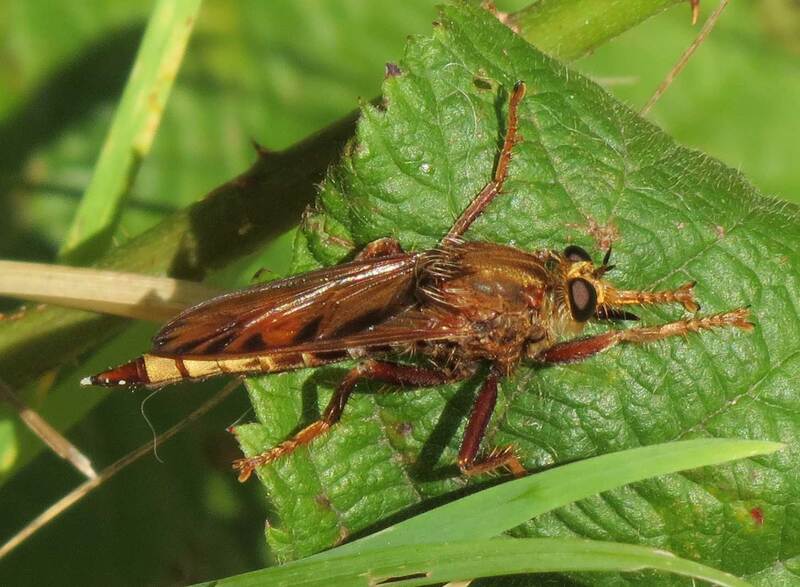 A Hornet Robber Fly, Asilus crabroniformis, landed on the path in front of me, shortly followed by a second brood Wall Brown Butterfly that appeared very briefly. At top of the Pixie Path bordered by the hedge, there was a handful of Speckled Woods. 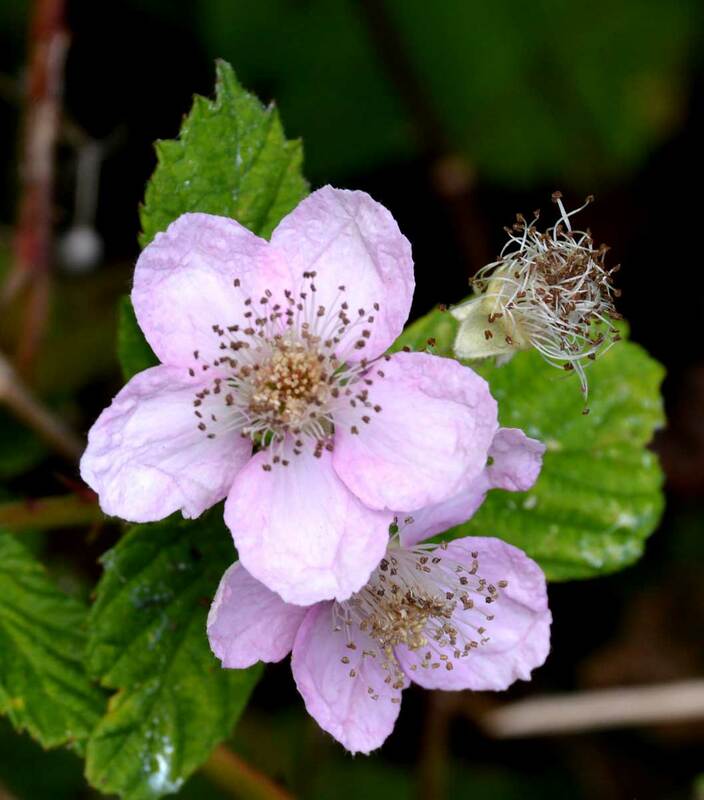 Worker bumblebeeswere active amongst the Bramble flowers with the first blackberries ripening. The bumblebees were frequent Red-tailed Bumblebees, Bombus lapidarius, slightly less frequent Buff-tailed Bumblebees, Bombus terrestris, and occasional Common Carder Bees, Bombus pascuorum. 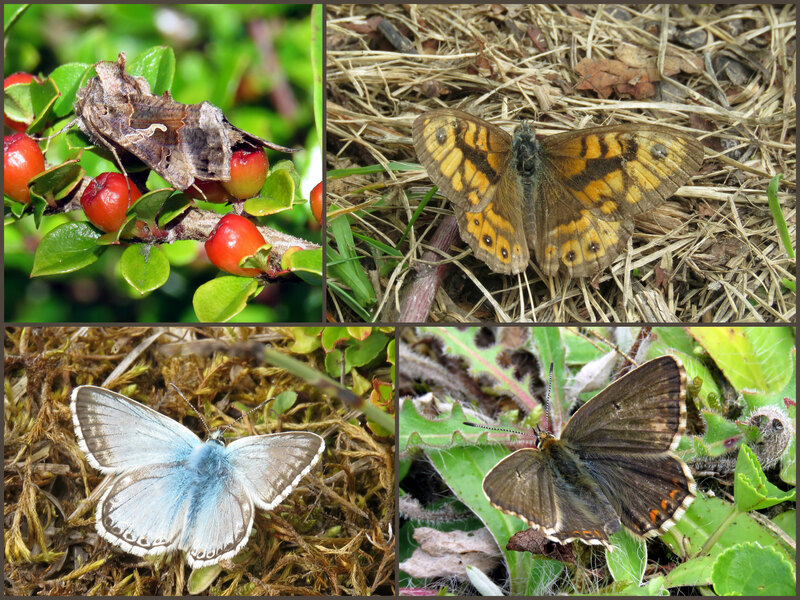 On a warm humid day when I recorded twenty species of butterfly, I saw the following species on Buckingham Cutting (south): the inevitable Gatekeepers and Meadow Browns, Marbled Whites, Small Skippers, frequent Holly Blues, frequent Speckled Woods in the shadier spots, occasional Large Whites, a few Small Whites, a handful of Common Blues, one Small Blue, two Peacocks and two Red Admirals. There was also a Green-veined White further east later in the afternoon and the first record of a Ringlet Butterfly in the month of August on the road verge meadow opposite Slonk Hill. 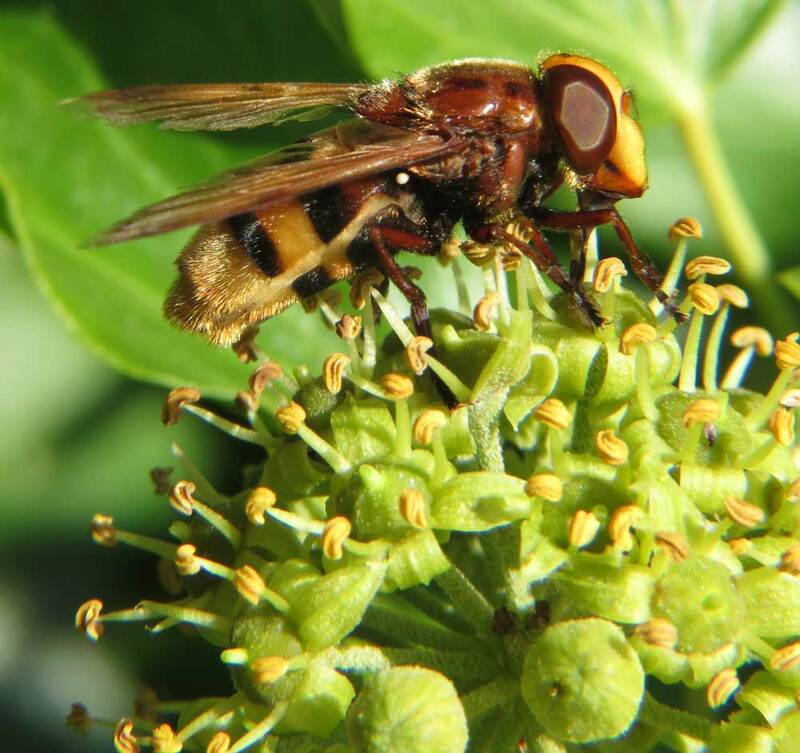 In the shade of the trees at the top of The Drive, north Shoreham, I noted my first two of the impressive hoverfly Volucella zonaria this year. I travelled to Mill Hill via the Pixie Path and the butterflies seen here were Speckled Woods, the inevitable Gatekeepers and Meadow Browns, Marbled Whites, Small Skippers, two Holly Blues, a Red Admiral and occasional Large Whites. 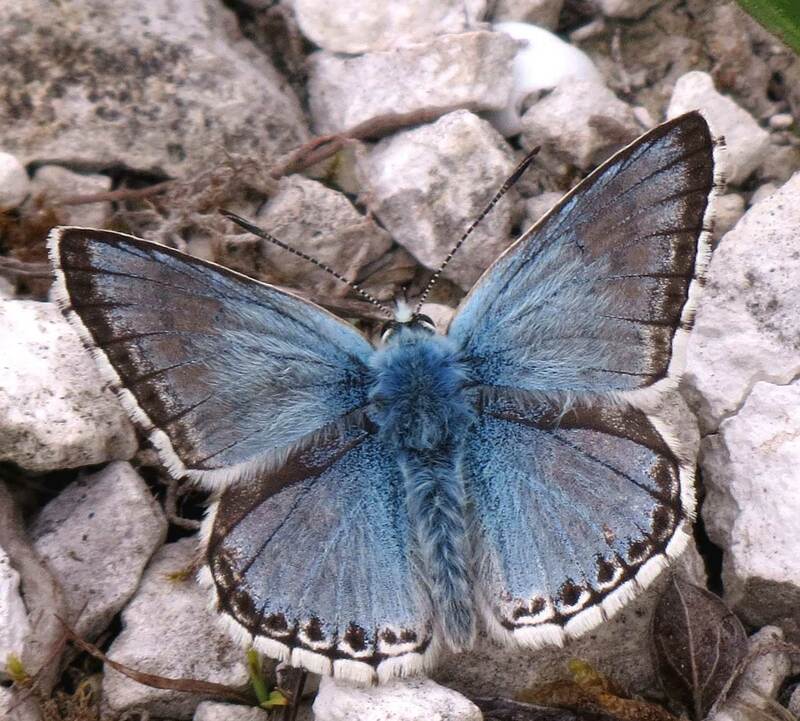 A dozen male Chalkhill Blues appeared on Mill Hill Cutting (south) before I reached Mill Hill. A half an hour passage trip along the southern bank of the A27 opposite Slonk Hill, resulted in three species of butterfly not recorded on the day before. I only spent about ten minutes looking for butterflies but it was enough to spot a Small Blue Butterfly immediately on Buckingham Cutting (south) as well as a Cinnabar Moth, two Large Skippers on the edges of the linear copse in an open area and lastly a Ringlet on the top part of the roadside verge at the eastern end. 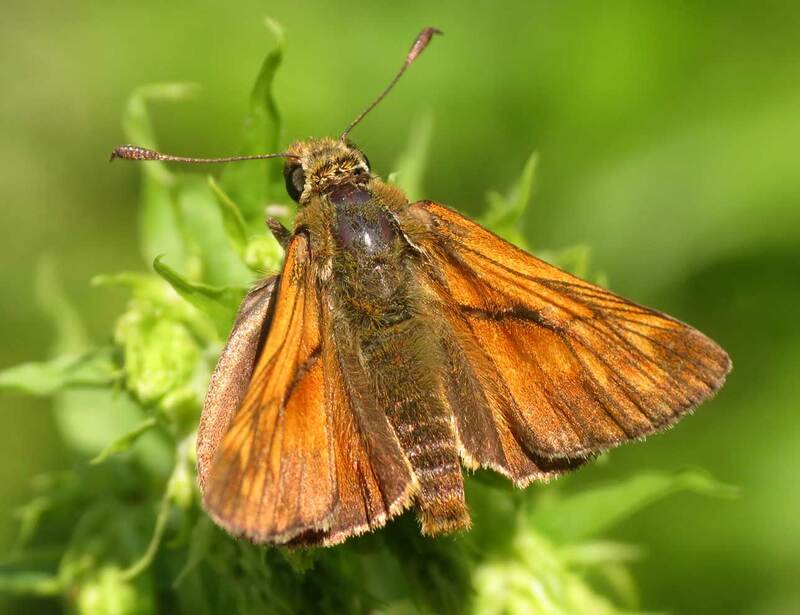 The settled Large Skipper was seen in exactly the same place as the one at the beginning of the month. Other butterflies seen on the brief trip included Meadow Browns, Gatekeepers, Speckled Browns, one Holly Blue, one Comma, Large Whites, Small Whites and at least one Marbled White. 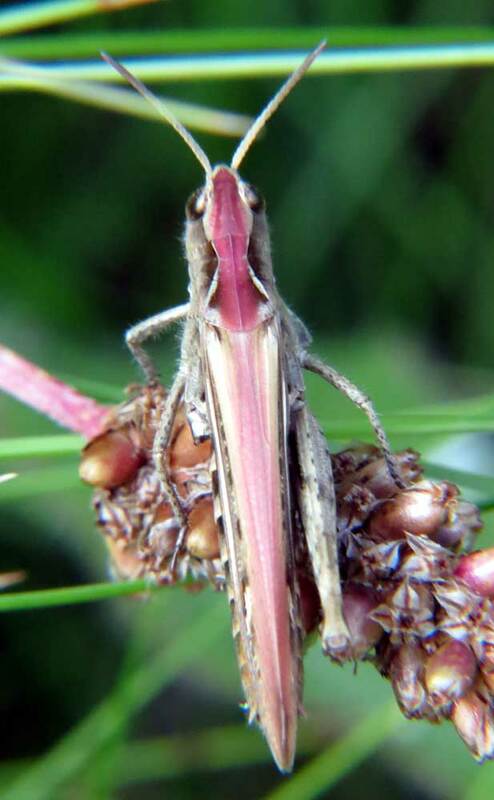 A few Yellow Shell Moths were seen. 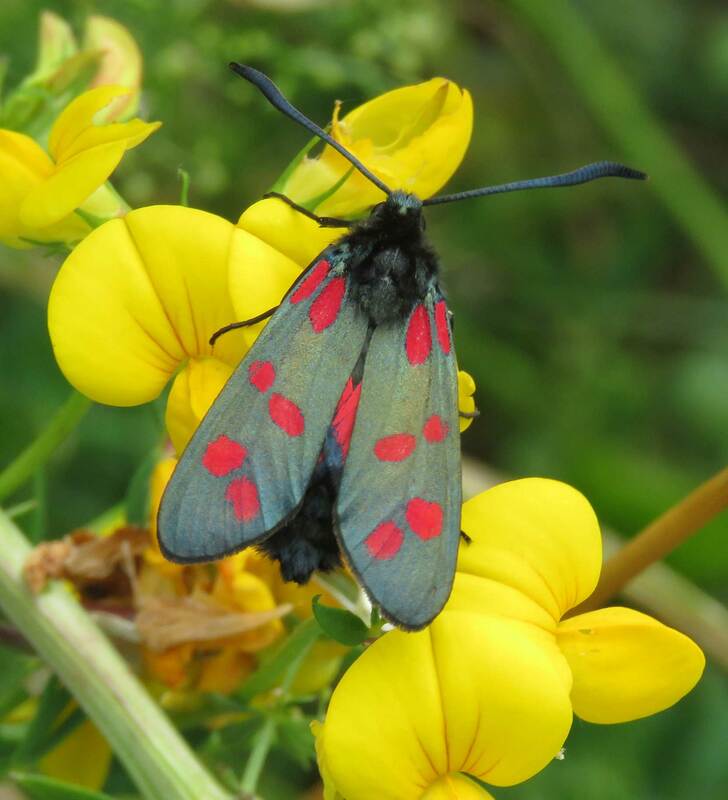 Six-spotted Burnet Moths were occasionally seen as well as a few unidentified micro-moths. 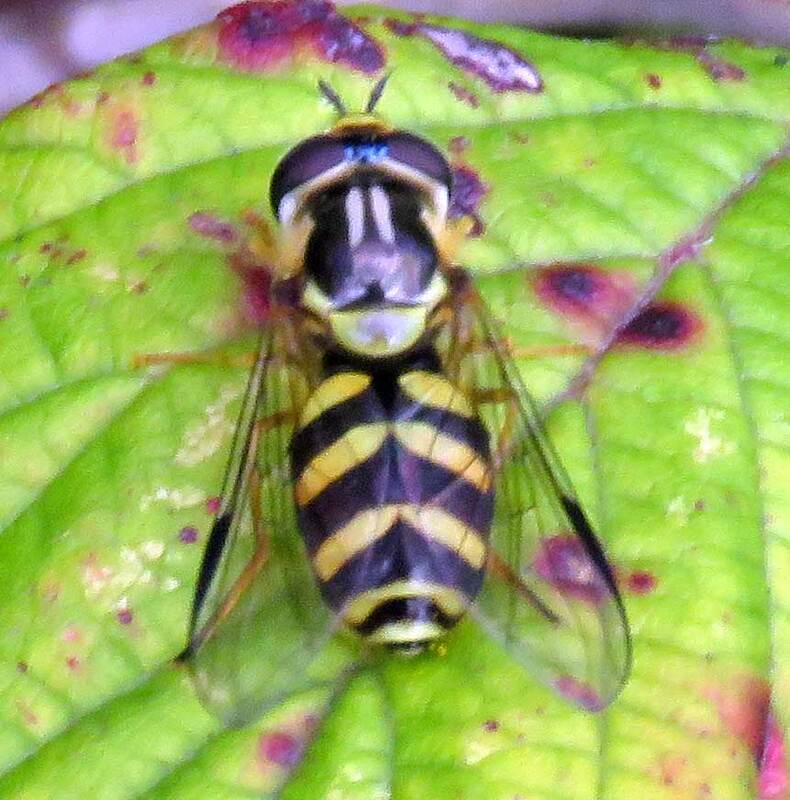 I was also fortunate enough to spot the first of the large hoverflies of the year. It was the attractive Volucella inanis. 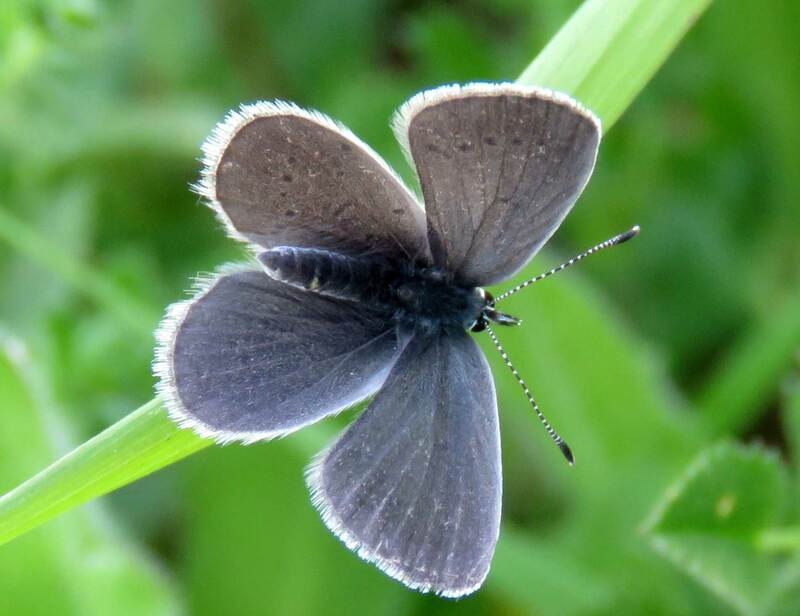 In the late afternoon sunshine, I made a quick detour to Buckingham Cutting (south) where in under a minute the first of about ten Small Blue Butterflies appeared on the small wild flower rich meadow. There may have been many more of these tiny butterflies which were dwarfed by the arrival of three Marbled Whites. 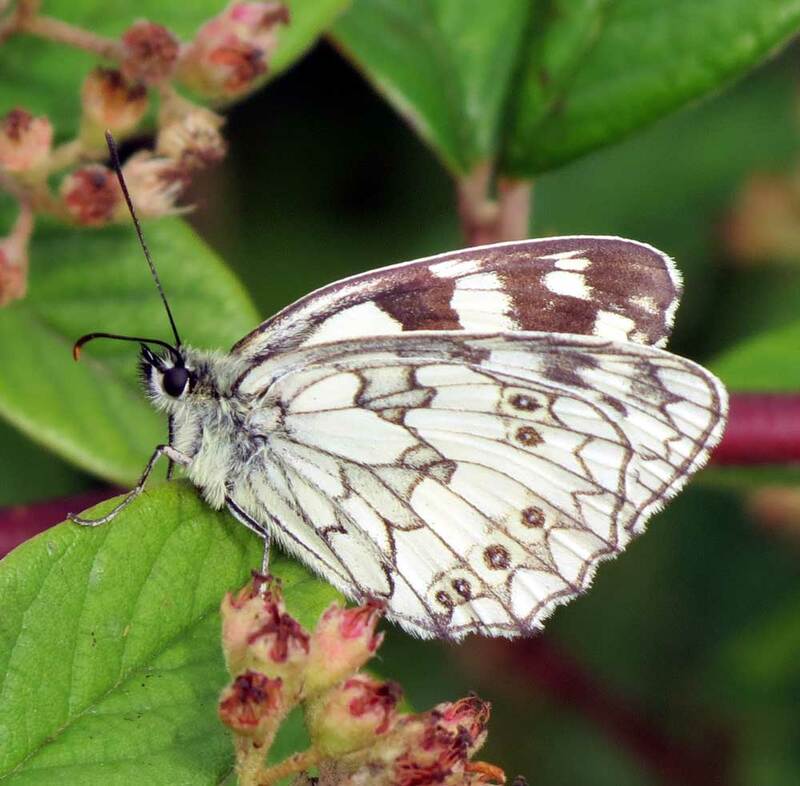 These Marbled Whites very rarely settled, but I spent some time chasing them vainly for decent photograph. 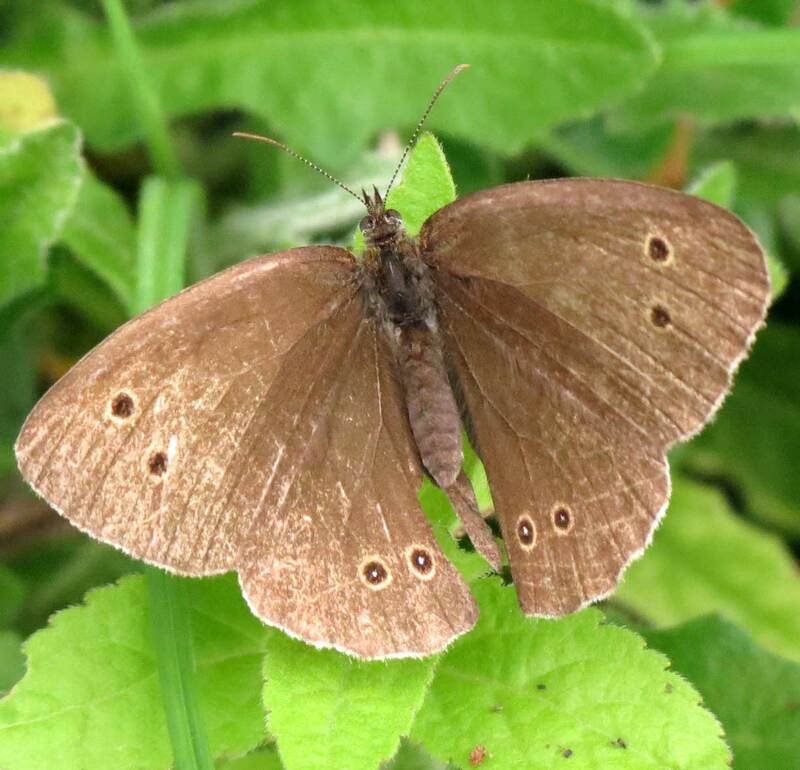 During this time a Ringlet and a Meadow Brown appeared. 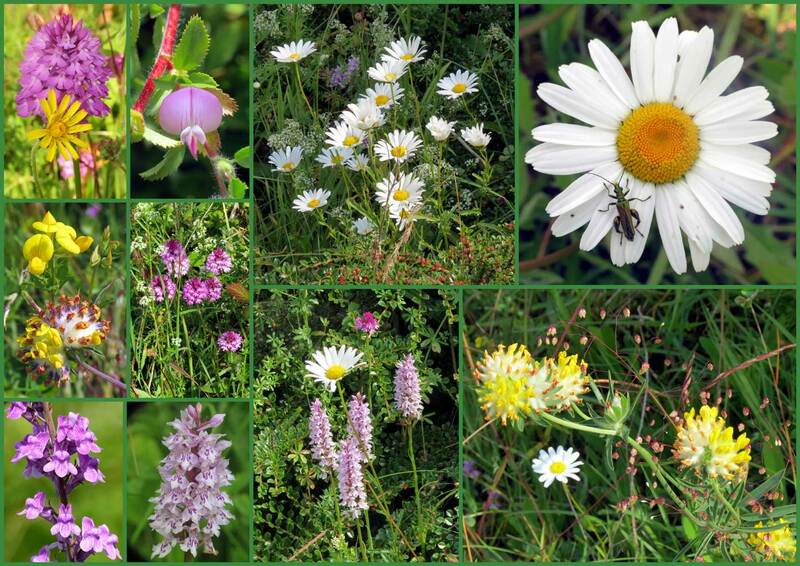 I could have spent more team amongst the meadow amongst the Kidney Vetch, Lady's Bedstraw, Cleavers, Pyramidal Orchids, Greater Knapweed, Ox-eye Daisies, Restharrow etc., if wasn't for the noise of the relentless traffic on the A27. 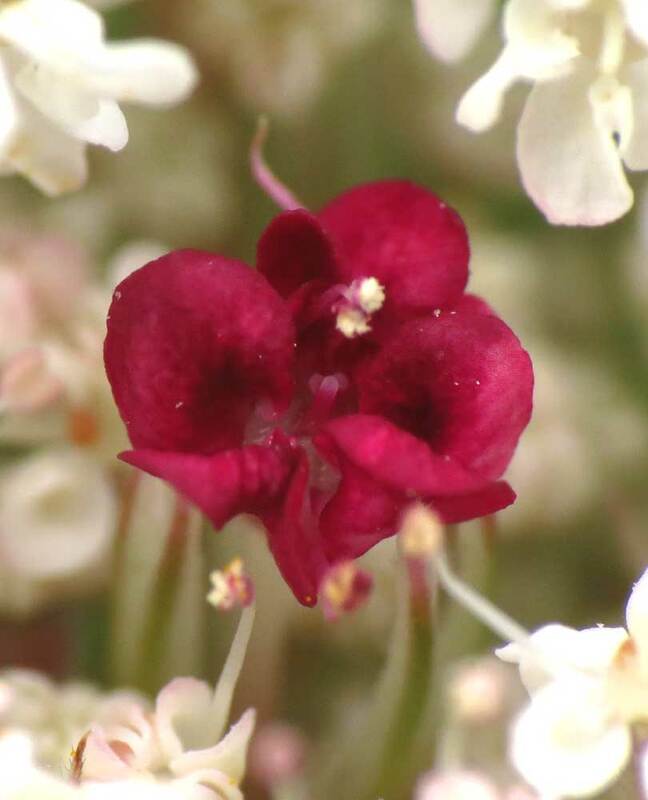 A Burnet Moth flew over the flower tops. 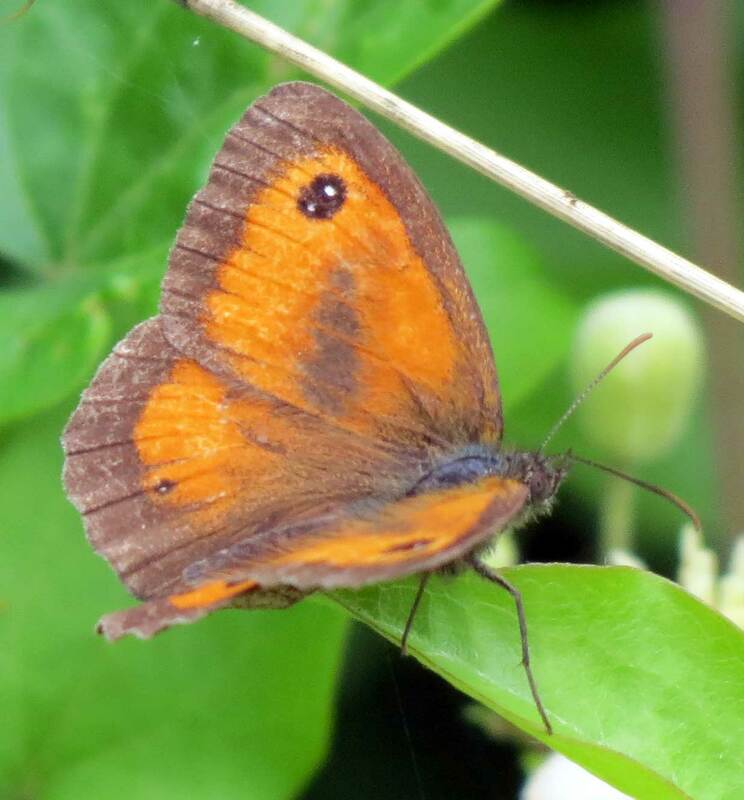 Amongst the Brambles, the first of two Gatekeepers were positively seen along with a Red Admiral and two Large Whites. In the shade of the linear copse, I disturbed a Yellow Shell Moth. On the verge to the east (Slonk Hill south), three more Ringlets were clearly seen and another Marbled White and a Large White. Two Large Skippers either fighting or courting over the overgrown path along the south bank of the Slonk Hill Cutting was the highlight of a brief detour on a humid late afternoon. 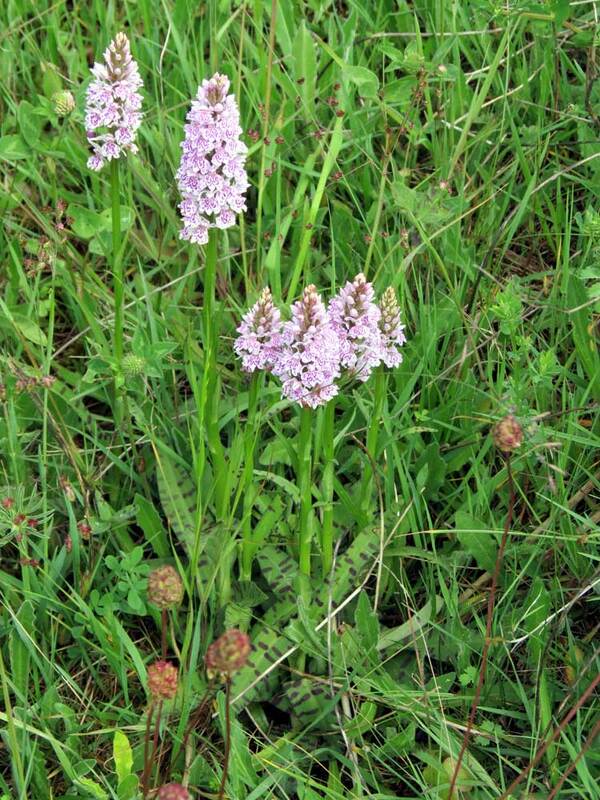 The notable feature of the open road embankment were the thousands of fading Common Spotted Orchids and the appearance of the first Pyramidal Orchids. Other butterflies on passage journey included a faded Red Admiral in the shade of Buckingham Cutting (south) and about twenty Small Bluesactually seen amongst the flowering Kidney Vetch on the open road verge with many more hidden, and a Large White, plus a large fawn Blackneck Moth, Lygephila pastinum. A Green-veined White Butterfly flew over Frampton's Field. 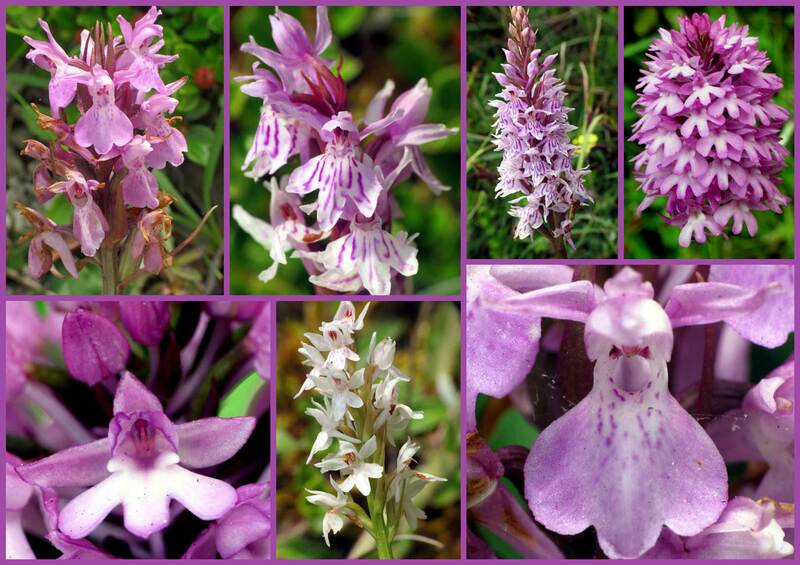 On Mill Hill Cutting (SW) there were three orchid species flowering and shown below. 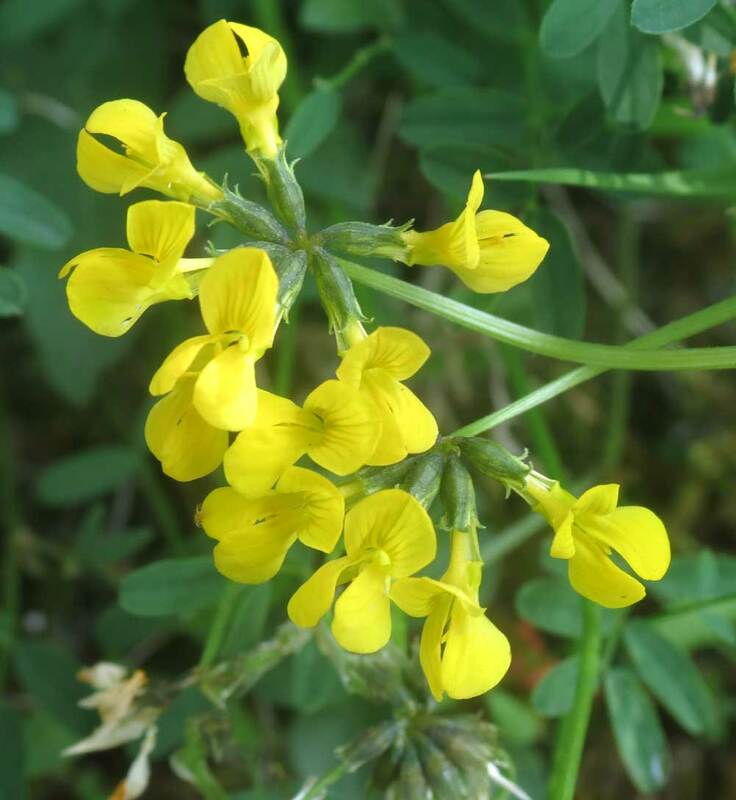 At least one clump of Horseshoe Vetch, Hippocrepis comosa, was still in flower in a sheltered part of the south-west area of Mill Hill Cutting south, west of the broken fence. I encountered a Fox on the way up the Pixie Path from the south during the middle of the day. It crouched down and then predictably disappeared as I got my camera out. 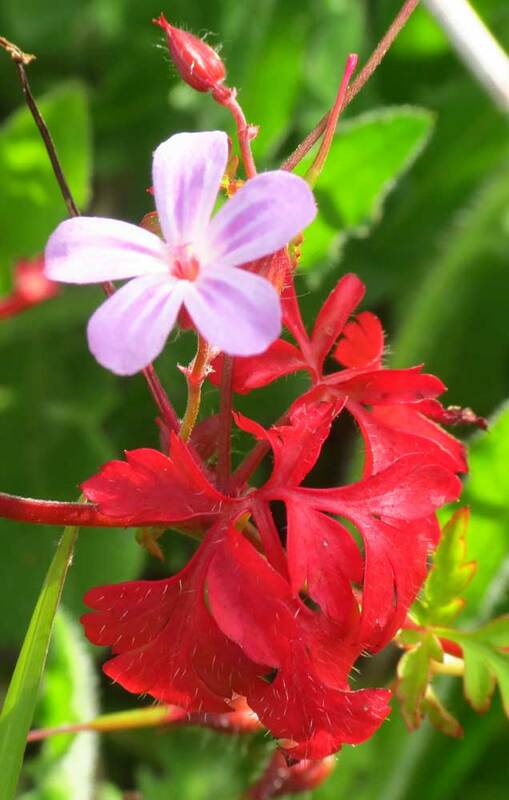 A sudden spell of sunshine in the late afternoon was unexpected after the morning rain. 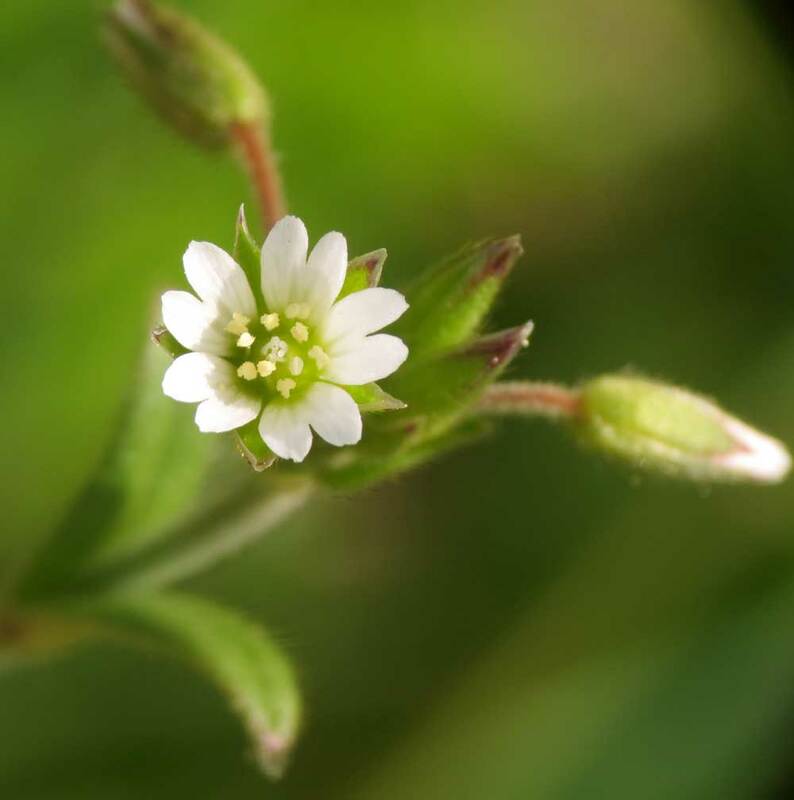 New wild plants spotted in flower may have been missed before because of the poor weather and other commitments. 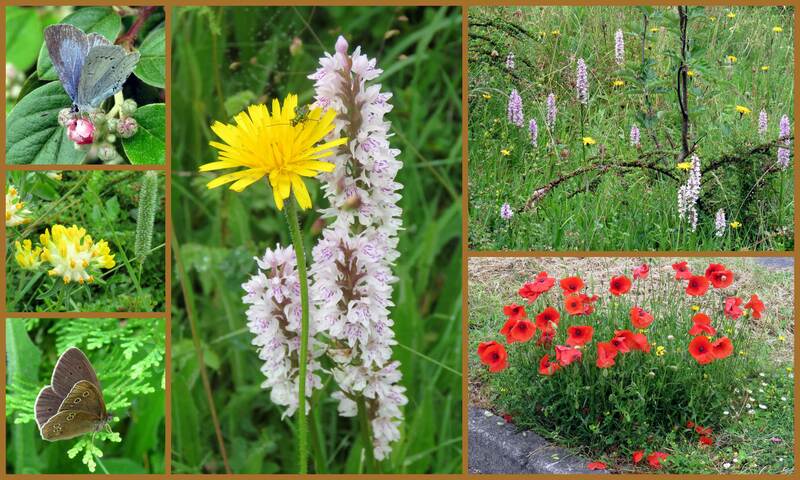 They included Yellow Rattle and Kidney Vetch. 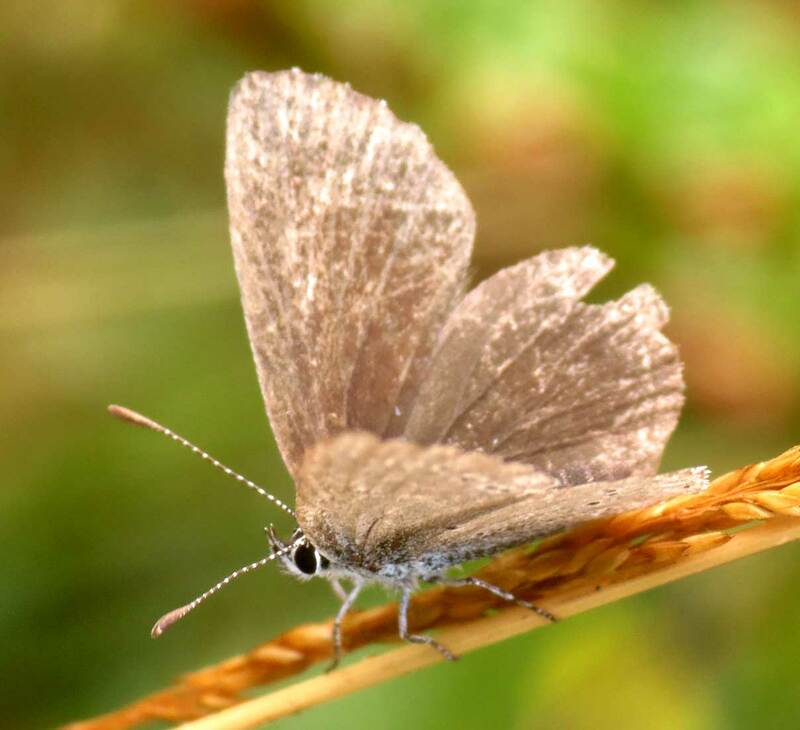 The latter is the caterpillar food plant of the Small Blue Butterfly and in excess of a hundred of these tiny butterflies were seen fluttering around the southern bank of Buckingham Cutting. This was an encouraging but not an unprecedented estimate. I also managed to spot four of my first Common Blue Butterflies of the year .A Red Admiral was also spotted. 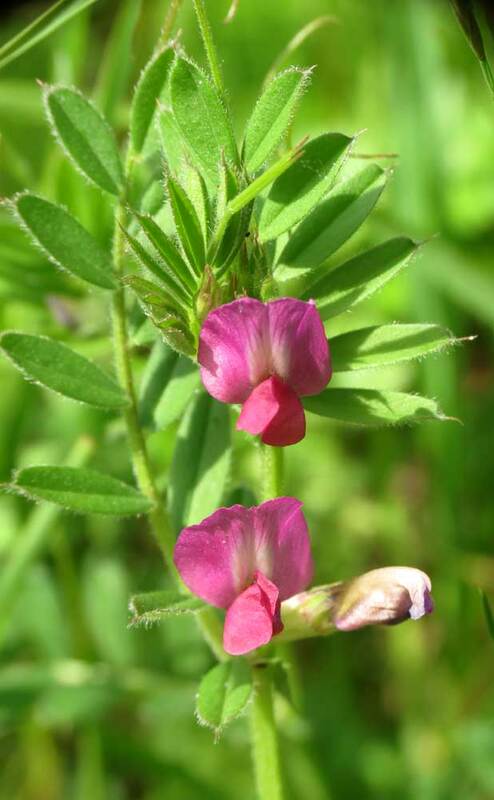 Horseshoe Vetch, Hippocrepis comosa, was still flowering abundantly but it showed signs of being past its peak. A Pyramidal Orchid was budding. 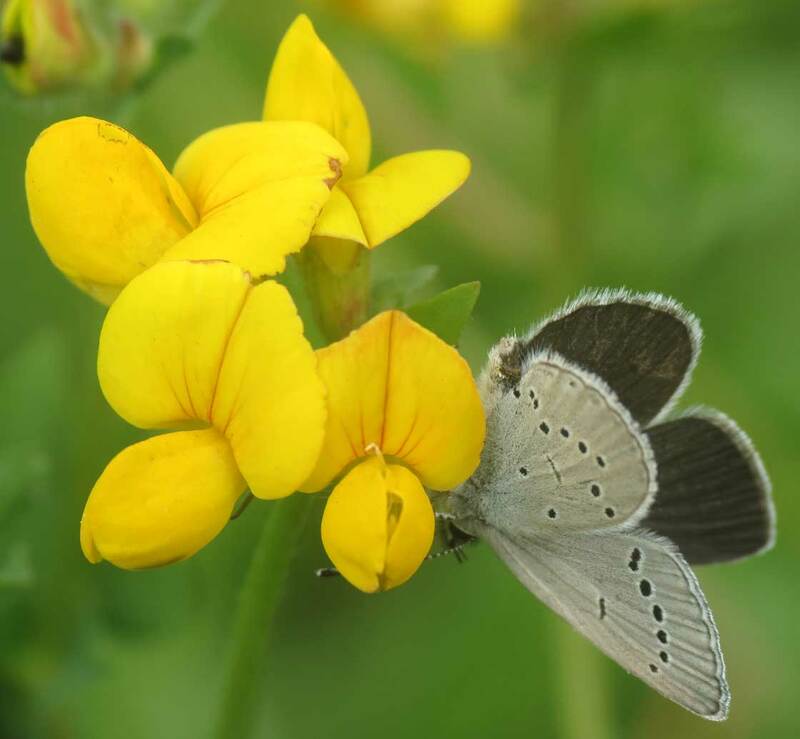 Greater Bird's Foot Trefoil was one of the plants visited by both the Small Blues and Common Blue Butterflies. 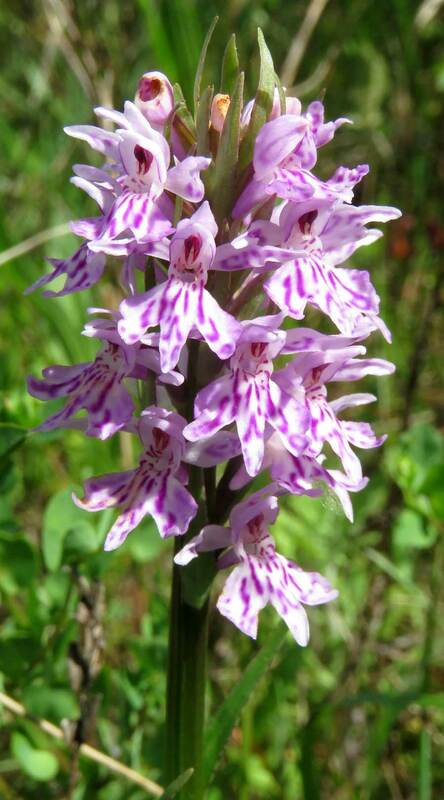 The female also visited a Common Spotted Orchid. A sudden spell of sunshine after midday was unexpected after the recent poor weather. 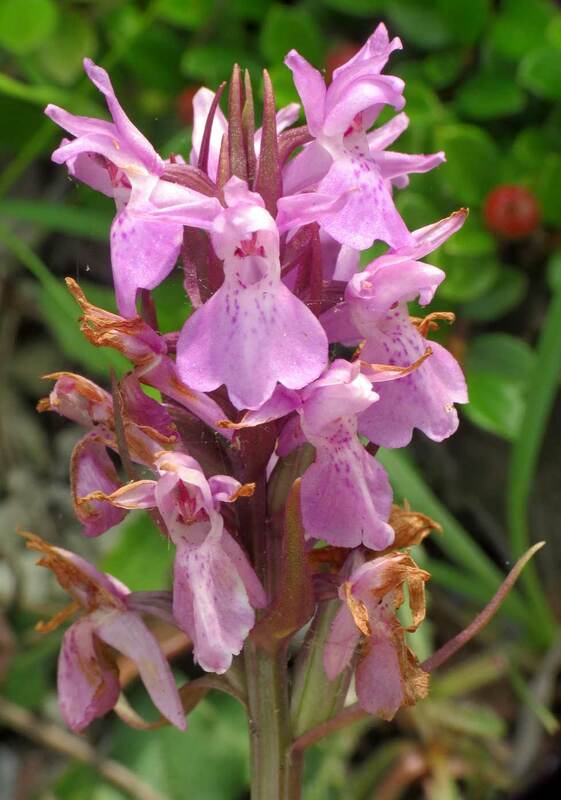 There were flowers seen for the first time this year including about seven Southern Marsh Orchids, Dactylorhiza praetermissa, on the Mill Hill Cutting (south) and the first Common Spotted Orchids in the same area. 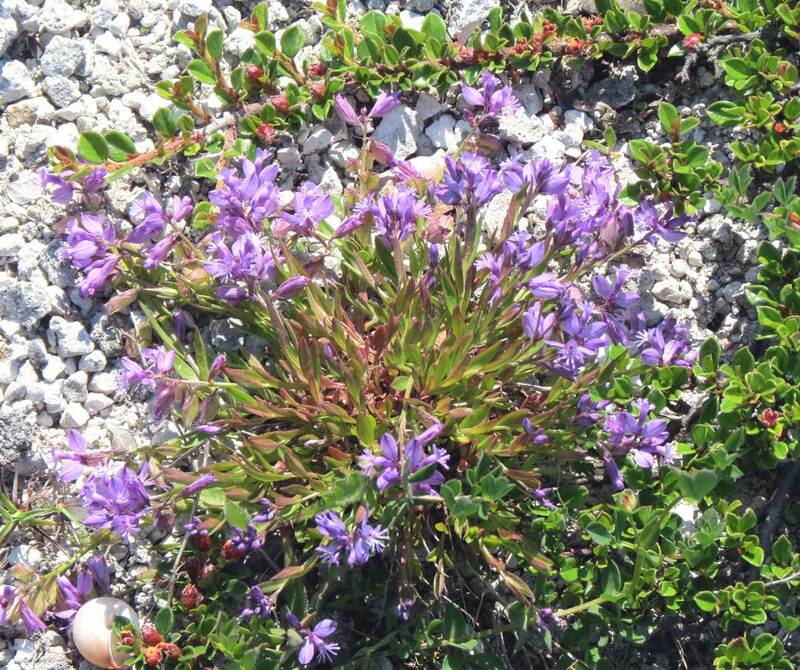 Horseshoe Vetch, Hippocrepis comosa, was still flowering abundantly but it showed signs of being past its peak. My first definite Wall Brown Butterfly of the year was seen on the Pixie Path 3138 to Mill Hill. It was the first of three in the same area, two which ended up courting. I had already noted a few Holly Blues and as I fought my through the overgrown entrance to the footpath. I spotted a Large Red Damselfly out of the corner of my eye. 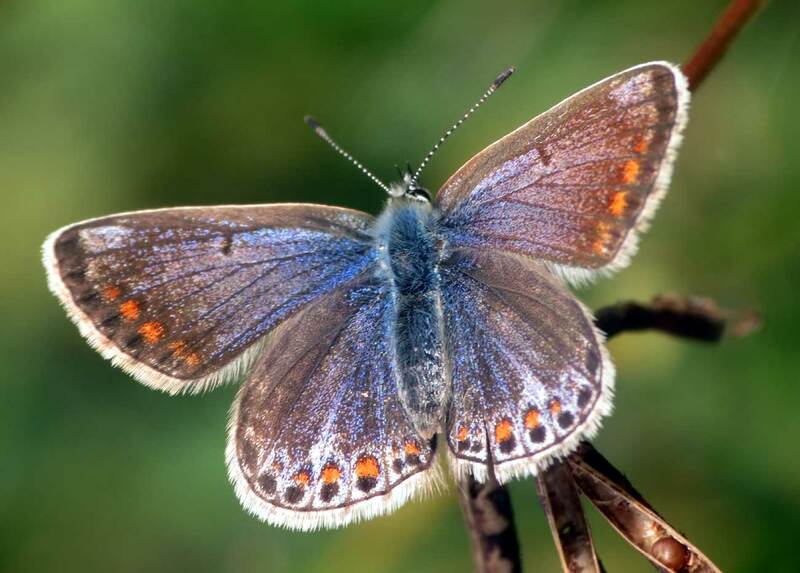 The first local Small Blue Butterfly of the year was spotted and photographed on the north side of the A27 near Shoreham. 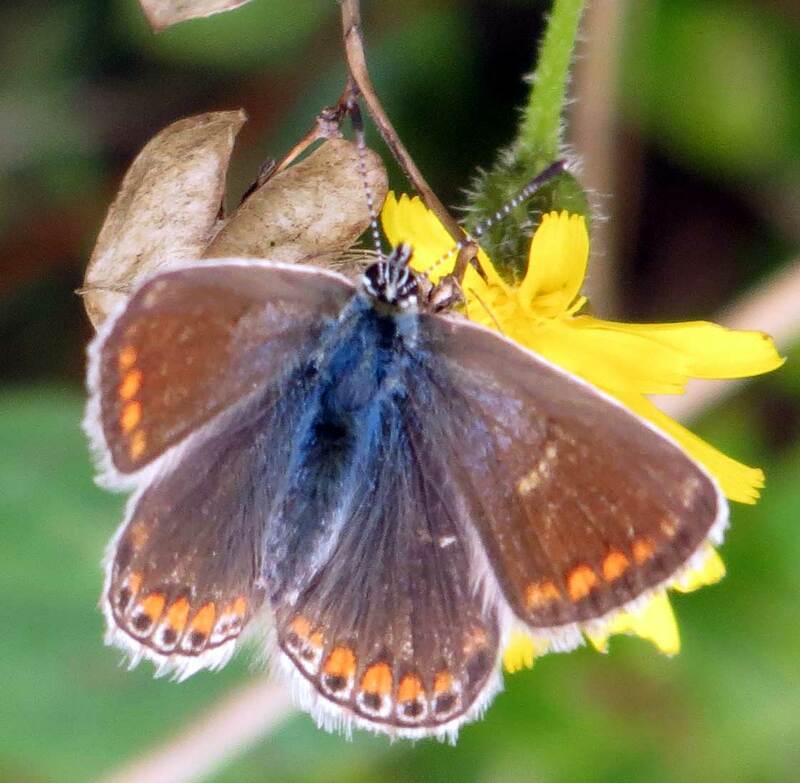 The first local Brown Argus and Common Blue of the year were also recorded. 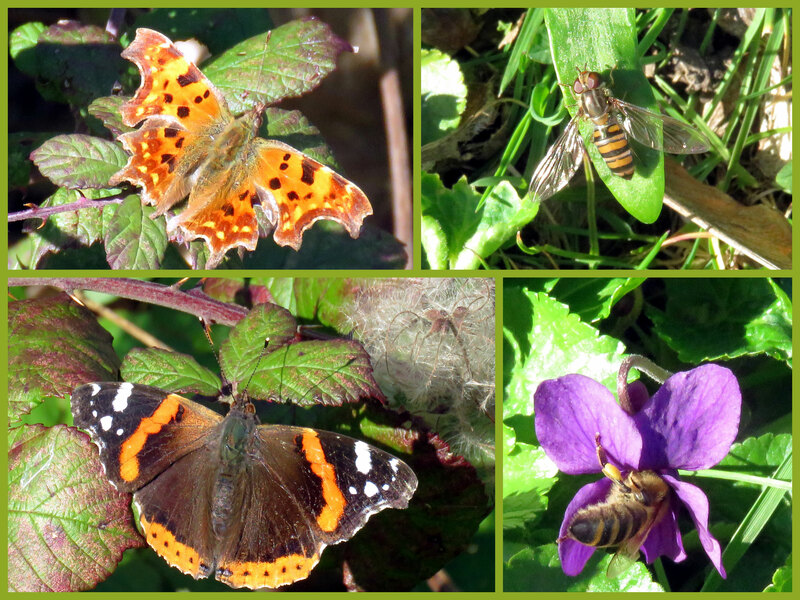 The sun came out and with it the bumblebees and a few hoverflies. 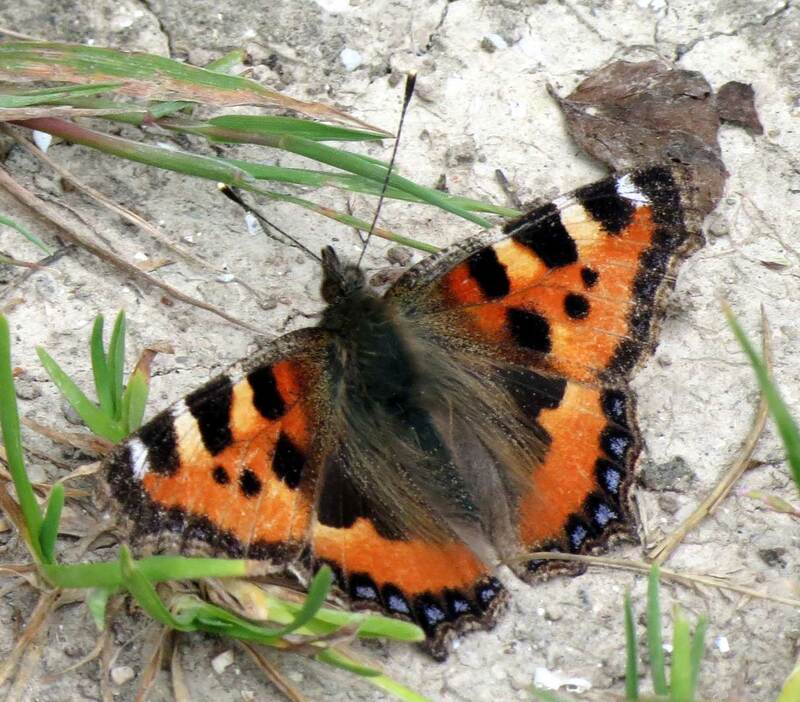 A Small Tortoiseshell settled on Footpath 3138 Pixie Path to Mill Hill where my first Common Lizard Lacerta vivipara, of the year skittered into cover. 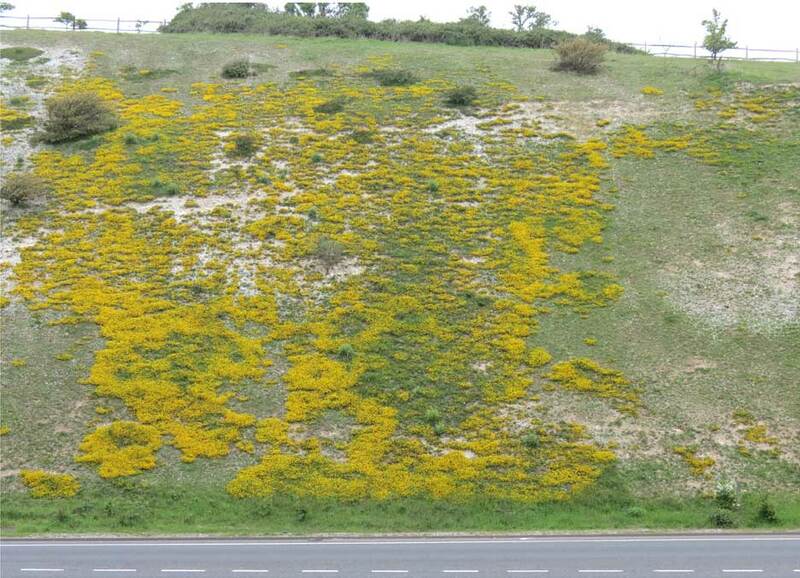 At the top by the bridge over the A27 I spotted my first Brimstone Butterfly of the year. There were hundreds of these tower-like pulmonate gastropod shells Cochlicella acuta in a small area of seeding Sow Thistles on the northern part of the Pixie Path. On the fourth day of the month the rain had stopped and it was worthwhile taking the camera out. 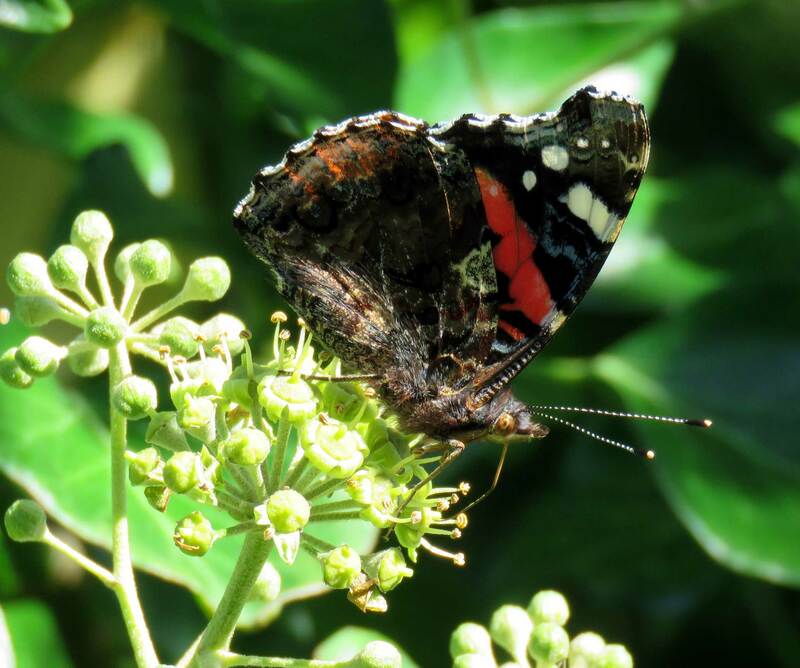 There were still frequent butterflies of six species blown about in the breeze with the leaves, well over a dozen Red Admirals visited the Ivy on the Pixie Path to Mill Hill. 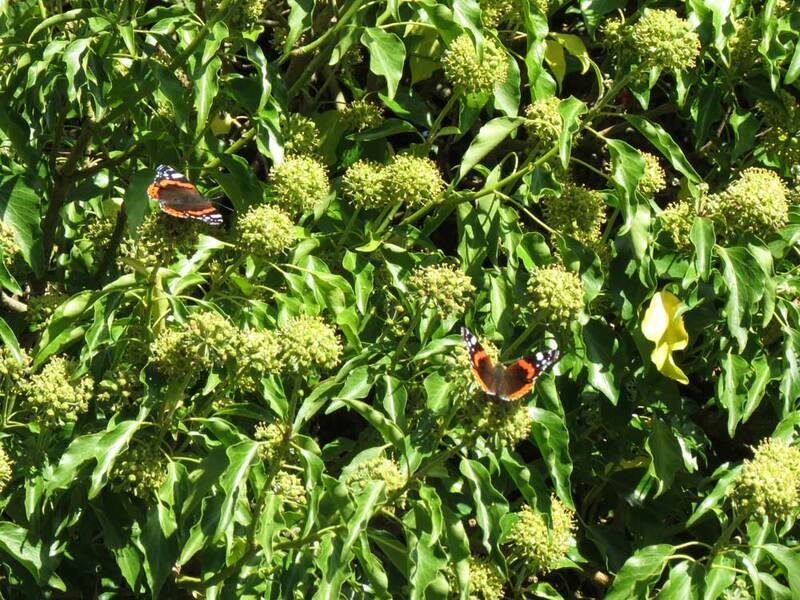 These Red Admirals seemed to have moved up the path from the rather faded Ivy in the Butterfly Copse. 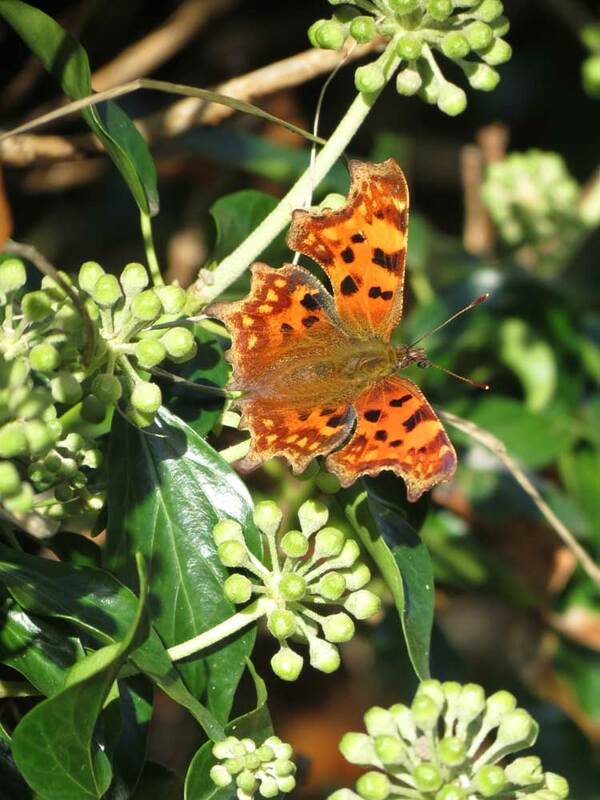 At least one Comma Butterfly flew out of the Ivy. A Southern Hawker dragonfly flew over the Pixie Path and Frampton's Field. 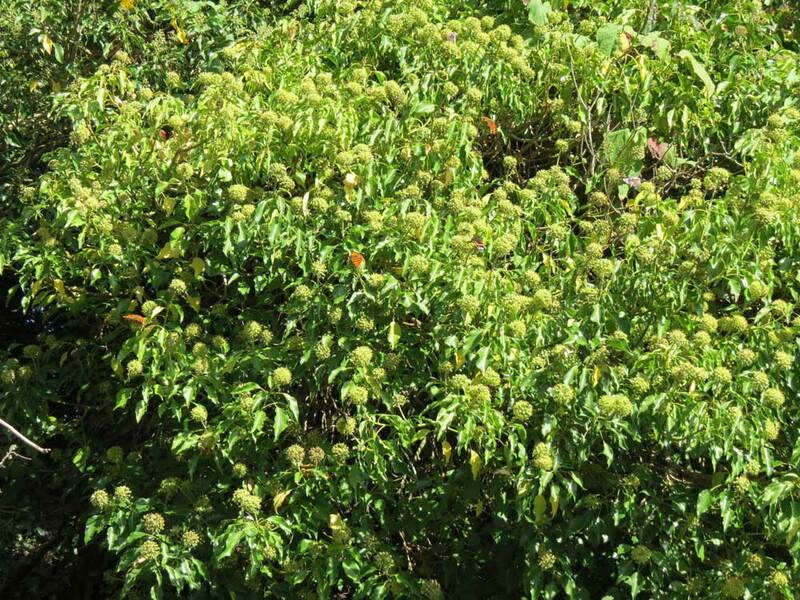 I was able to count the butterflies on the Ivy bush illustrated below and the figure came to 14 definite Red Admirals, possibly 18, with 7 more in the area within fluttering distance, plus four Comma Butterflies seen at he same time and one more over the Waterworks Road, plus one Large White in the Butterfly Copse and two nearby. There were also a few Common Darters (dragonfly). It was still too breezy for decent photographs with the whole Ivy bush swaying in the wind. The vanessid butterflies were easily disturbed by shadows of passing people and the persistence of hoverflies and bumblebees. When the sun came out both Red Admirals and Large Whites were seen on on the outskirts of Shoreham with two Specked Woods in the shade. 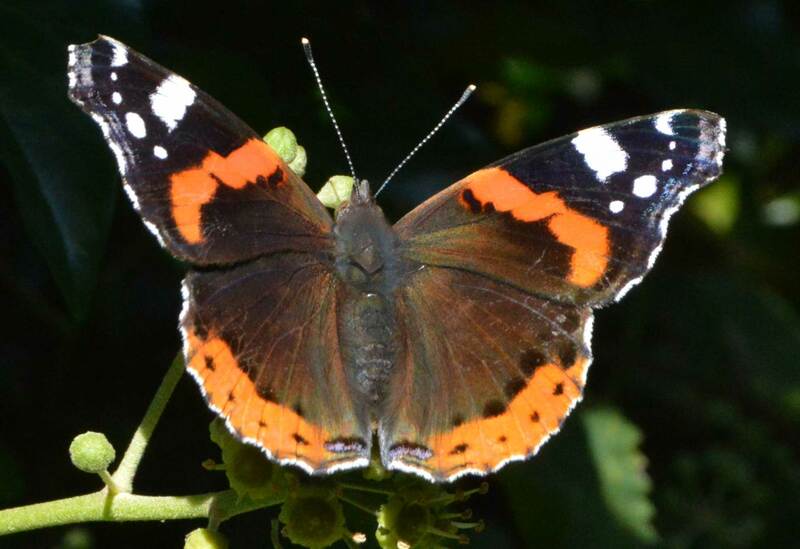 On a sunny day, a large Ivy bush in the Butterfly Copse next to the Waterworks Road was covered in flying insects, frequent hoverflies, and about thirty butterflies of which an estimated 25 were Red Admirals and five Comma Butterflies were counted. 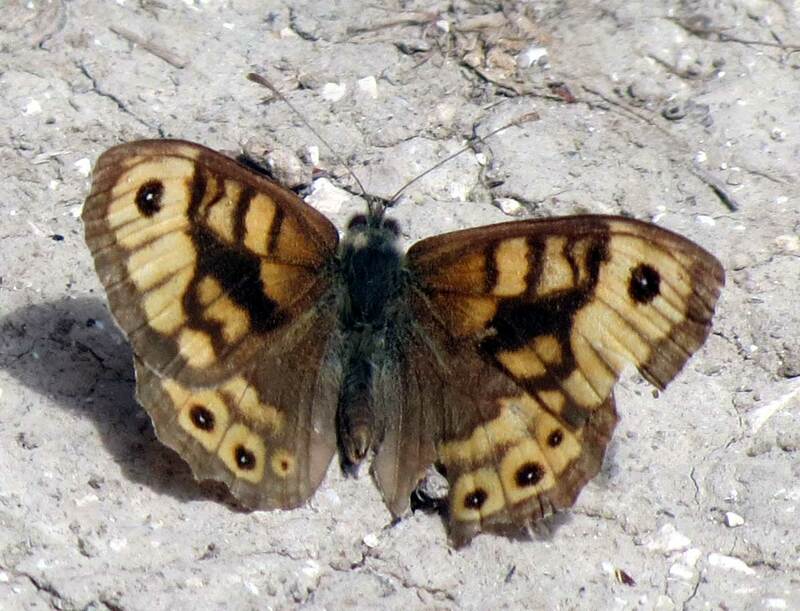 A Speckled Wood was seen in the nearby Waterworks Road, Old Shoreham. A Large White Butterfly visited the Buddleia in the same copse. Occasional Common Darters (dragonflies) were noted. Photograph: the hoverfly Volucella zonaria. The first photograph (below) is Holly Blue, taken on Ivy with great difficulties because of the Ivy was constantly swaying in the breeze. 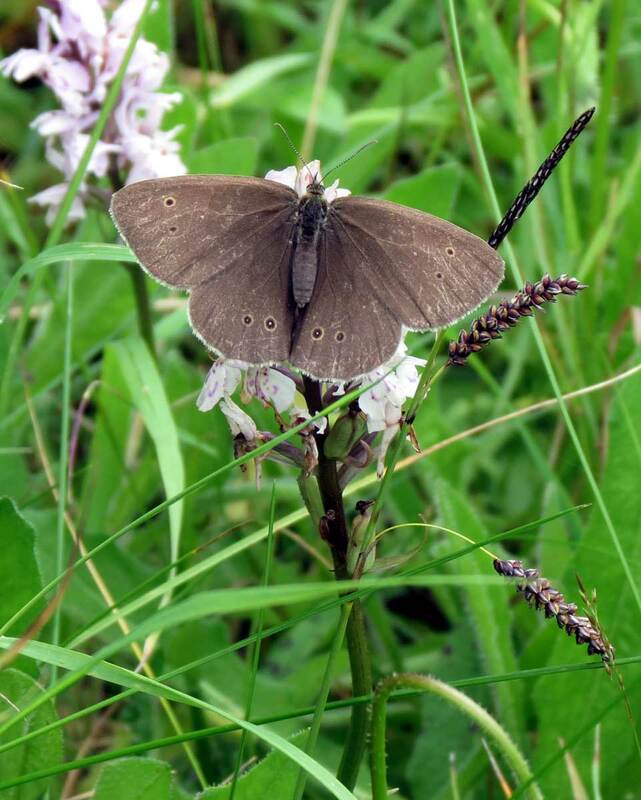 At least two brown butterflies (illustrated above) were disturbed on Mill Hill Cutting (SE) in the afternoon. 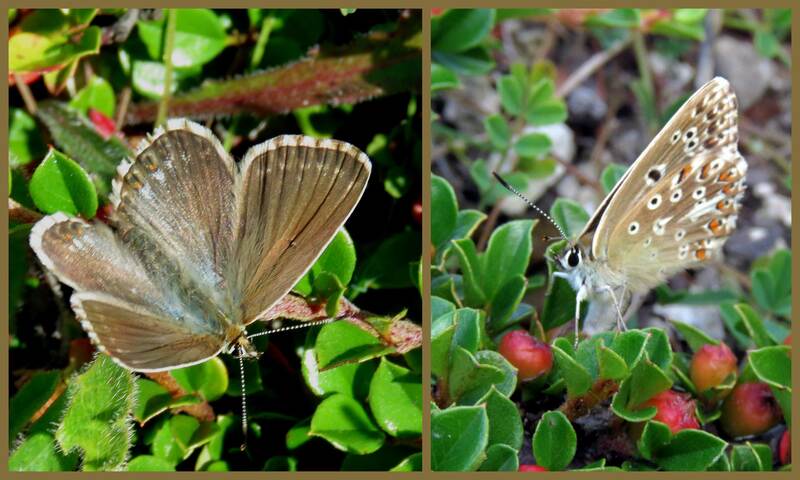 I suspect that they are the same species and might even be the same butterflies seen 24 days earlier in the same area. 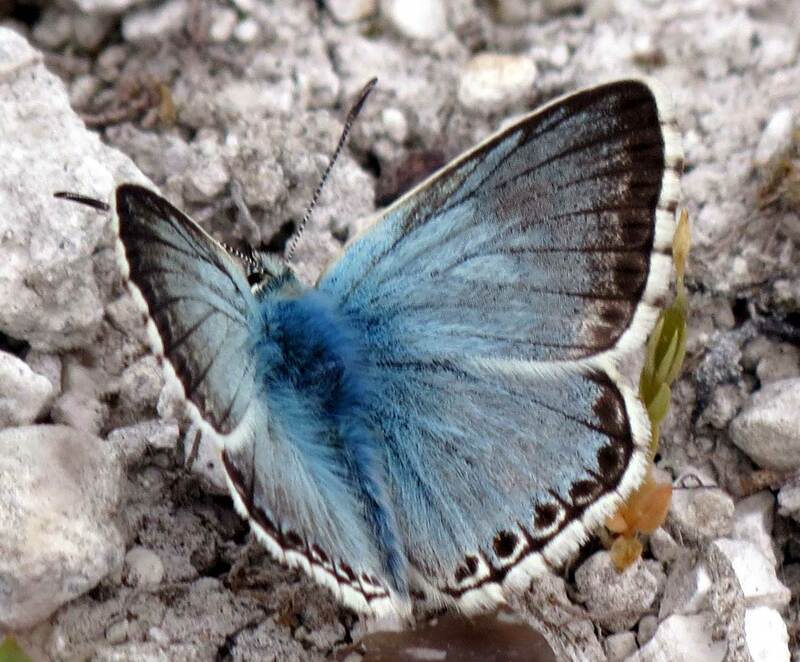 I identified the butterflies as Chalkhill Blues back then. The current two were considerably worn and slightly damaged. 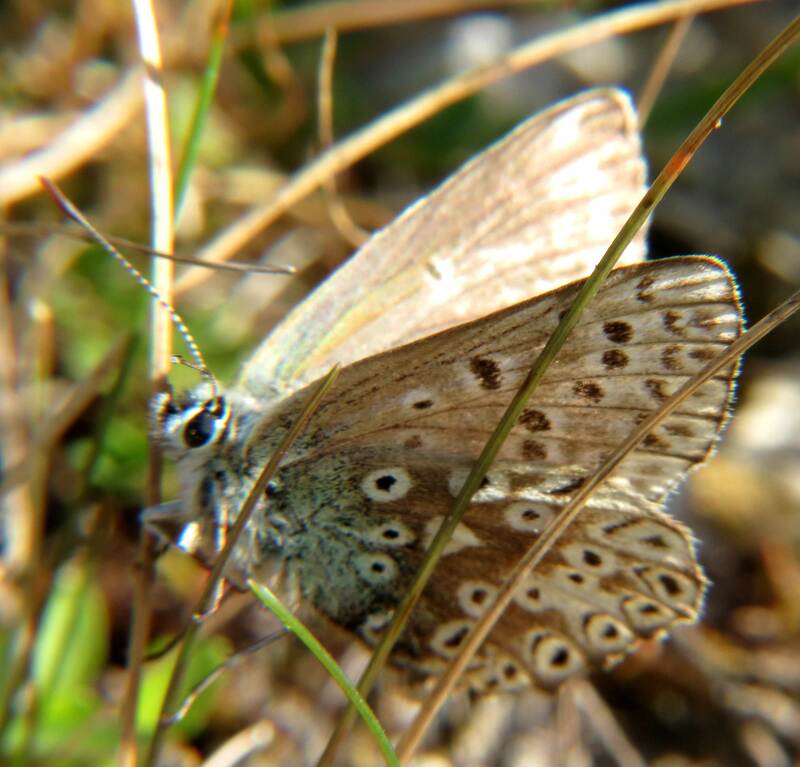 Study of the underwing spots was unable to confirm the species as the Adonis Blue is almost identical. As the month draws towards it end with the first chill of autumn in the morning. By late afternoon the sun very occasionally shone through a gap in the Cumulusclouds with a bit of a northerly (NNW) breeze (Force 4 gusting to Force 6) and conditions were inimical for butterflies. I made a detour passage trip up the Pixie Path around 4:00 pm and I would have been surprised to see anything of note in unpromising conditions. A handful of Meadow Browns were seen on the western edge of Frampton's Field, Old Shoreham, and when the sun pierced the clouds for about a minute half a dozen male Common Blues were seen on Ragwort flowers, but fluttered off and did not return when the clouds obscured the sunshine again. I paused by the Ivy on the Pixie Path but there were no other butterflies active in the cool conditions (17.7 °C). Fighting through the Bramble thorns to get to the Mill Hill Cutting (SE) I was surprised to instantly see a male Adonis Blue. The sun came out for two minutes and it even opened up its wings. This is the first time I have seen an Adonis Blue in this location and in the boundaries of Shoreham (south of the A27). It was the only butterfly species seen on this small area of chalk bank and the last but one seen as the weather became breezier and inclement, and quickly became dark under some rain clouds. The last butterfly was a Red Admiral struggling to fly against the wind and blown away. 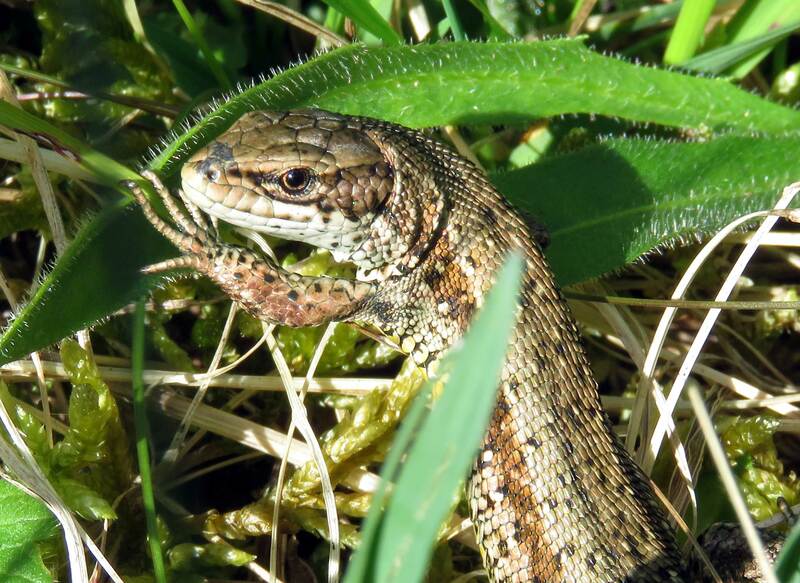 Grasshoppers were active in grass and herbs next to the west-east northern section of the Pixie Path and there was a Common Lizard seen basking on the chestnut fencing at the top of the Pixie Path. 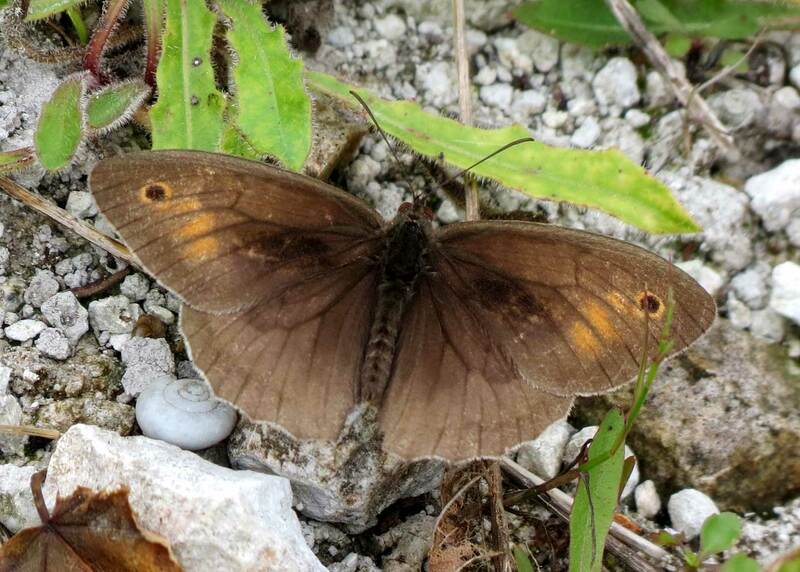 On the outskirts of Shoreham, a variety of brown butterflies were in prominence of display. Speckled Woods were frequently seen with 30+ on a detour passage through the Pixie Path. This far exceeded expectations on a cool (18.9 °C) breezy (Force 5 to 6) and humid afternoon under an intermittently cloudy (Cumulus + vapour trails) sky. Mill Hill Cutting is a continuation of Footpath 3138. The footpath has been diverted (1971) to go over the bridge to Mill Hill. 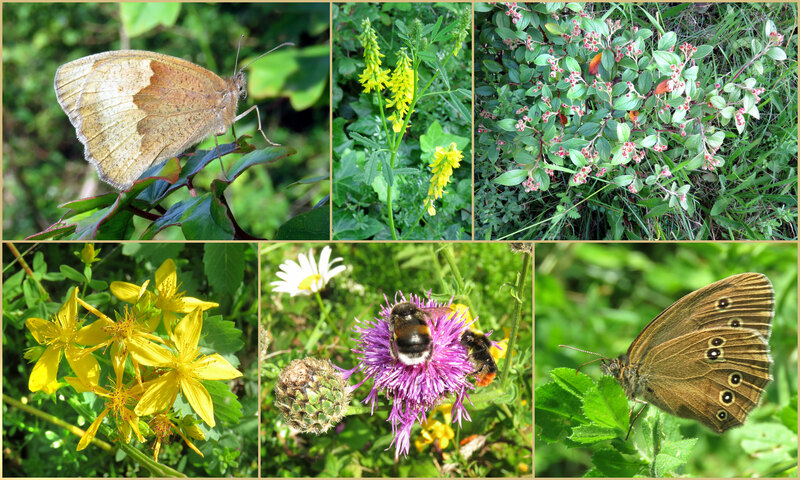 Five separate and quite distinct brown butterflies were quite prominent on the garden-sized area of Mill Hill Cutting on the chalk bank covered in the leaves of Cotoneaster, Horseshoe Vetch, Mouse-eared Hawkweed and other herbs. 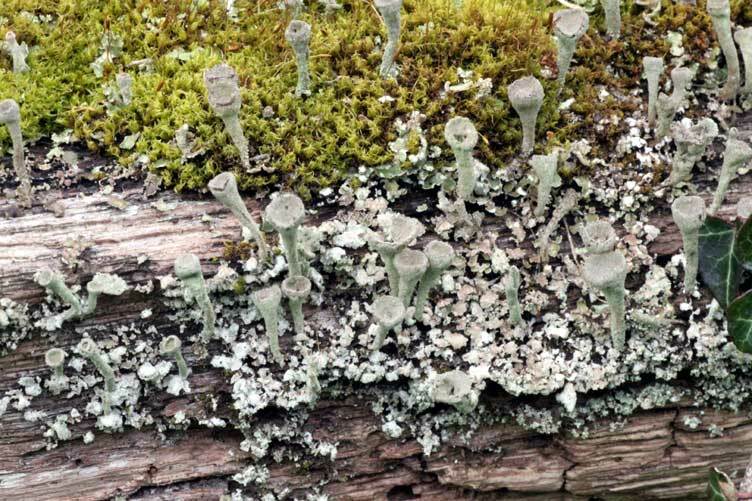 Three were seen simultaneously and recognised not to include two much tattier specimens. 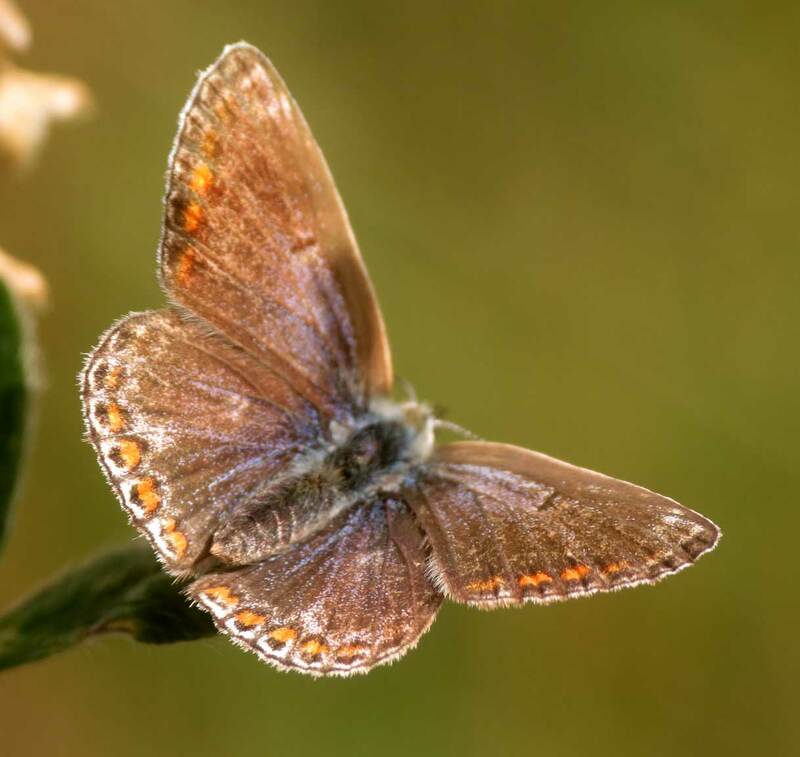 All these were thought to be female Chalkhill Blues, even the one that was smaller than the others. 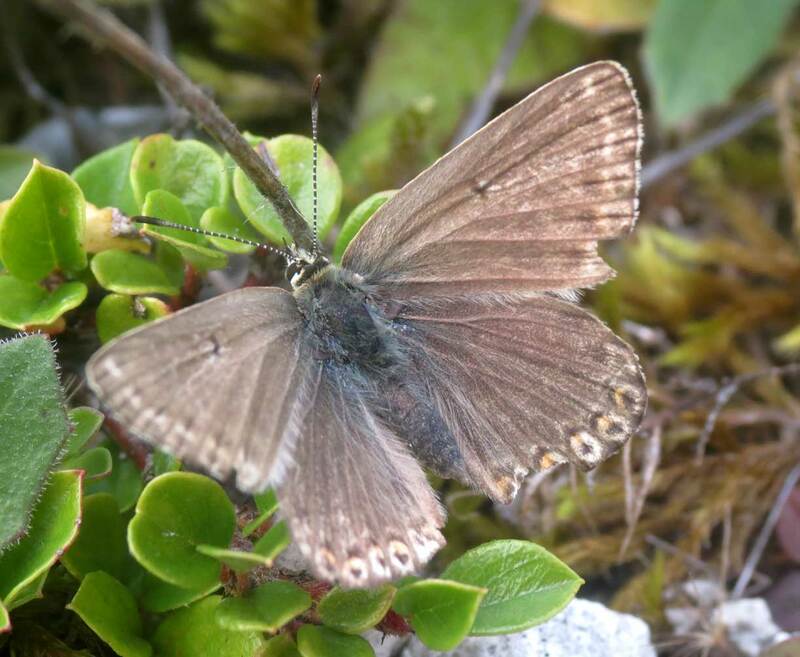 They were accompanied by at least one Meadow Brown and more than one Common Blue, a female and a male respectively. Looking like many of fallen leaves blown about, its static position on the path revealed a closed Red Admiral, one of a handful seen. 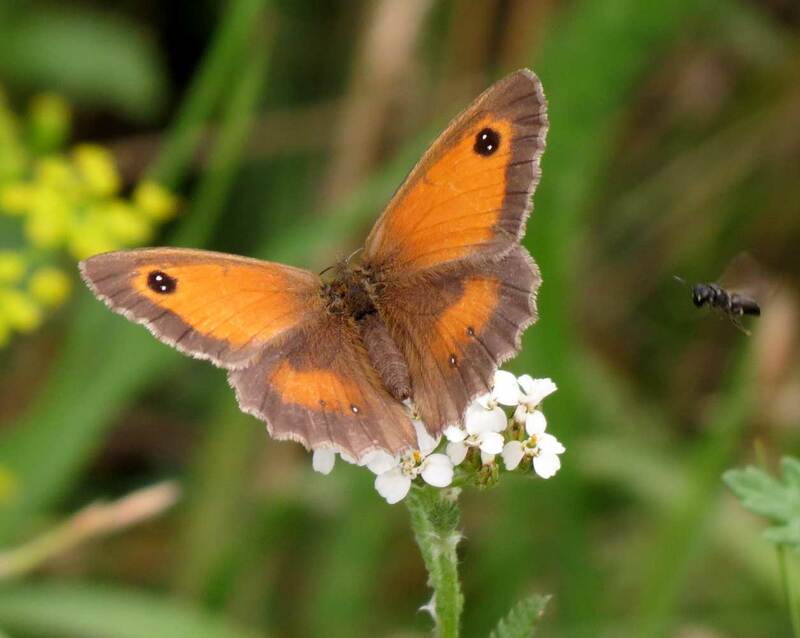 More Meadow Browns were seen over the Pixie Path and one Gatekeeper in a good condition. All the whites, even the smaller ones turned out to be Large Whites. 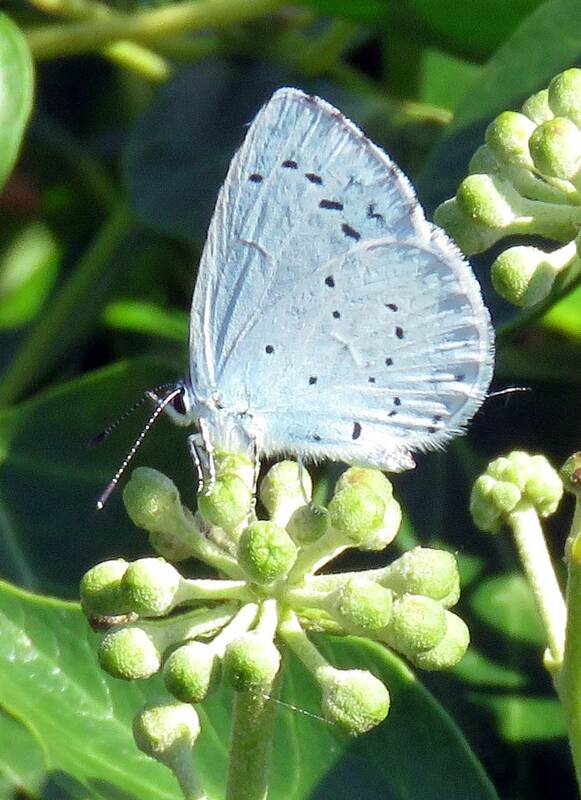 Holly Blues (10+) fluttered around the Brambles and Ivy with the first blackberries appearing. 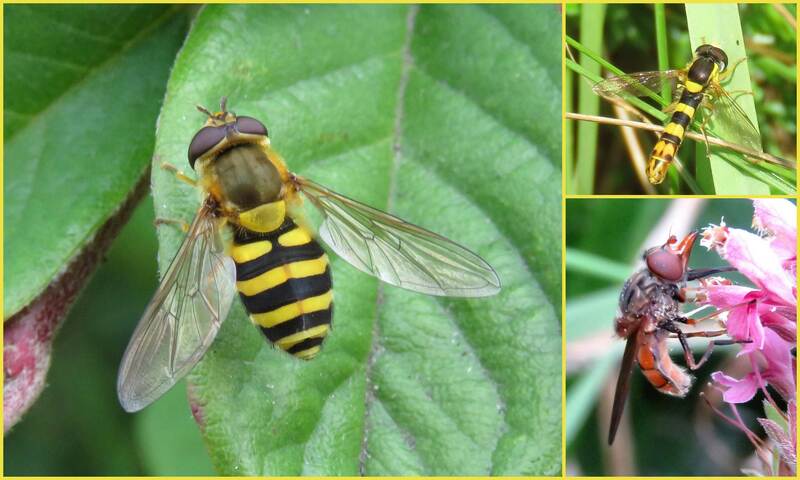 Three separate sightings of the spectacular hoverfly Volucella zonaria, were noted in and around the Pixie Path. On a sunny and very humid day the butterflies were out and seen in the early afternoon. Frequent Speckled Wood Butterflies, one Red Admiral, occasional Common Blues, one Brimstone Butterfly, occasional Holly Blues, a few Small Blues, frequent Meadow Browns, one Large White, and one Silver Y Moth all appeared within ten minutes in and around the southern bank of Buckingham Cutting. It was tricky to separate the few Small Blues from the Common Blues until I got a good look of them when they settled. The large hoverfly Volucella inanis flew from the flowers of Bramble to Wild Parsnip to Yarrow in quick succession. The mist hung around until midday, but breeze died down and the rain held off on a humid day. A Red Admiral was quick to show under the shade of the linear wood at the top of The Drive in north Shoreham. 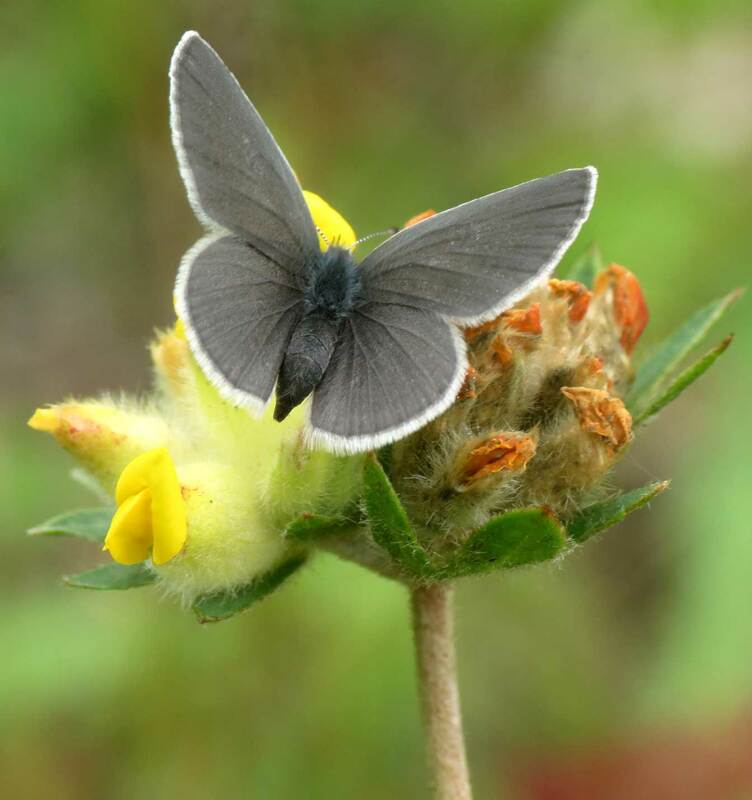 As the path opened out on the southern bank of Buckingham Cutting, a Small Blue Butterfly was spotted immediately amongst the dead heads and the occasional flower on the patch of Kidney Vetch. 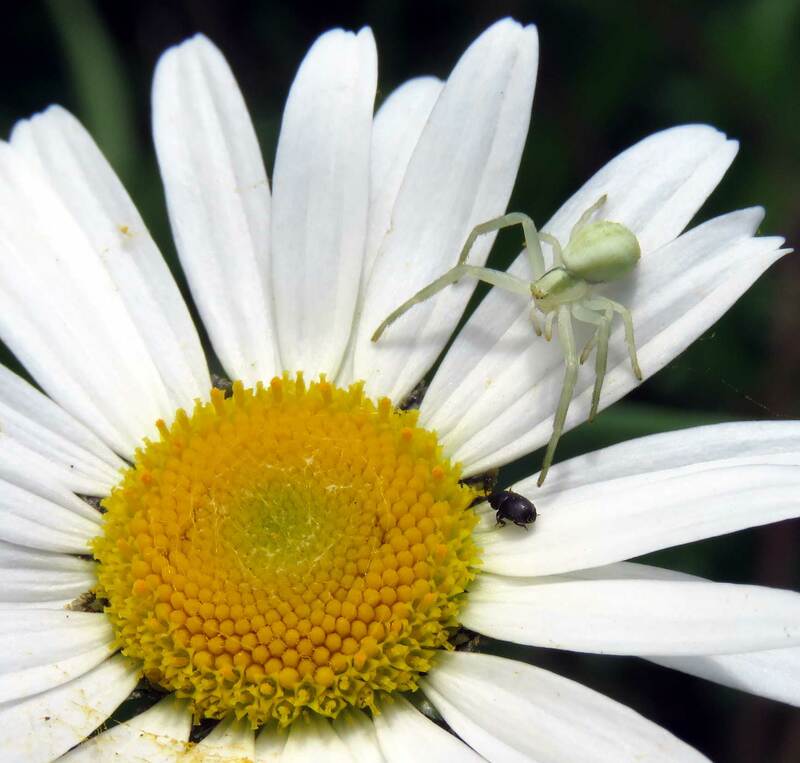 It was the first of about a dozen and they may be more as the females searched out the flower heads to lay their eggs. 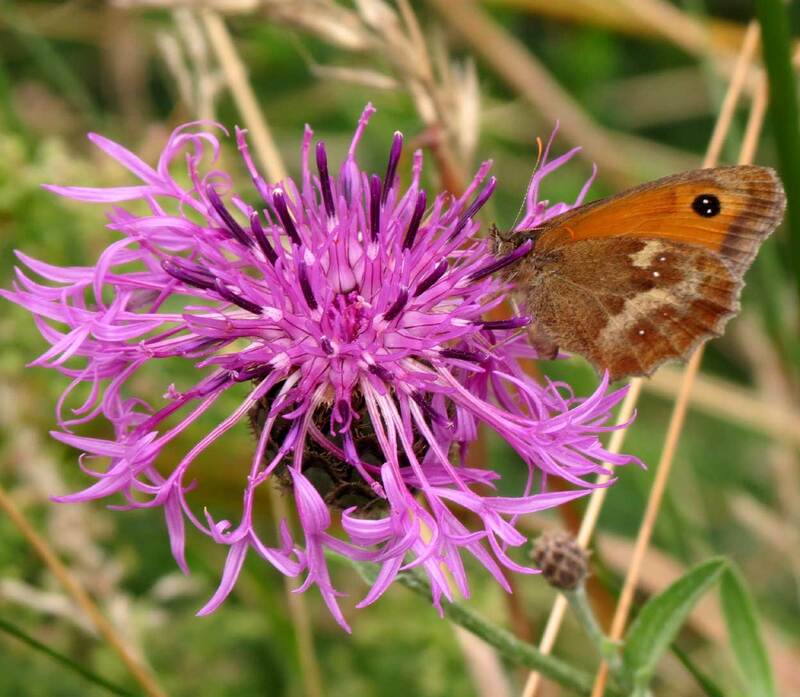 Meadow Browns were also frequently seen on the cutting meadows which had not been mown by the highway authorities. One Gatekeeper was spotted amongst the Bramble and there were at least two Holly Blues and two Large Whites fluttering above. Further to east I disturbed a Shaded Broad-bar Moth, Scotopteryx chenopodiata. I also discovered a Speckled Bush Cricket, Leptophyes punctatissima, on a Kidney Vetch but it disappeared when I changed the lens for a photograph. 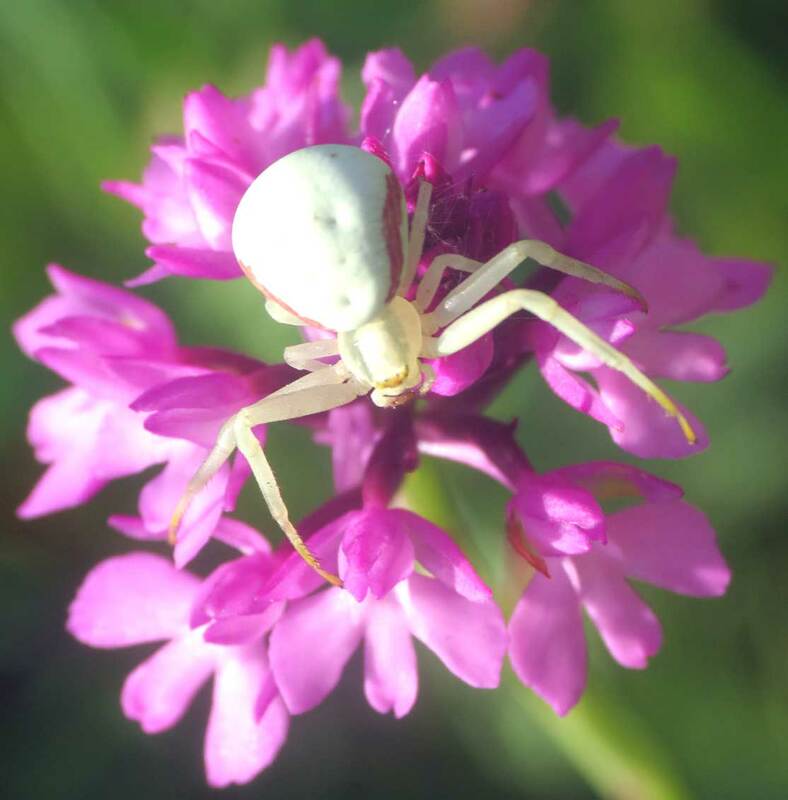 A white Crab Spider was spotted amongst the flowers of Hemp Agrimony.Apples appeared on a tree and there were a few Blackberries. At the expected peak period for the Chalkhill Blue Butterflies I felt obliged to check out Mill Hill although the conditions were far from ideal with overcast skies and a very irritating breeze (Force 5) and cool (> 18.6 °C). 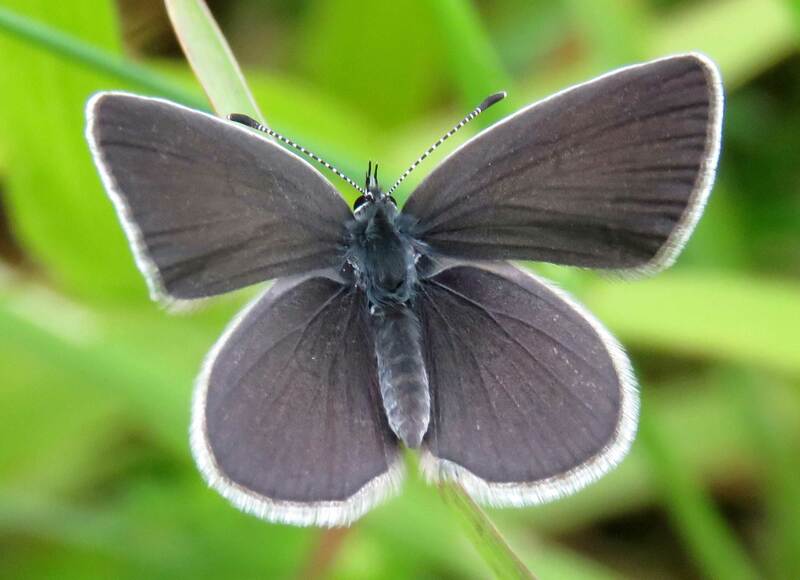 The first male Chalkhill Blue left the Pixie Path at the southern end, almost in Old Shoreham, which was an encouraging sign. 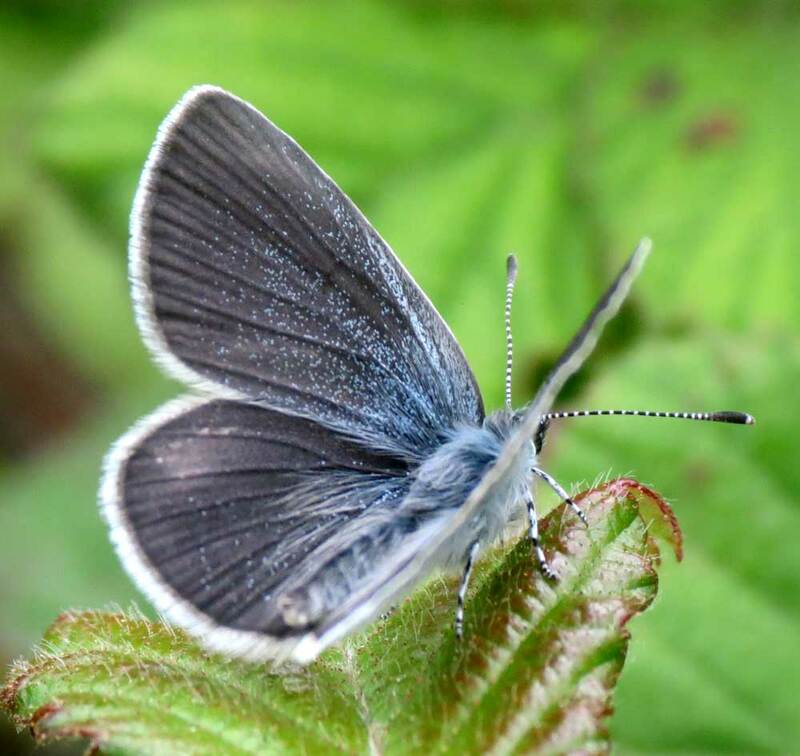 However, when visiting Mill Hill Cutting when for a few minutes, there were twenty male Chalkhill Blue Butterflies fluttering around but most of the butterflies were roosting under a cloudy sky, not being warm enough for them to venture out. 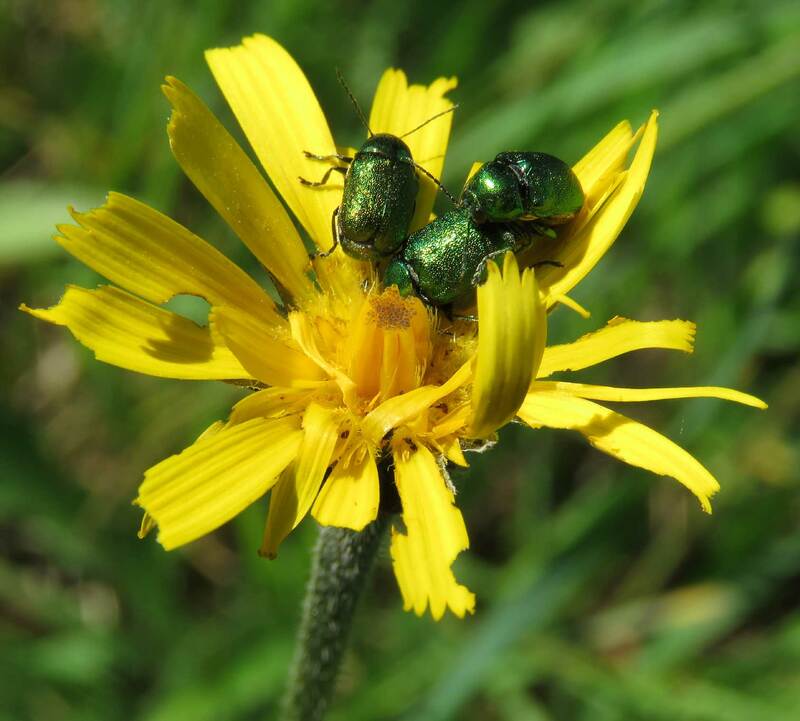 On one seeded Hawkbit there were four tattered males resting and the actual numbers must have been at least double those in flight. 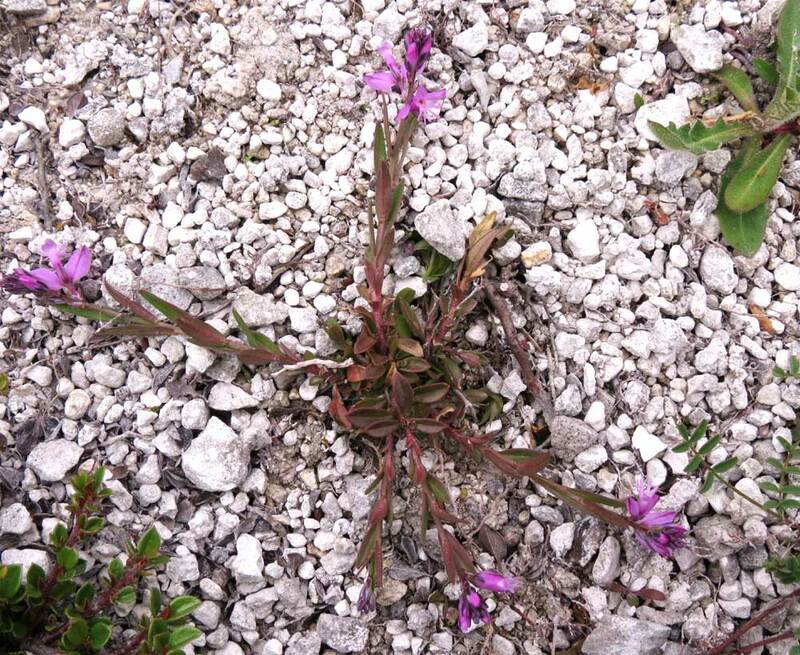 Mouse-eared hawkbit was evident by their leaves. 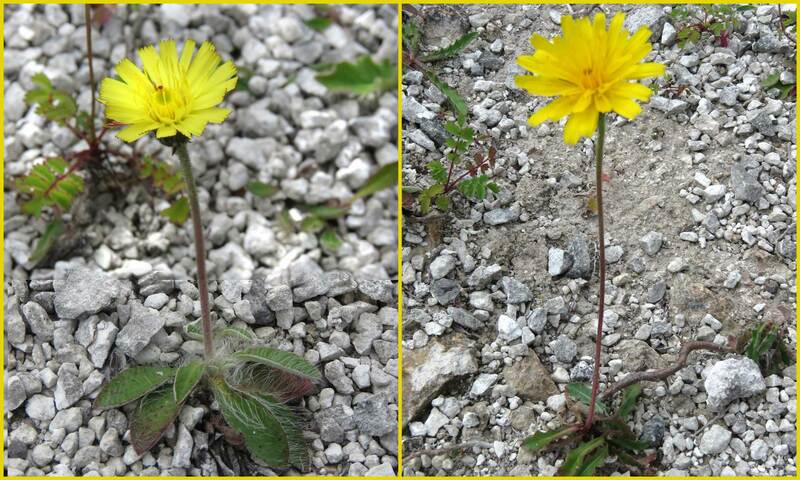 The other hawkbit with dandelion-like leaves were either Rough Hawkbit or Autumnal Hawkbit, or both. There was a Large White Butterfly on the Waterworks Road and a Red Admiral in the Butterfly Copse. A few Gatekeepers were seen around the Ivy and one in Frampton's Field. Too cool (17.5 °C ) for butterflies to be in flight (a Gatekeeper was observed hiding in the Ivy) and too breezy (Force 5 gusting to Force 6) for flower photography, with black clouds that filled the sky over Mill Hill and to the north, I nevertheless ventured out to the outskirts of Old Shoreham where there was a few inevitable Large Whites blown about in the mid-to-late afternoon Moderate Breeze, a handful of Gatekeepers were disturbed and three Red Admirals advertised their presence. A trip up the Pixie Path led to a brief visit to Mill Hill Cutting when for a few minutes the sun shone through a gap in the clouds. 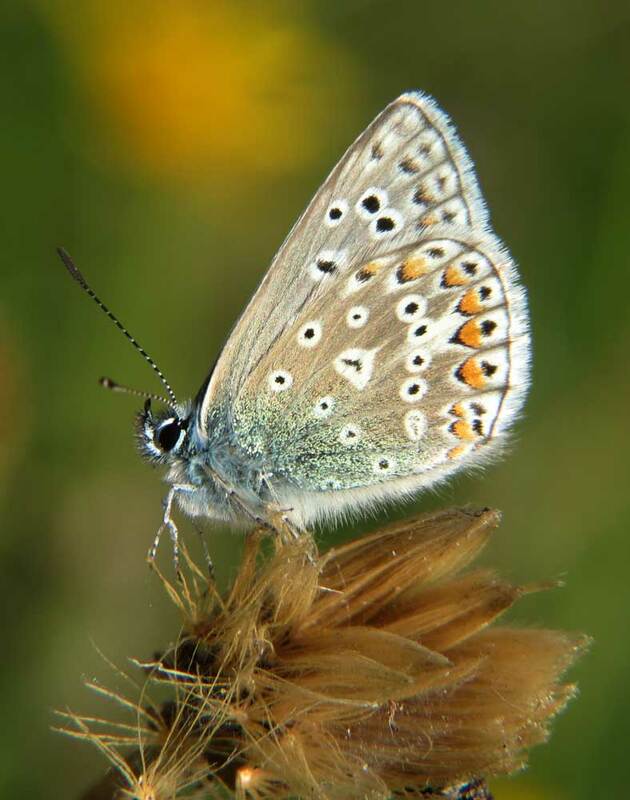 In this large garden plot sized habitat, the Cotoneaster-covered chalk bank was covered in fluttering blue butterflies, too intermingled to count, but at least 25 blue male Chalkhill Blues were seen in flight simultaneously and one female was spotted. 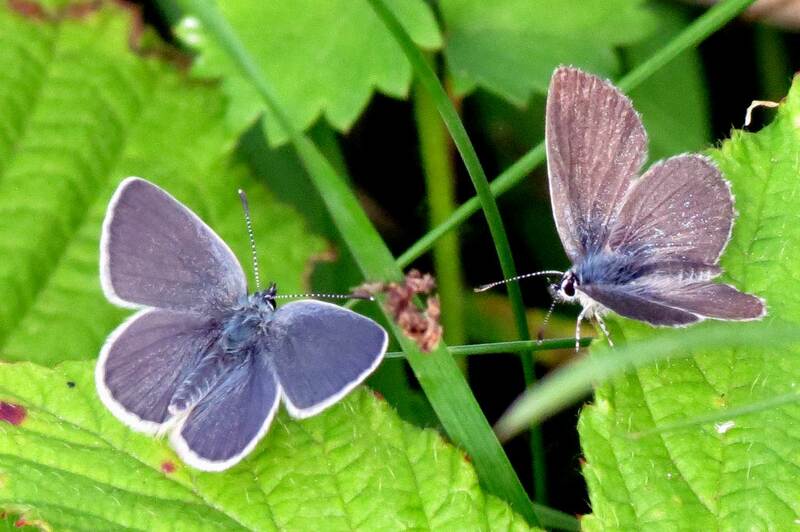 Most of Chalkhill Blues were fresh but there were at least two worn and faded males. 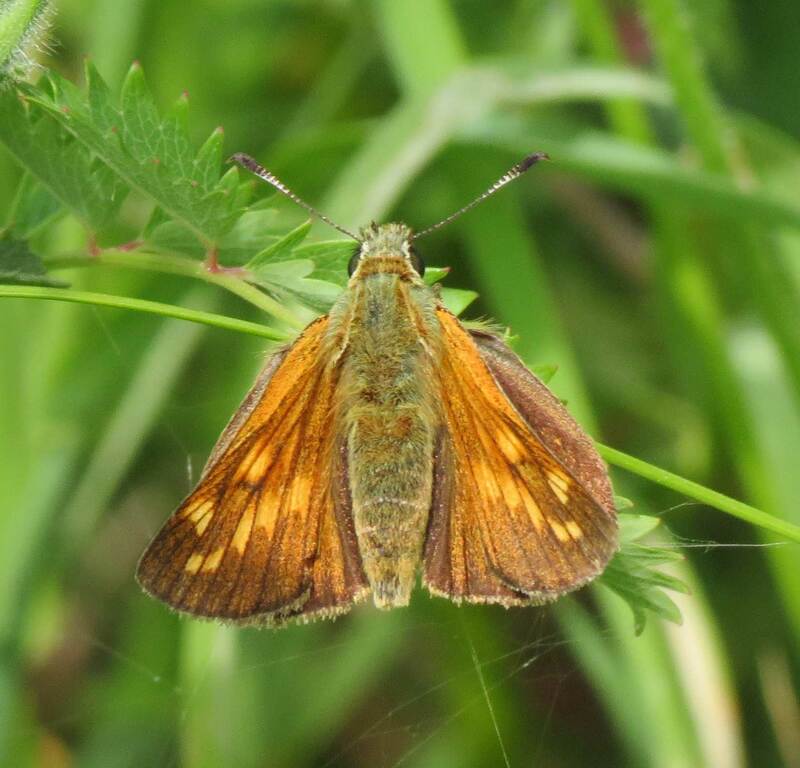 They were accompanied by two Small Skippers and a solitary fresh male Common Blue Butterfly. I dislodged a Yellow Shell Moth. The rain held off under an overcast sky. 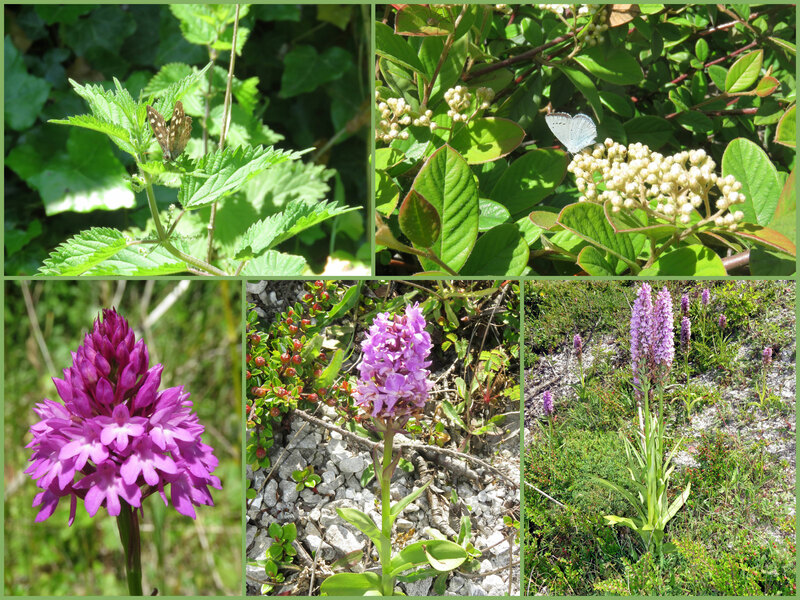 I made a brief detour to the southern bank of the Slonk Hill Cutting, where immediately the first of a few Marbled White Butterflies fluttered around the fading Common Spotted Orchids. Then the first of a few Meadow Browns appeared, but it was a few minutes before I saw my first Ringlet Butterflies of the year. Over dozen of these butterflies flew languidly amongst the orchids in the meadow-like embankment; the longer I stayed the more that appeared. 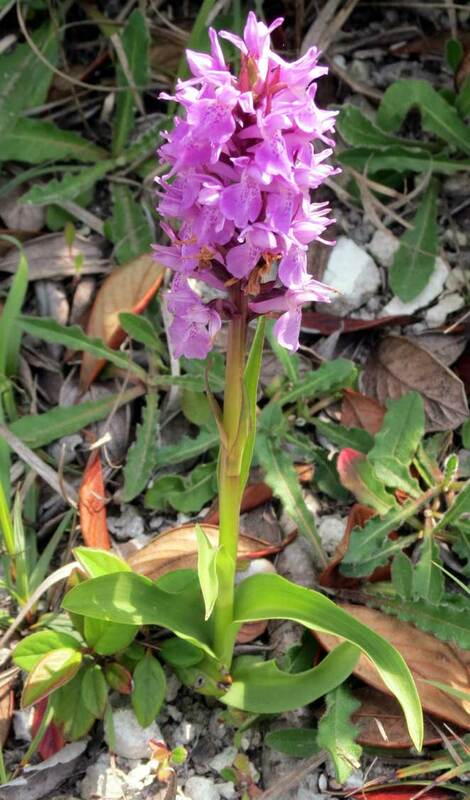 Pyramidal Orchids were frequently seen in almost full flower but there did not seem to be as many as them as usual. 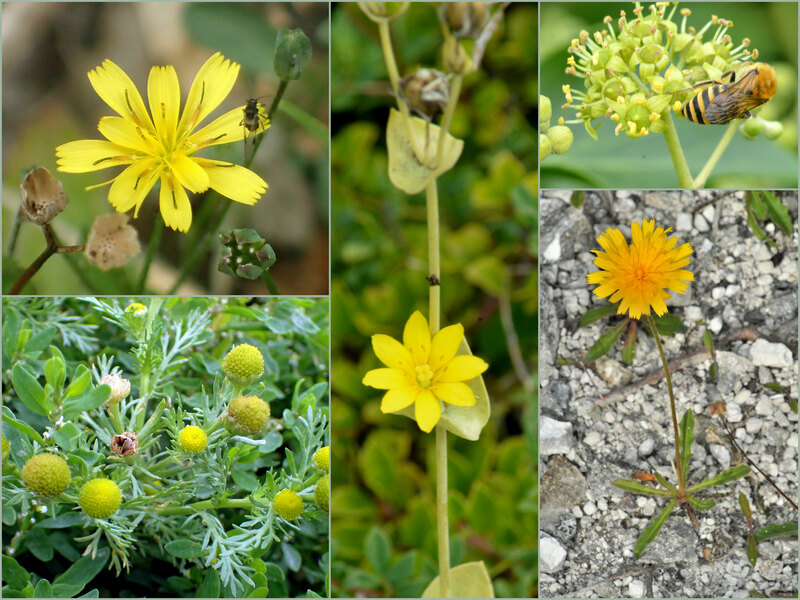 Yellow Wort was present with their flowers opened just before midday. A flash of red and my first Cinnabar Mothof the year flitted into some Cotoneaster on Spotted Orchid swathed southern bank of the Slonk Hill Cutting and completely disappeared. Later in the late afternoon, my first Meadow Brown Butterfly of the year also made an appearance fluttering strongly over the southern bank of the Buckingham Cutting. After a period of awful weather a break in the gales and heavy rain was a day to get out. 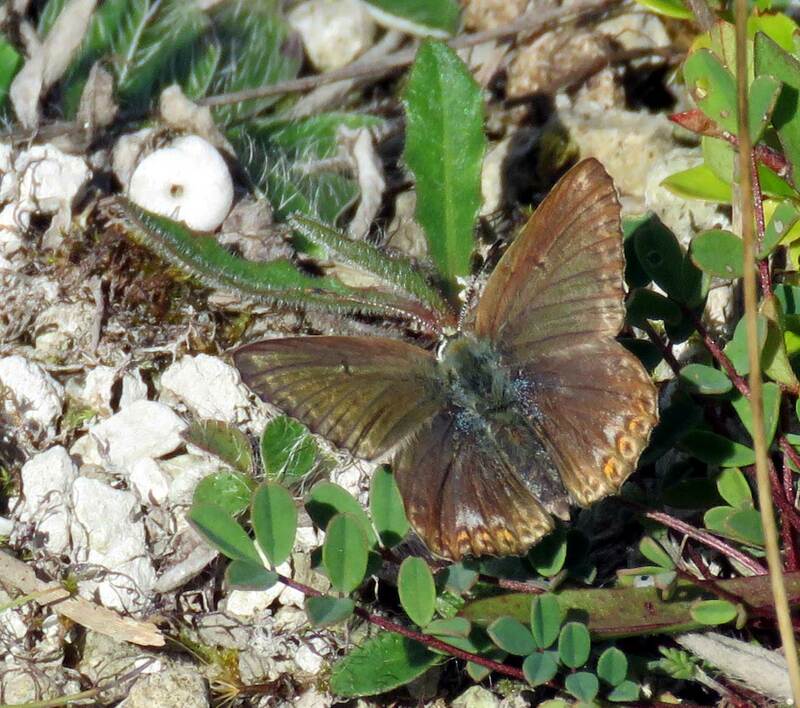 A Speckled Wood was so familiar at the top of The Drive, north Shoreham, that I almost did not note it. 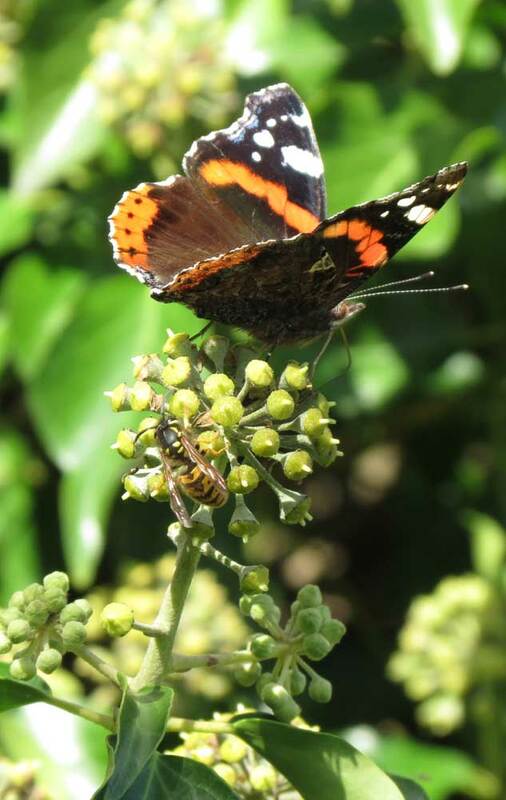 There was Large White and a courting pair of Red Admirals as well. 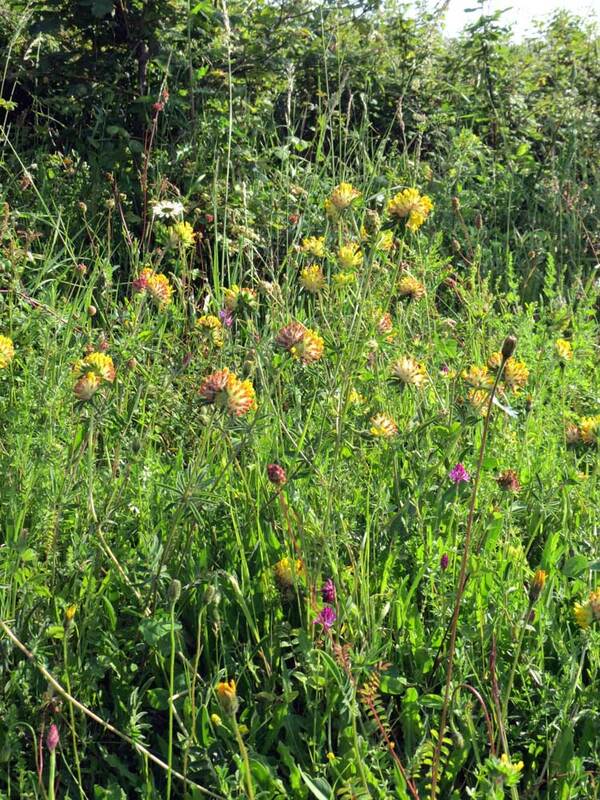 On the southern bank of Buckingham Cutting, at least twenty tiny Small Blue Butterflies fluttered around the Kidney Vetch in the afternoon. 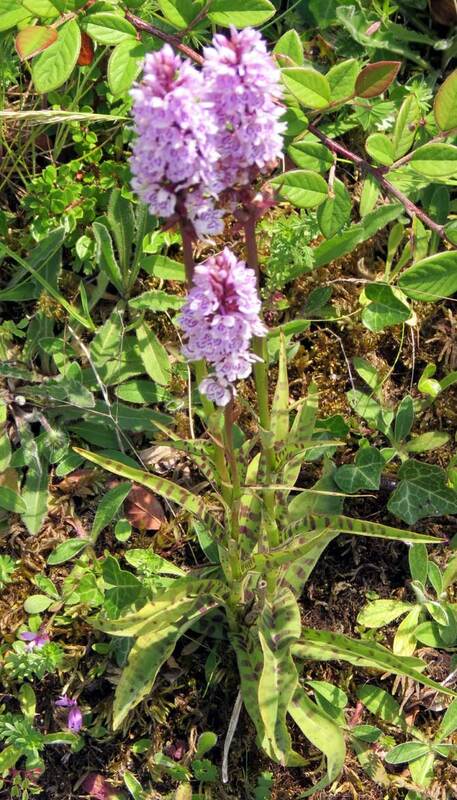 Pyramidal Orchids were budding and one was beginning to flower on Buckingham Cutting (south). Dawn was sunny but the sky filled with clouds before middayand the butterflies went into hiding. 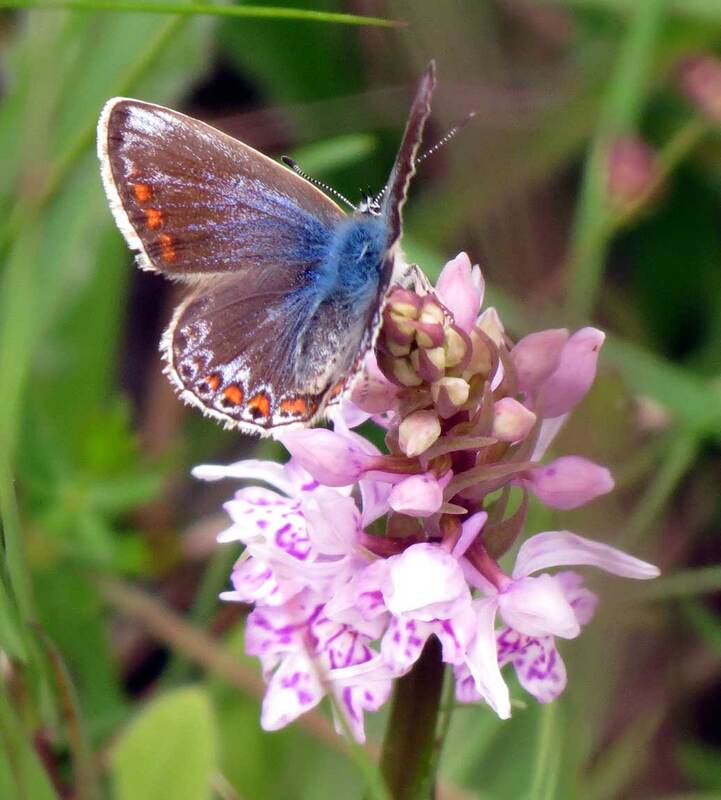 It needed a careful look to spot the first of the tiny Small Blue Butterflies this year, amongst the flowering Kidney Vetch on the southern bank of the Buckingham Cutting, where the Spotted Orchids were beginning to flower. 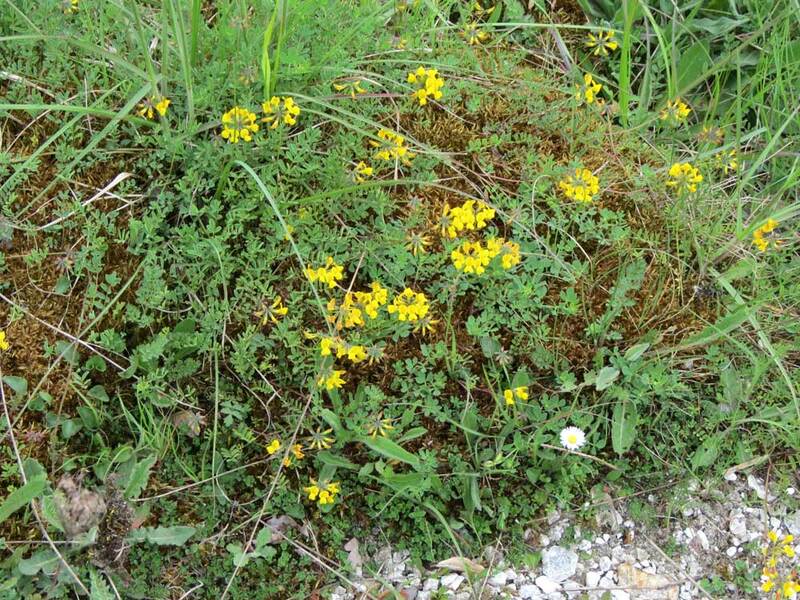 Horseshoe Vetch, Hippocrepis comosa, flowering on the northern (south-facing) bank of the Slonk Hill Cutting. Despite being less than a mile away from Mill Hill, this area has not been colonised by a single Chalkhill Blue Butterfly. 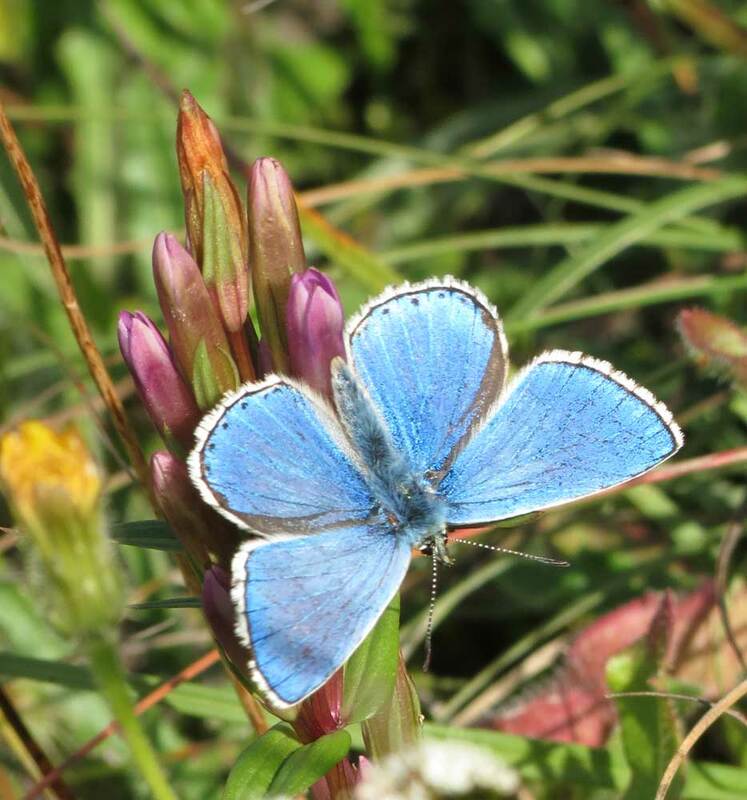 It does support a handful (perhaps more) of Adonis Blue Butterflies and the bank supports or hosts all the common species of butterfly seen in Shoreham and the downs nearby. 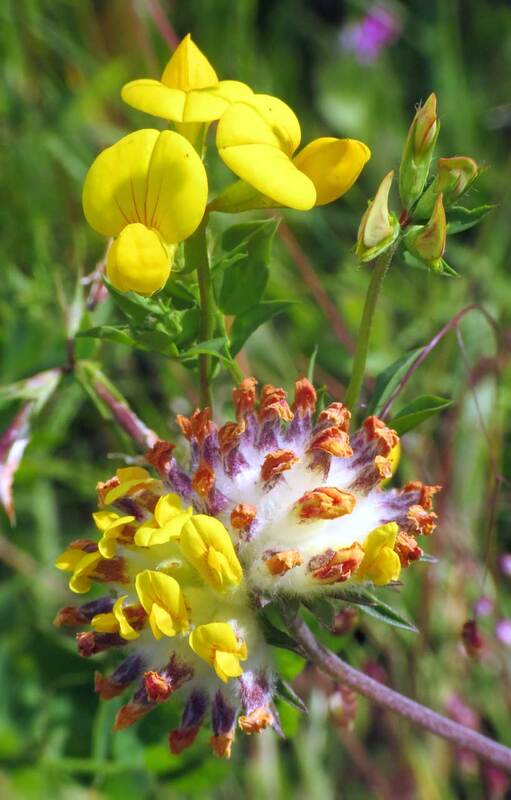 The weather for the whole of the Horseshoe Vetch flowering period has been extremely poor with rain almost every day. At the top of the Pixie Path (by the hedge, the only part visited) the bright yellow of my first Brimstone Butterfly of the year was unmissable as the first of the Peacock Butterflies fluttered around. On my return from a full visit to Mill Hill I noted my first Speckled Wood Butterfly of the year at the top of Chanctonbury Drive. There was just a single Primrose growing wild on the edge of the Pixie Path (hedge section at the top) but plenty of them growing on grass verges on the chalky parts of town (Mill Hill Drive/Erringham Road). A Red-tailed Bumblebee, Bombus lapidarius, lay upside down on the path.